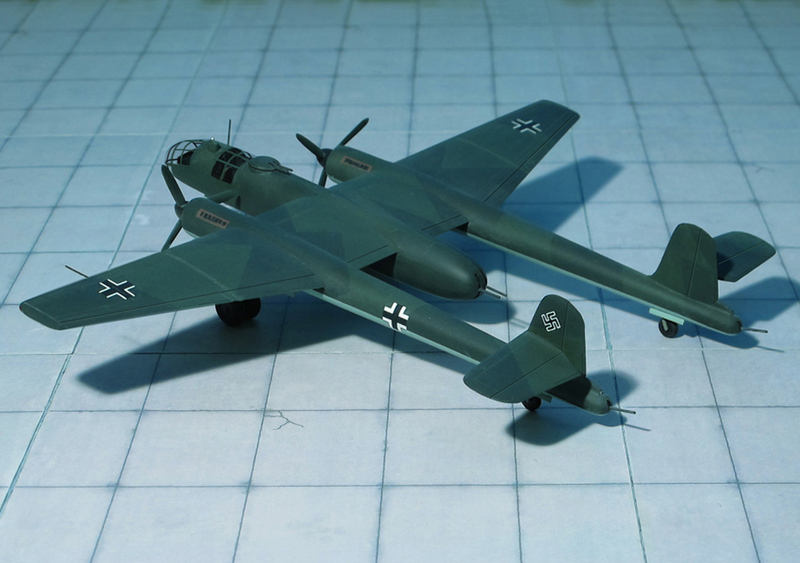 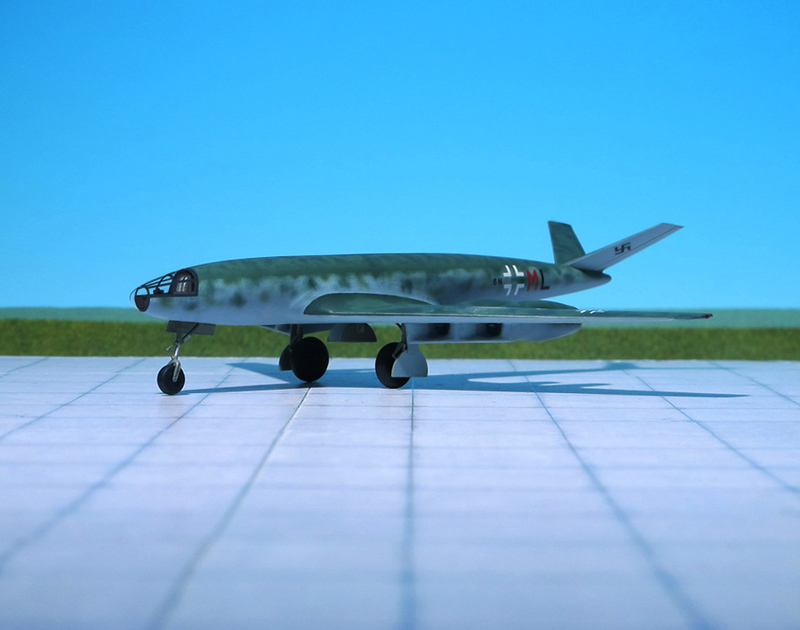 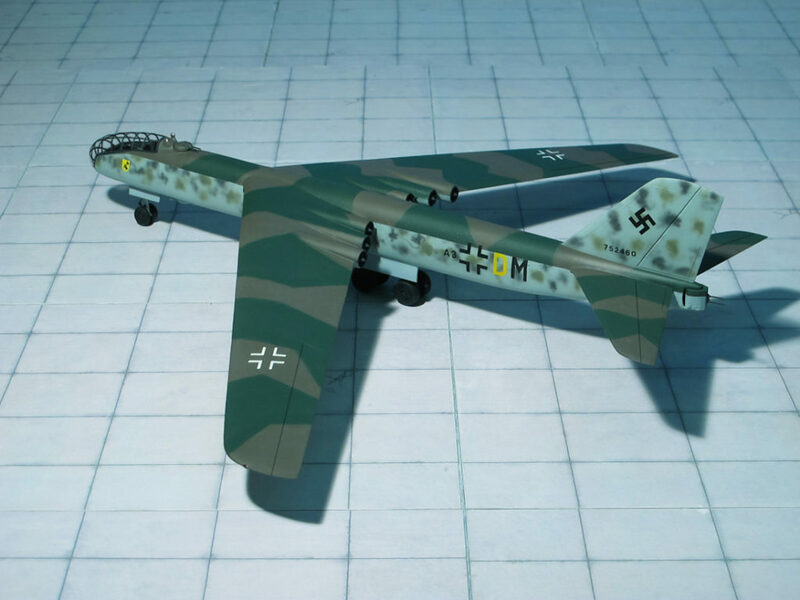 COMMENT: The Junkers EF 132 was one of the last aircraft project developments undertaken by Junkers in WWII, and was the culmination of the Junkers Ju 287 design started in 1942. 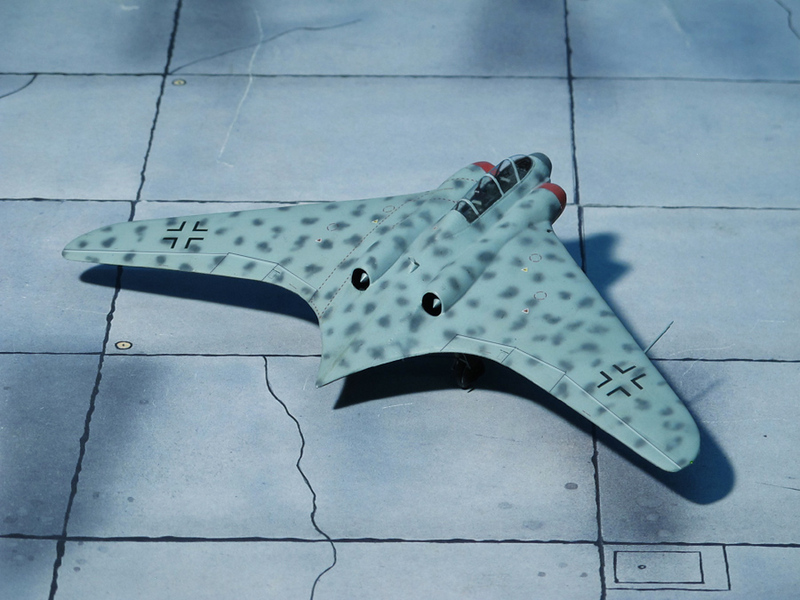 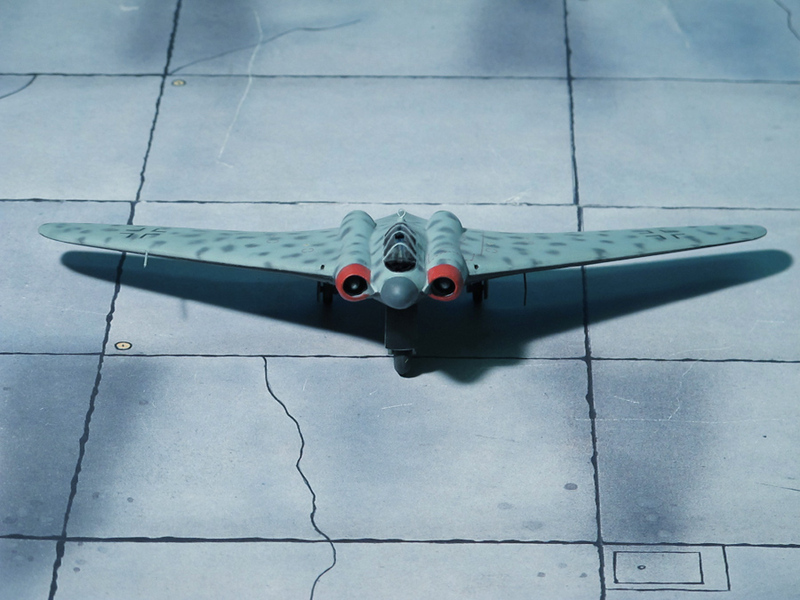 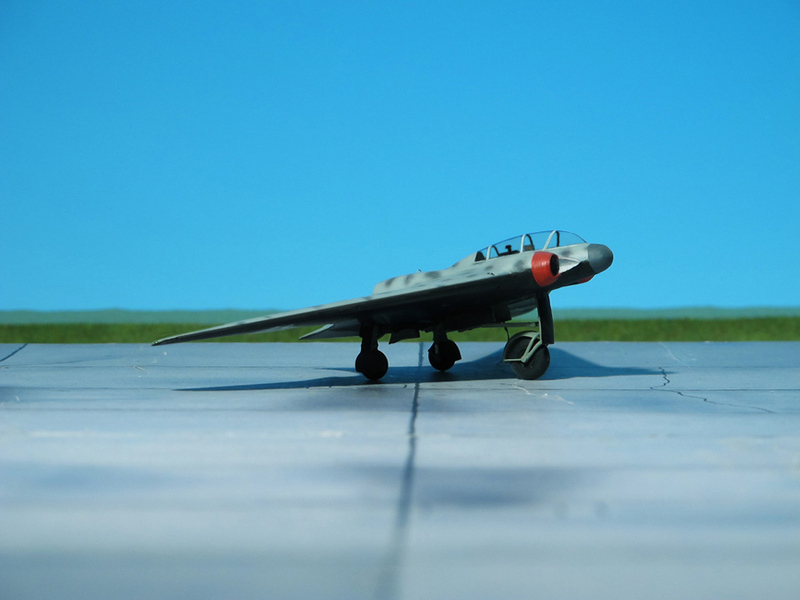 The shoulder-mounted wings were swept back at a 35 degree angle and featured a small amount of anhedral. 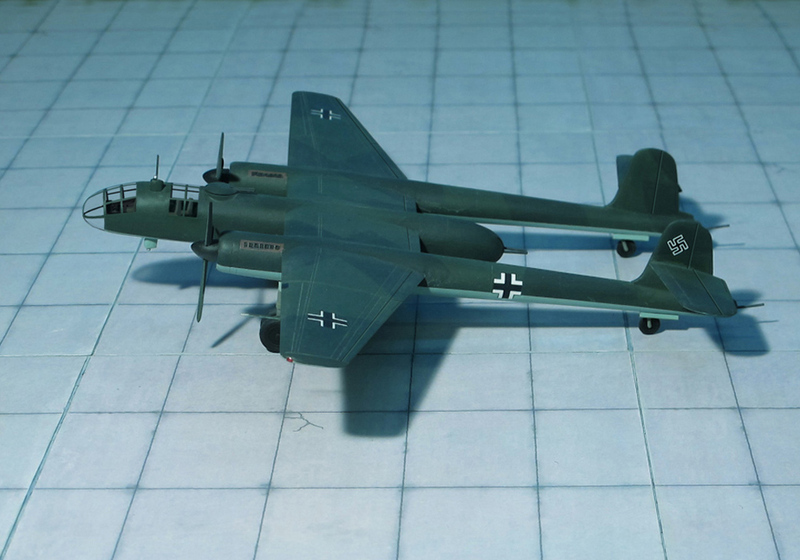 Six Junkers Jumo 012 jet engines, each of which developed 2,500 kp of thrust, were buried in the wing roots. 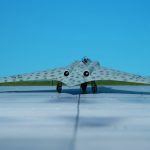 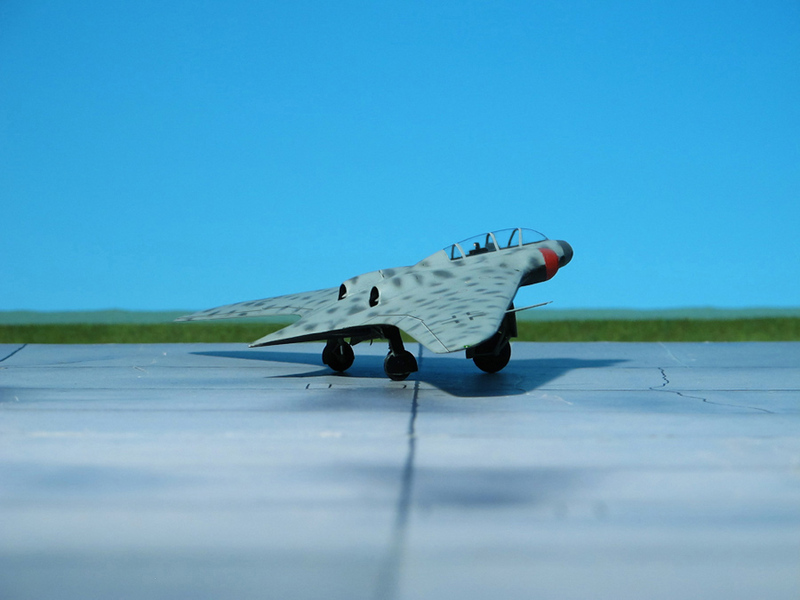 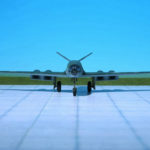 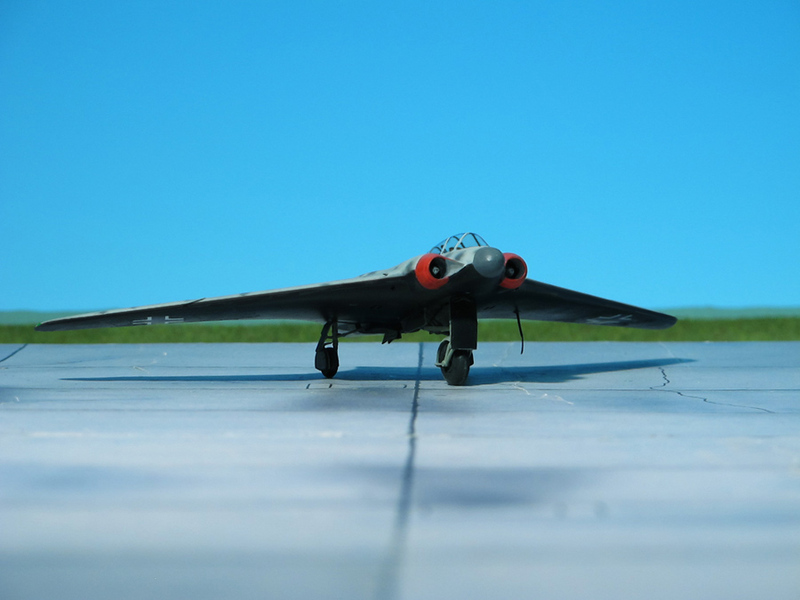 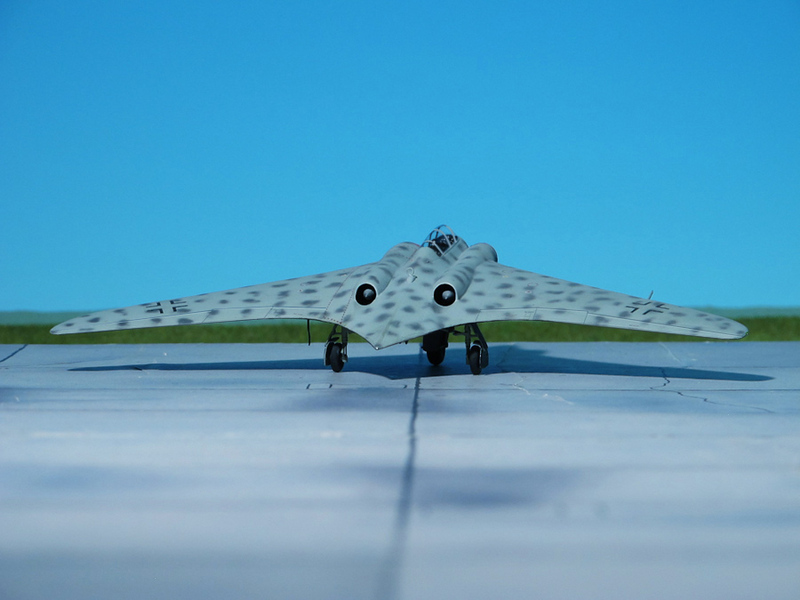 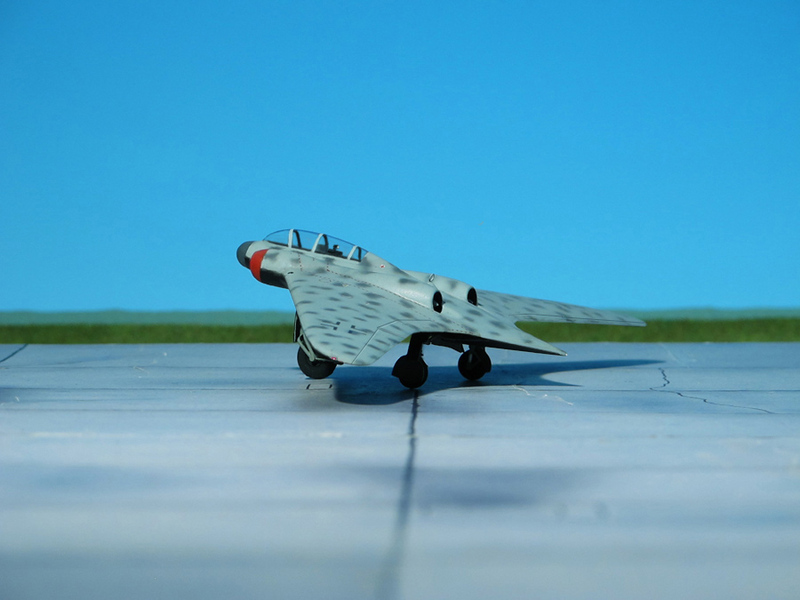 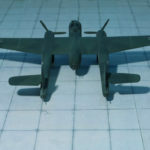 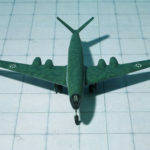 Wind tunnel results showed the advantages of having the engines within the wing, rather than causing drag by being mounted below the wing surfaces. 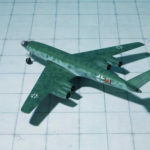 Several wooden mockups were built of the wing sections, in order to find the best way to mount the engines without wasting too much space while at the same time providing maintenance accessibility. 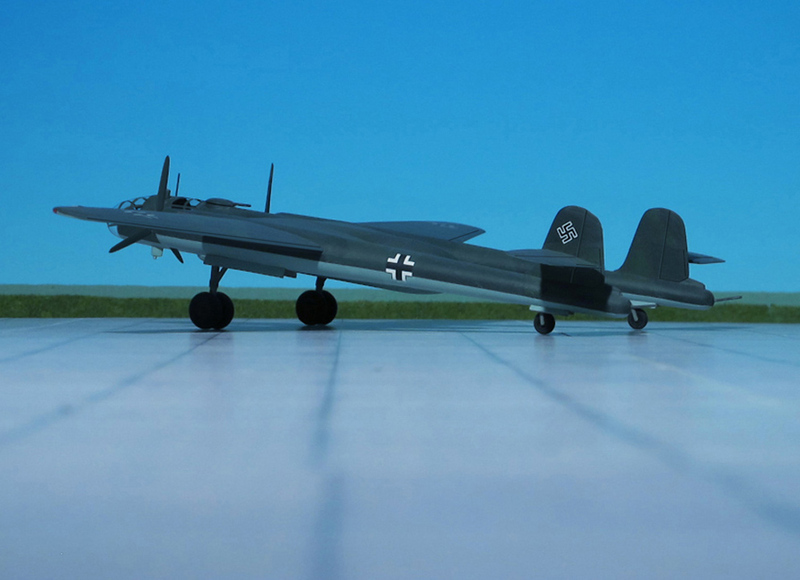 The landing flaps were designed to be split flaps, and the goal was to make the gearing and operation simple. 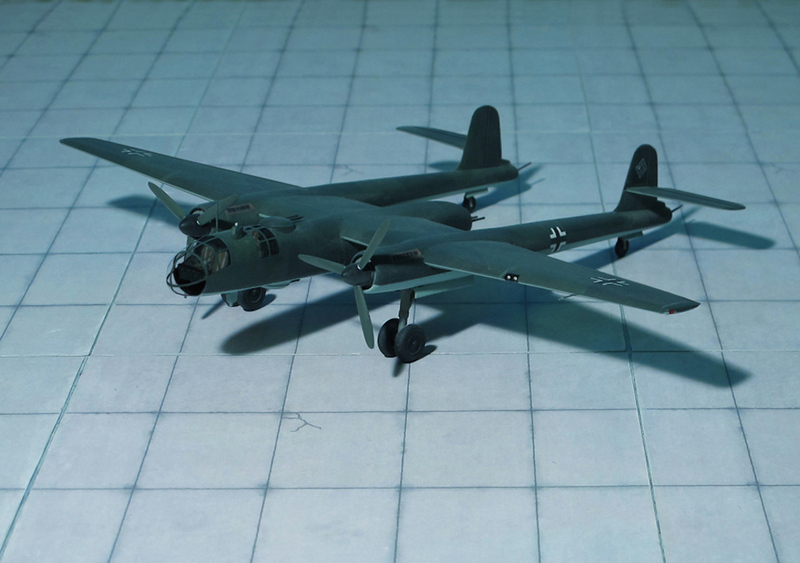 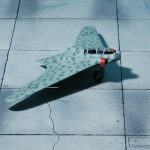 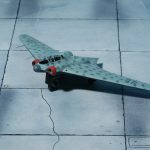 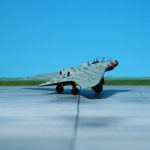 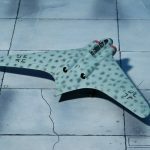 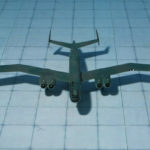 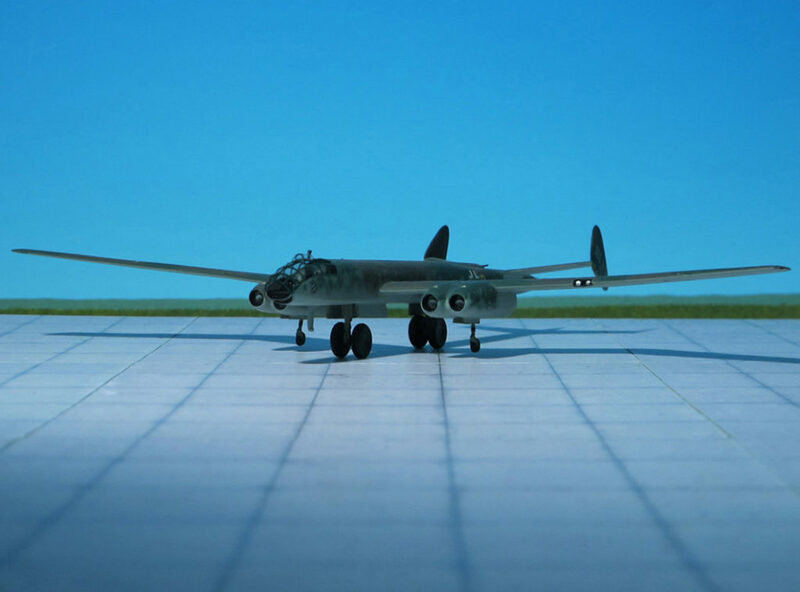 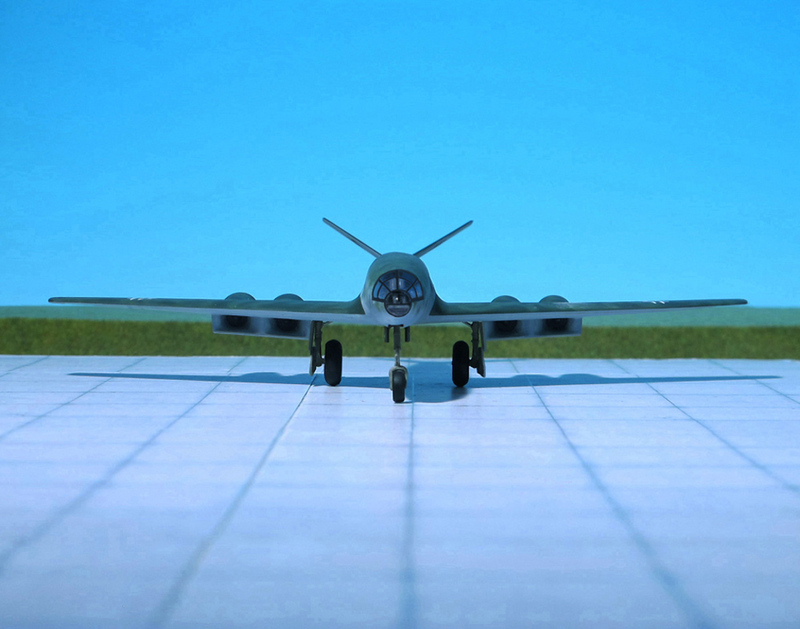 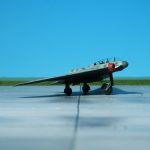 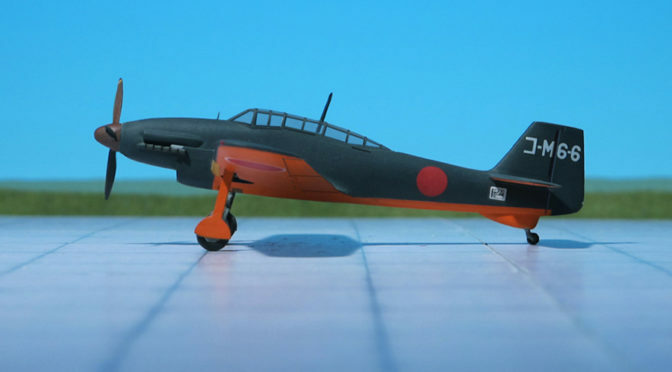 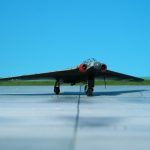 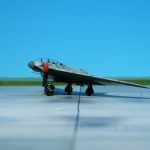 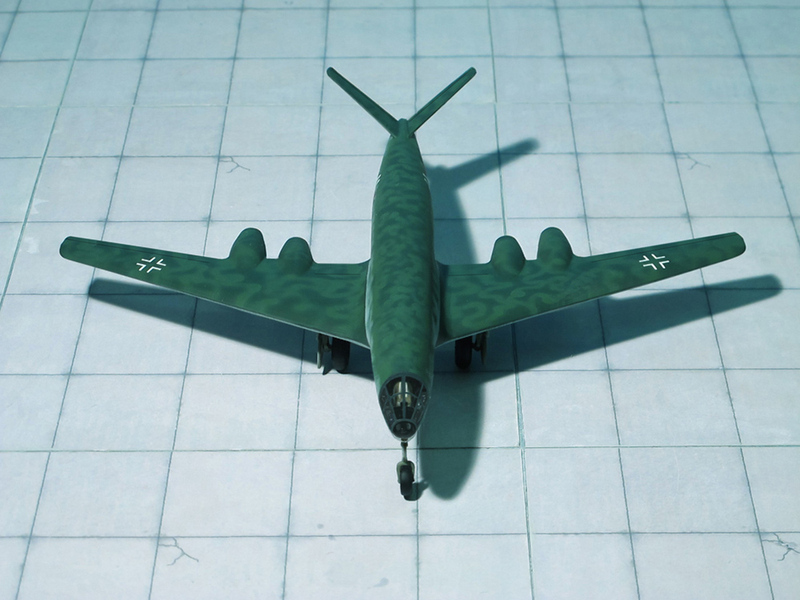 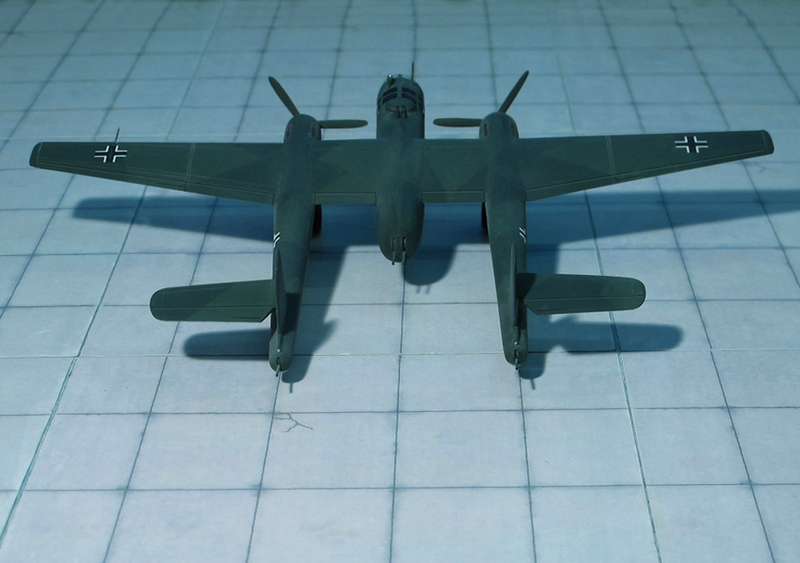 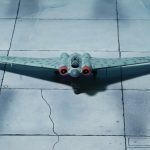 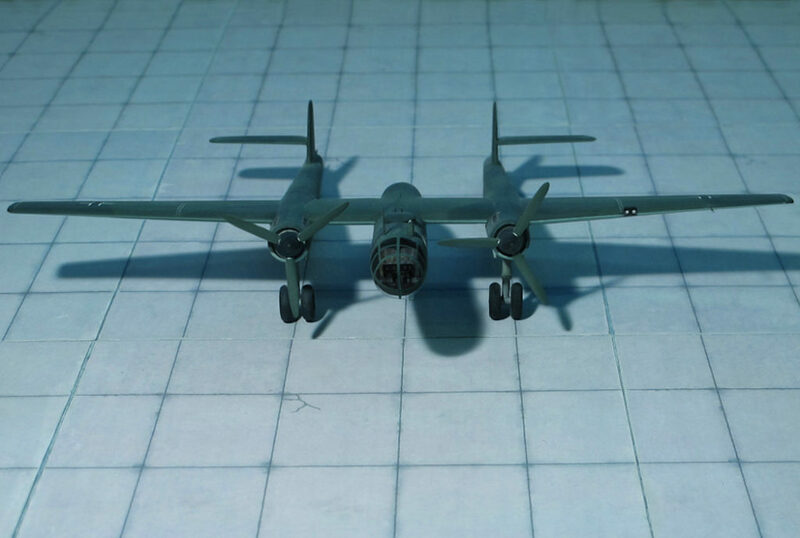 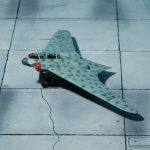 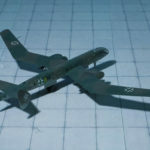 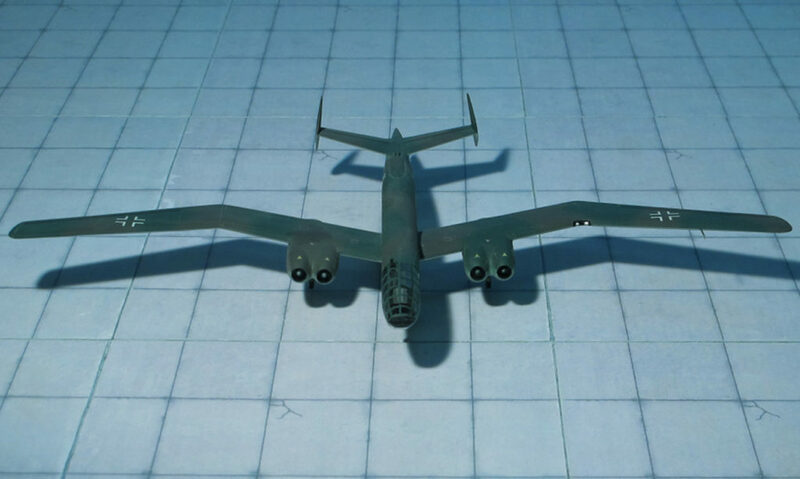 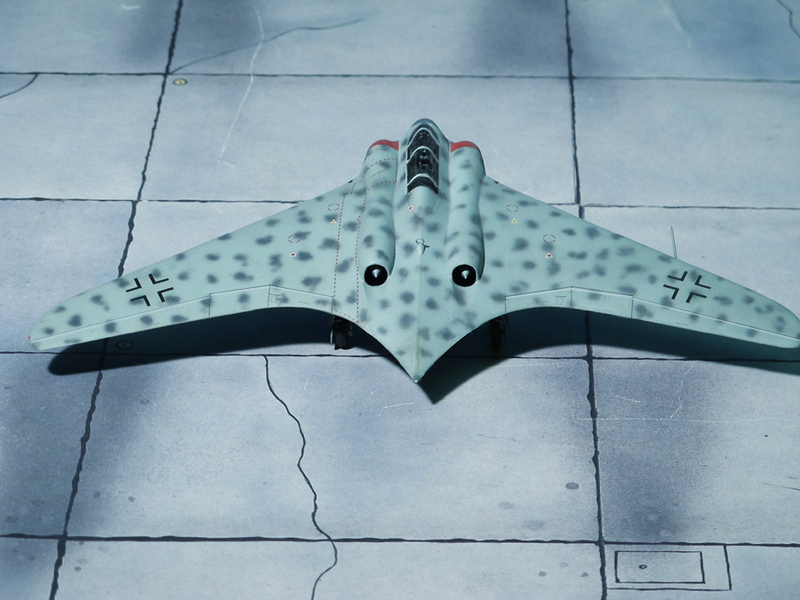 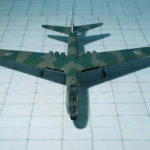 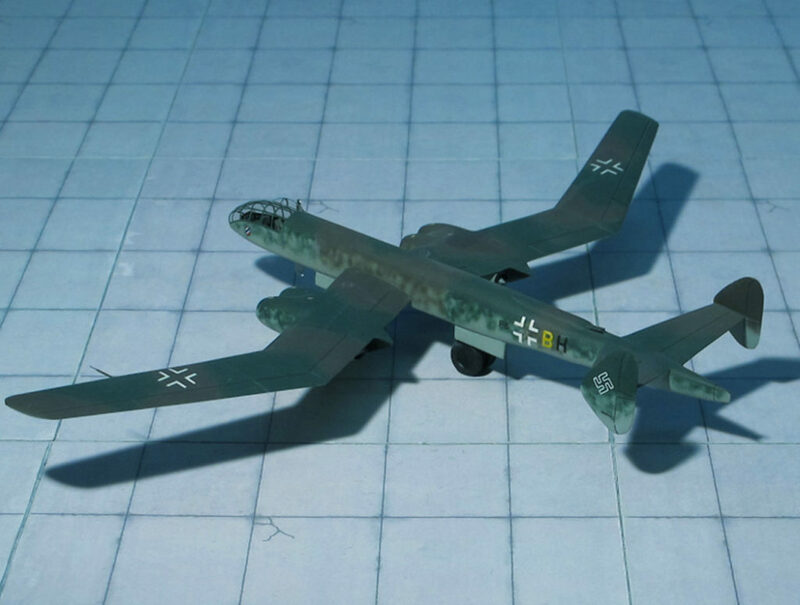 Because of the high placement of the wings to the fuselage, an unbroken bomb bay of 12 meters could be utilized in the center fuselage. 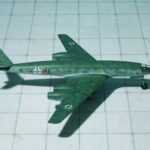 The tail plane was also swept back and the EF 132 had a normal vertical fin and rudder. 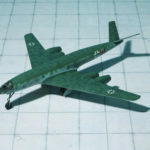 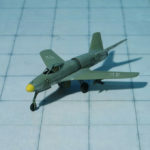 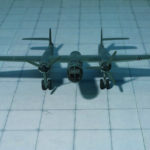 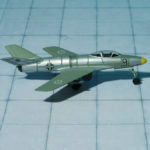 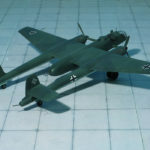 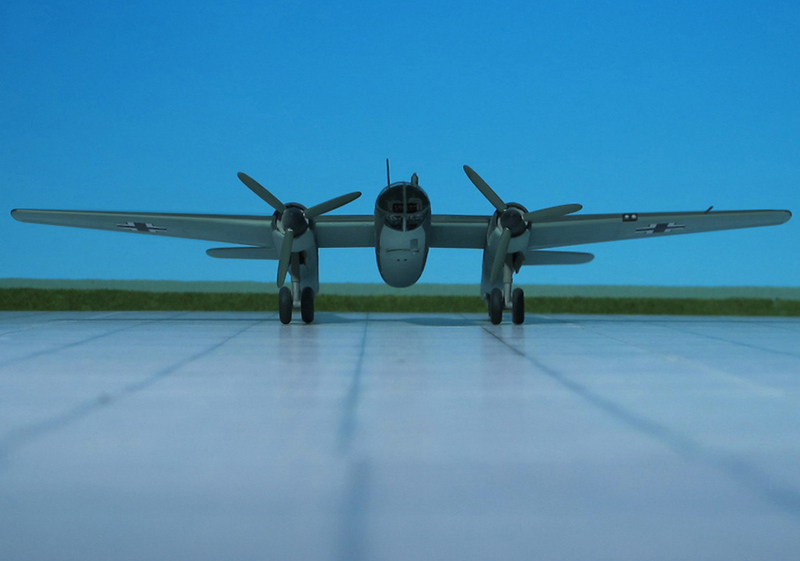 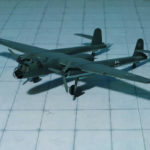 An interesting landing gear arrangement was planned, that consisted of a nose wheel, two tandem main wheels beneath the center rear fuselage, and outrigger-type wheels under each outer wing. 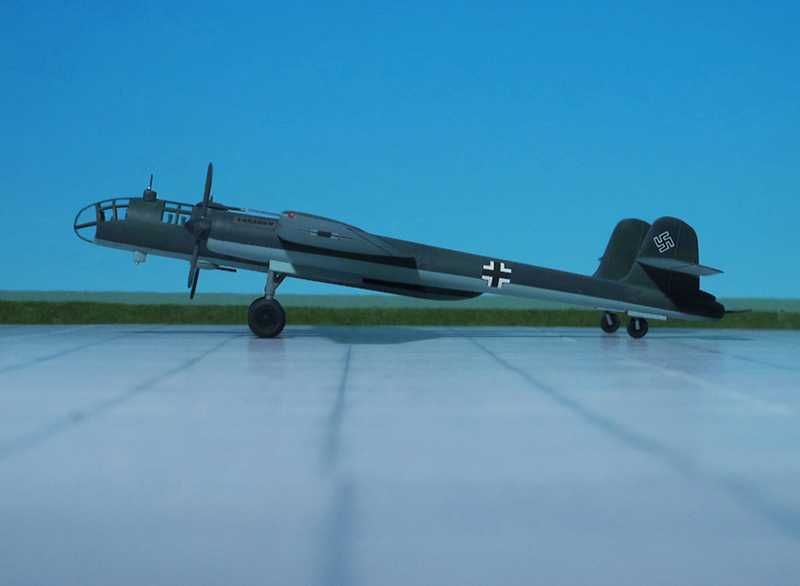 A fully glazed, pressurized cockpit located in the extreme fuselage nose held a crew of five. 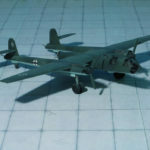 Armament consisted of two twin 20mm cannon turrets (one located aft of the cockpit, the other beneath the fuselage) and a tail turret containing another twin 20mm cannon. 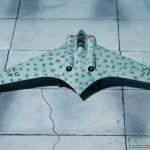 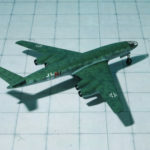 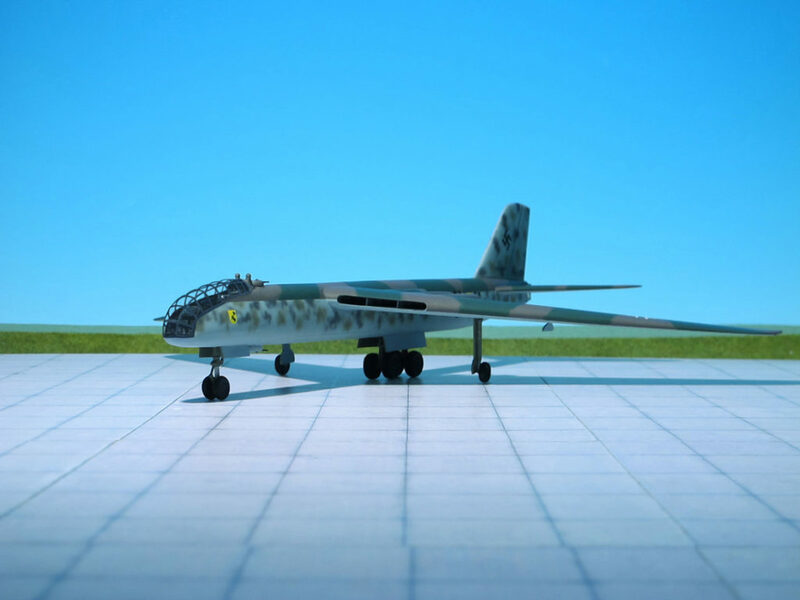 All of the defensive armaments were remotely controlled from the cockpit, and a bomb load of 4000-5000 kg was envisioned to be carried. 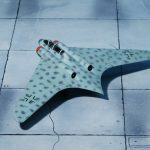 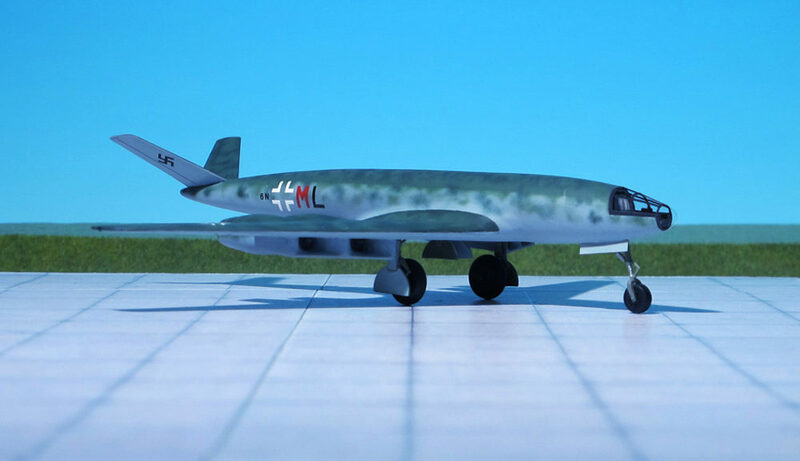 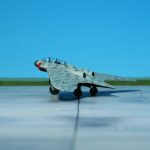 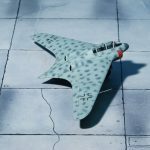 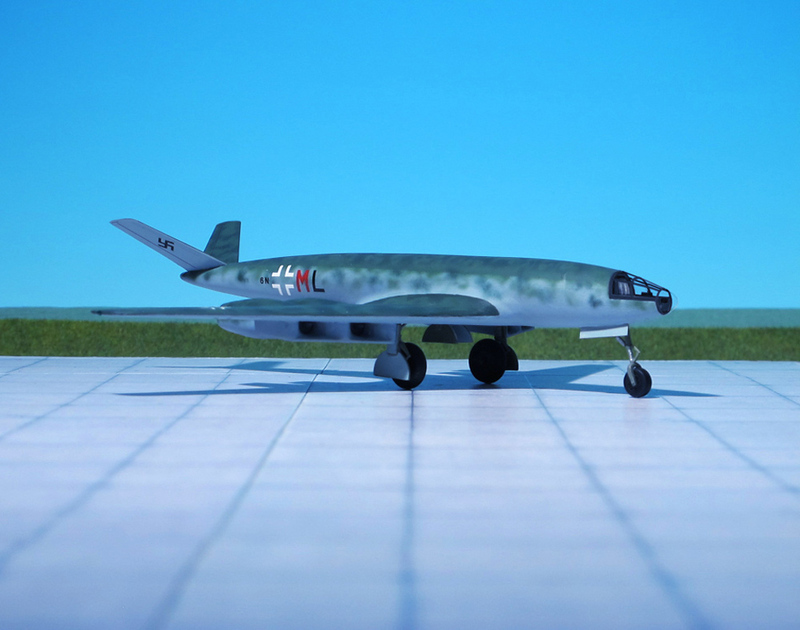 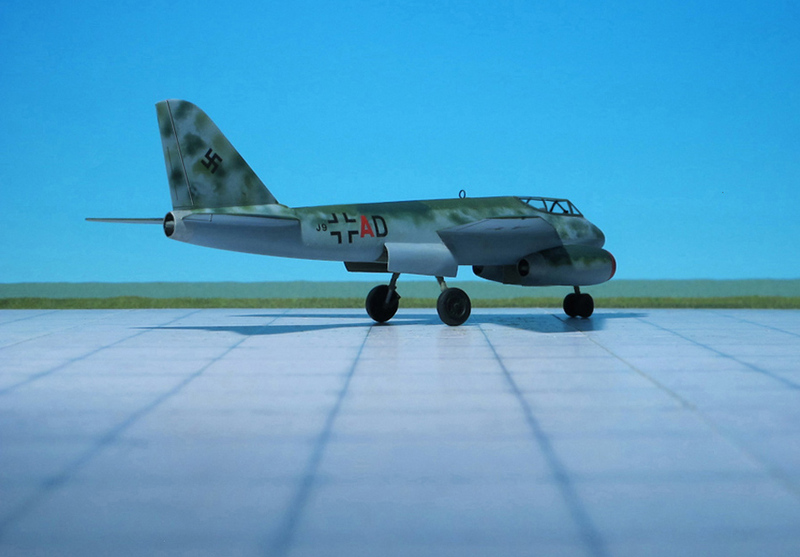 A wind tunnel model was tested in early 1945, and a 1:1 scale wooden mockup was also built at the Dessau Junkers facility to test the placement of various components, and also to check different air intake openings in the wing leading edge for the turbojet engines. 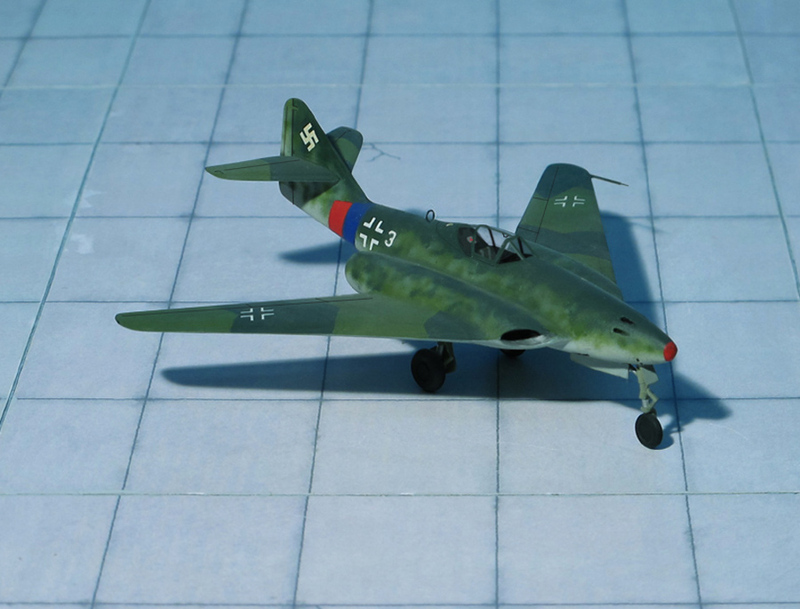 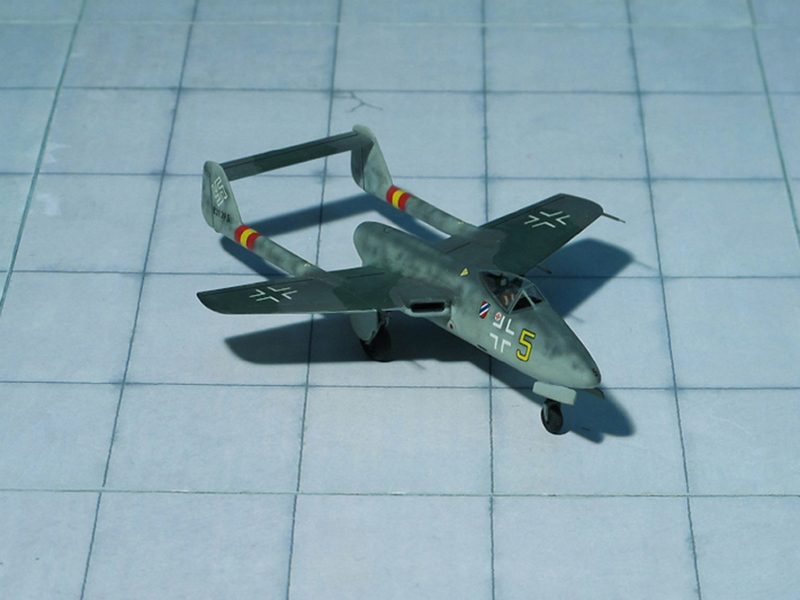 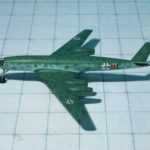 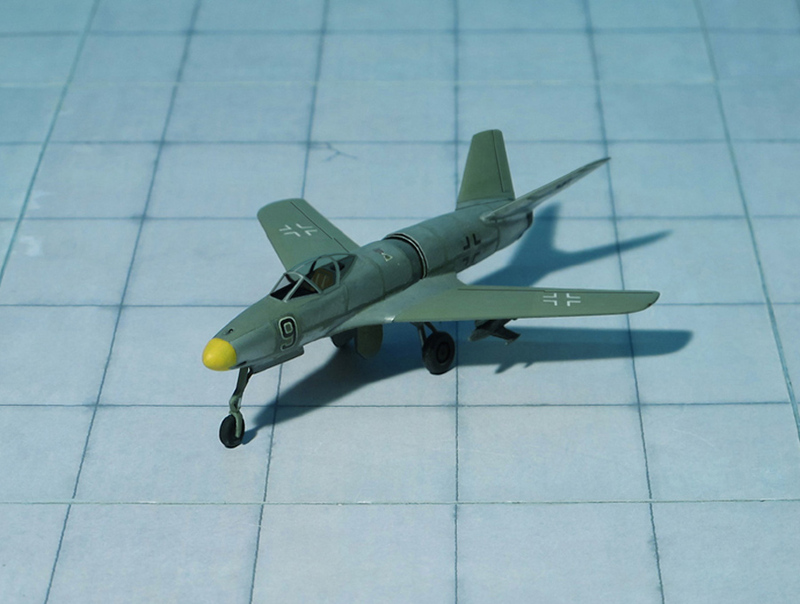 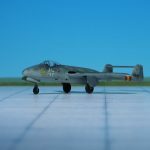 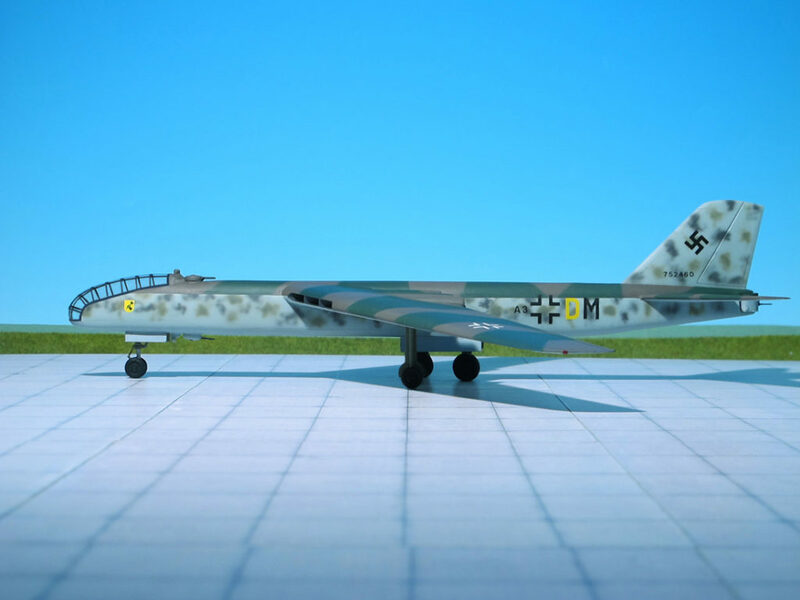 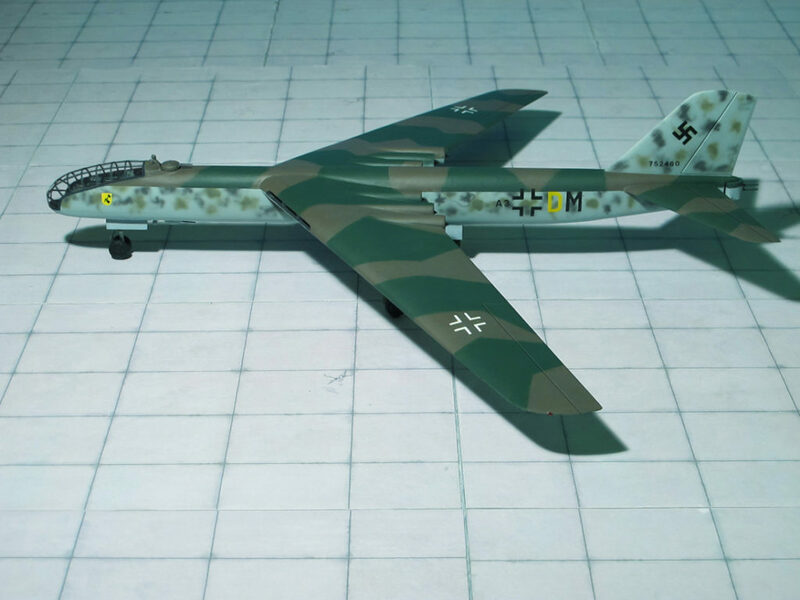 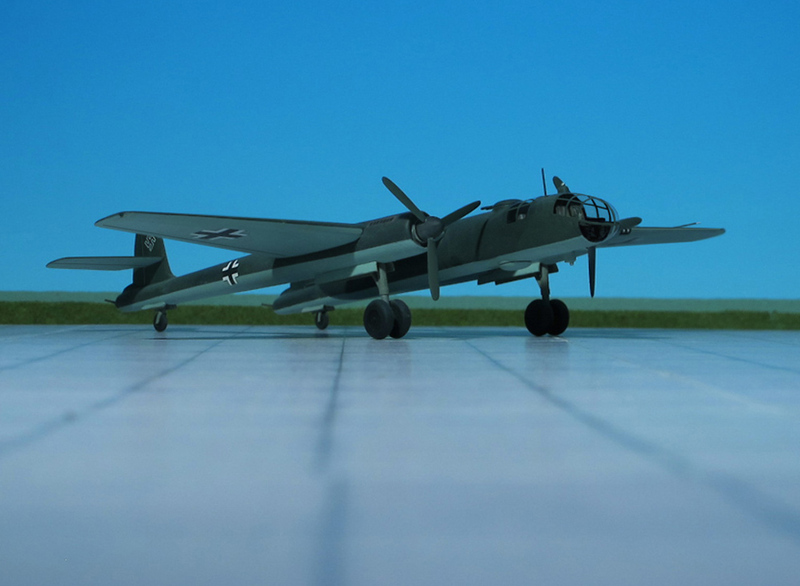 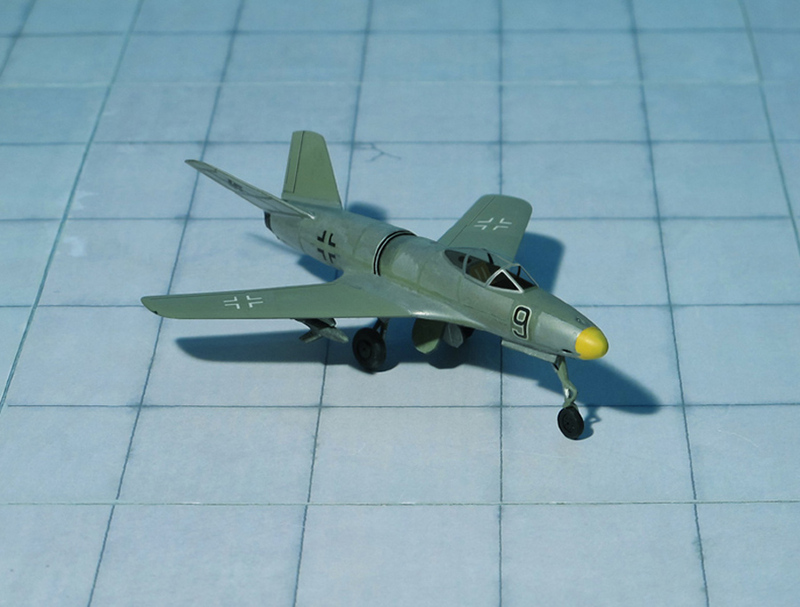 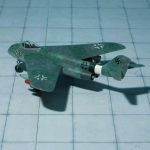 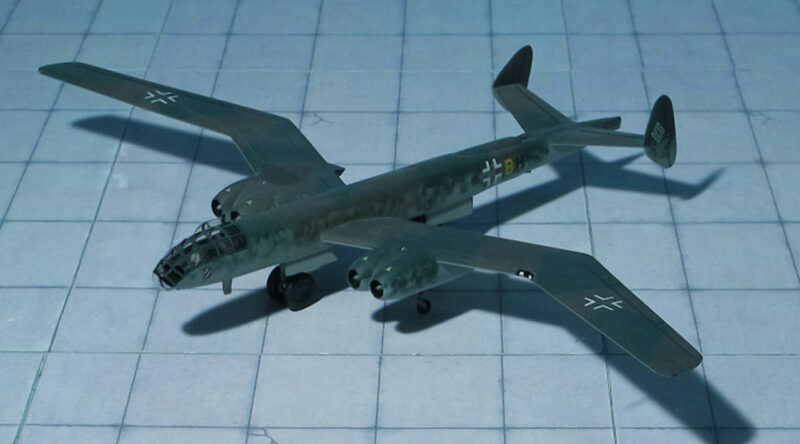 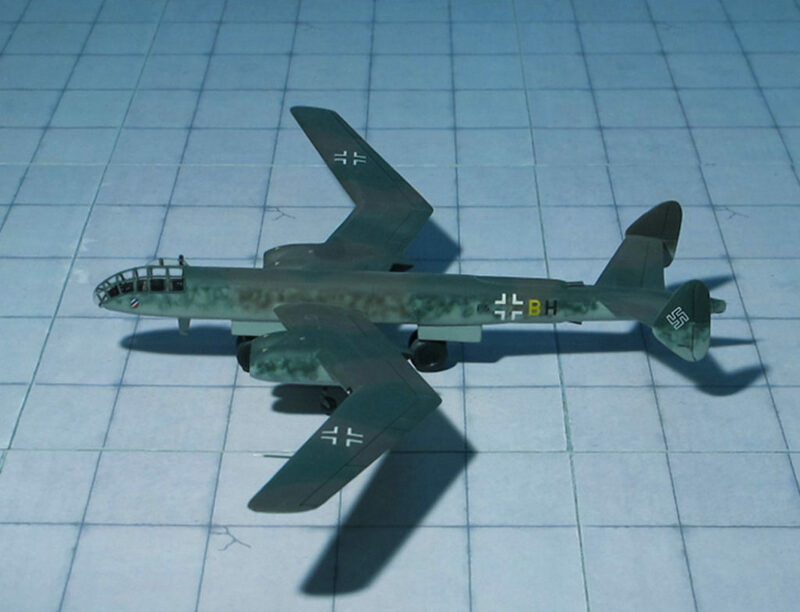 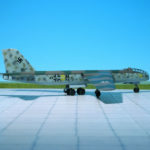 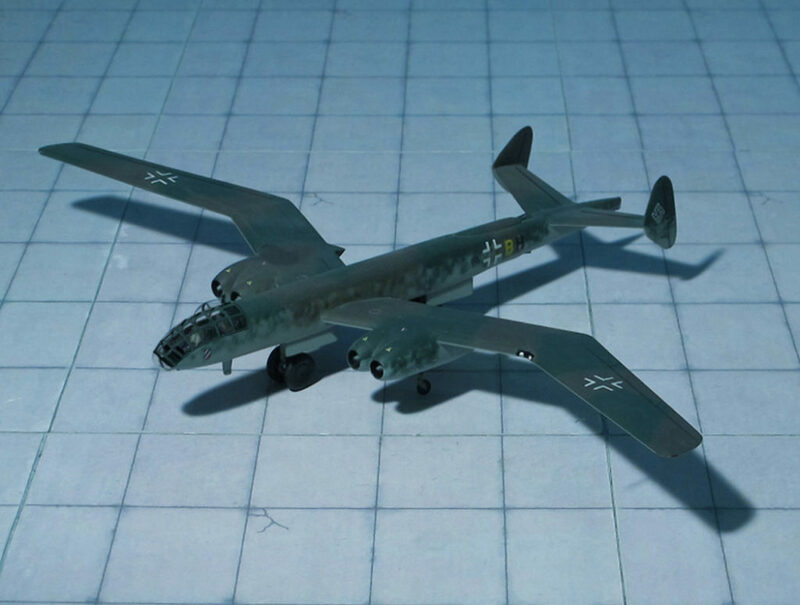 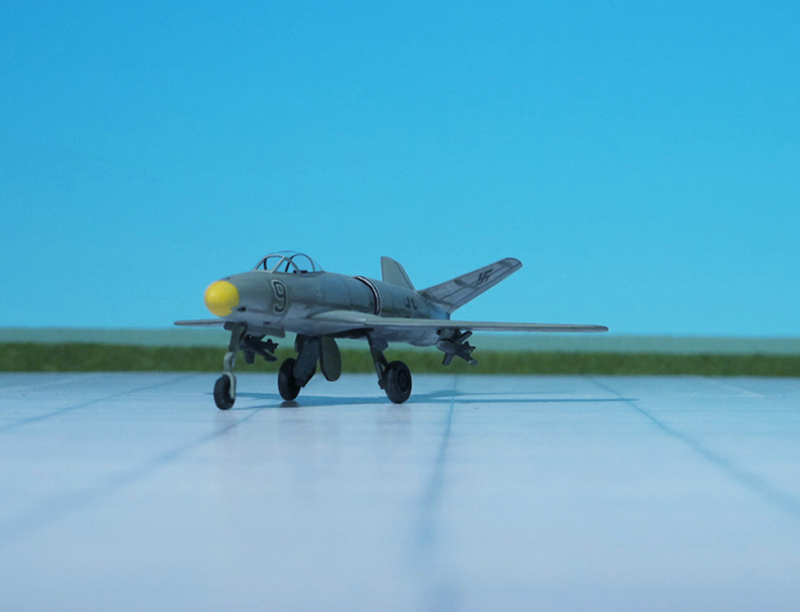 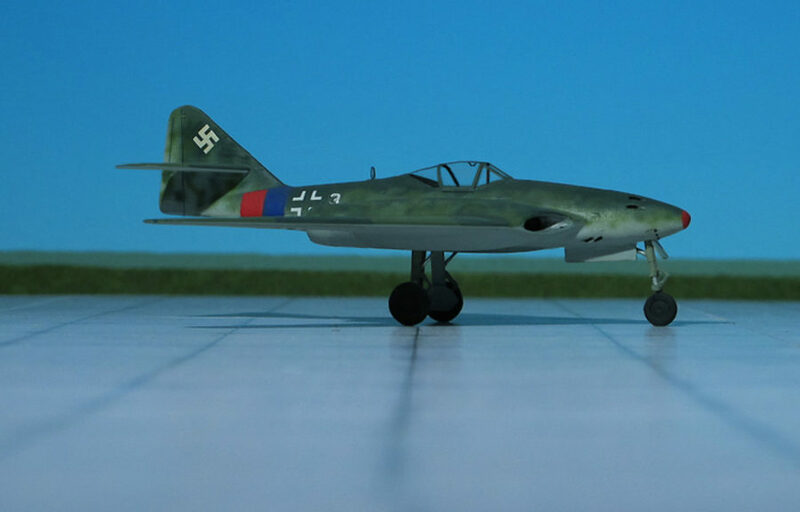 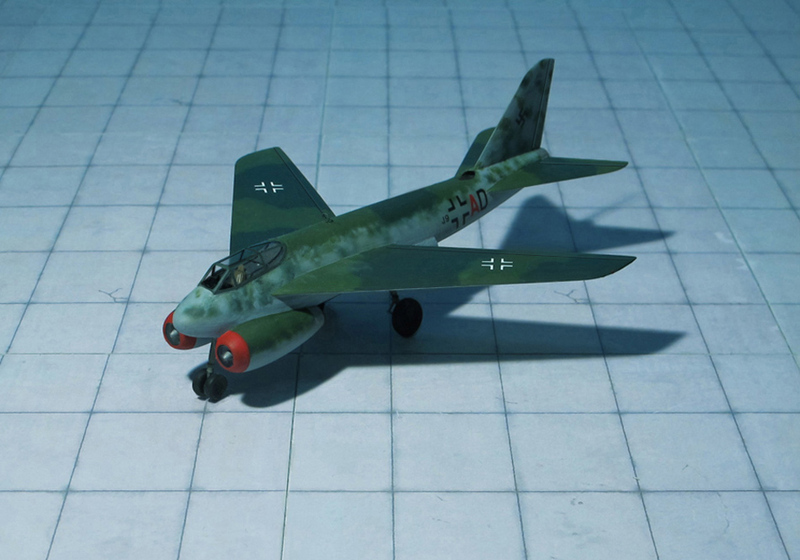 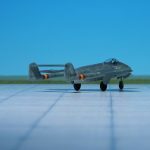 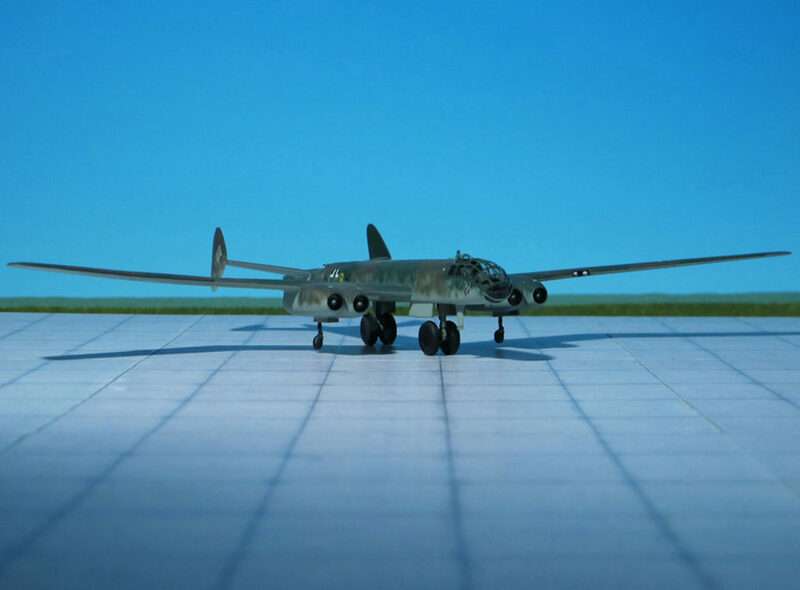 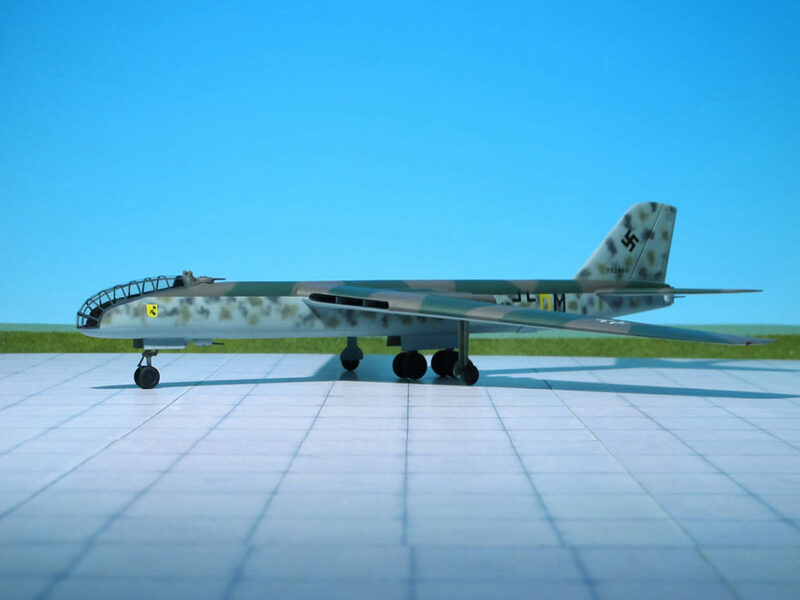 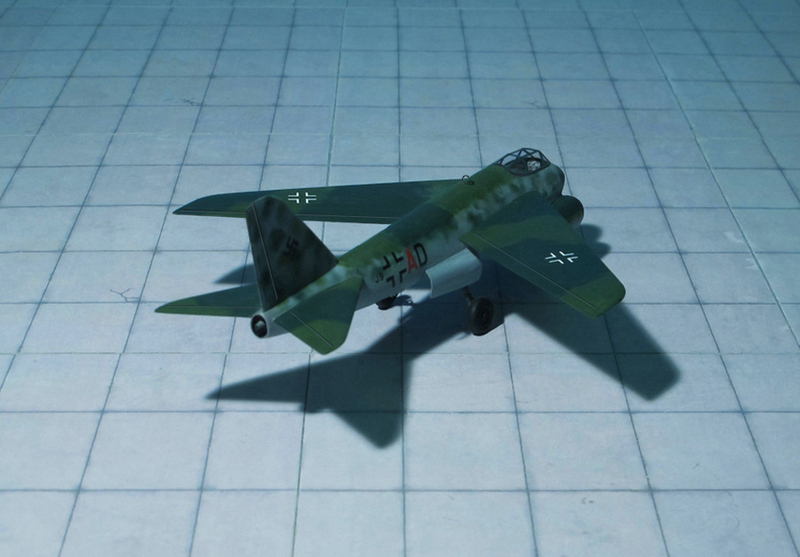 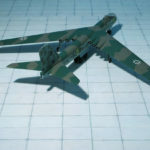 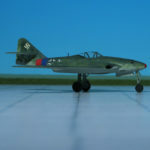 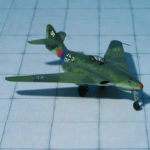 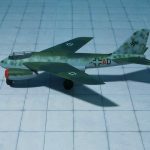 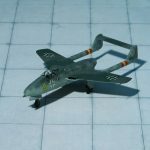 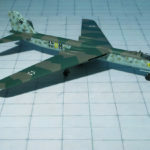 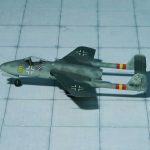 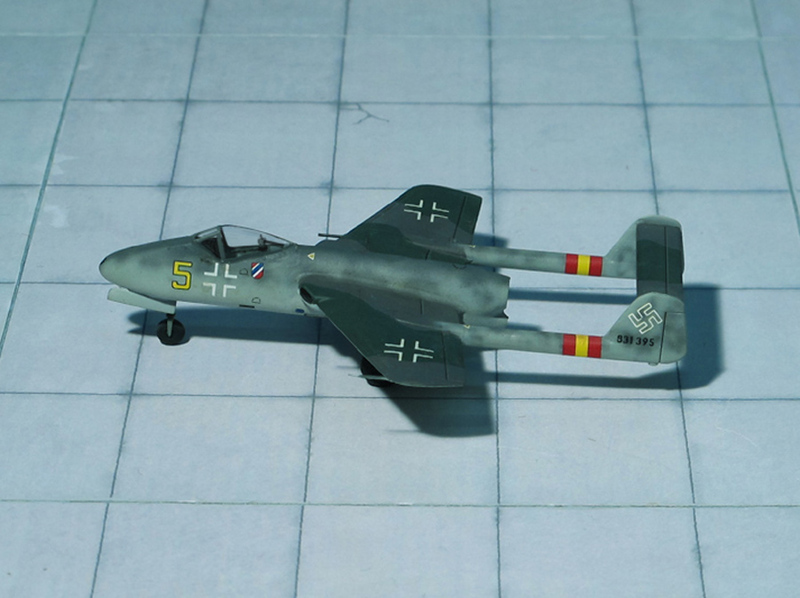 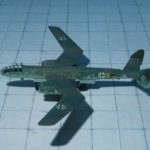 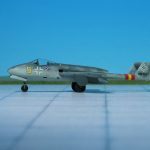 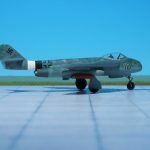 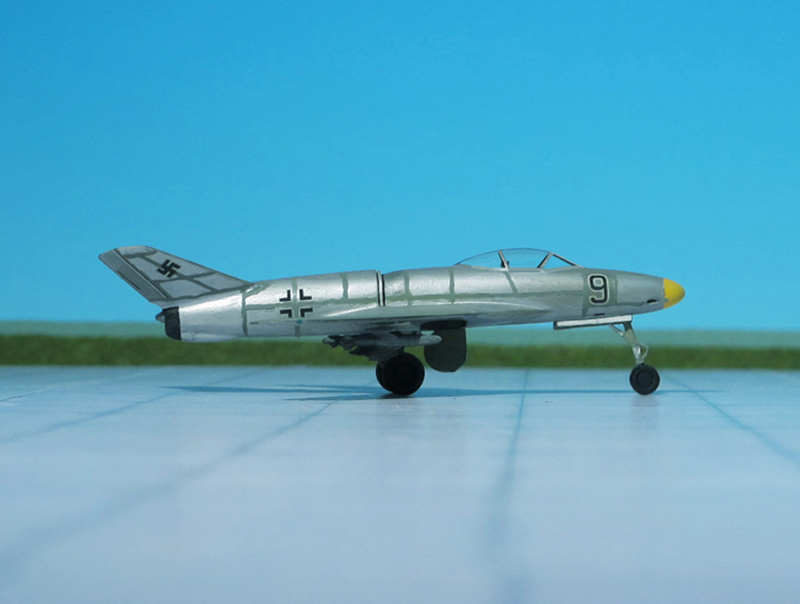 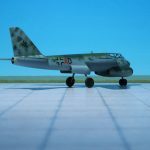 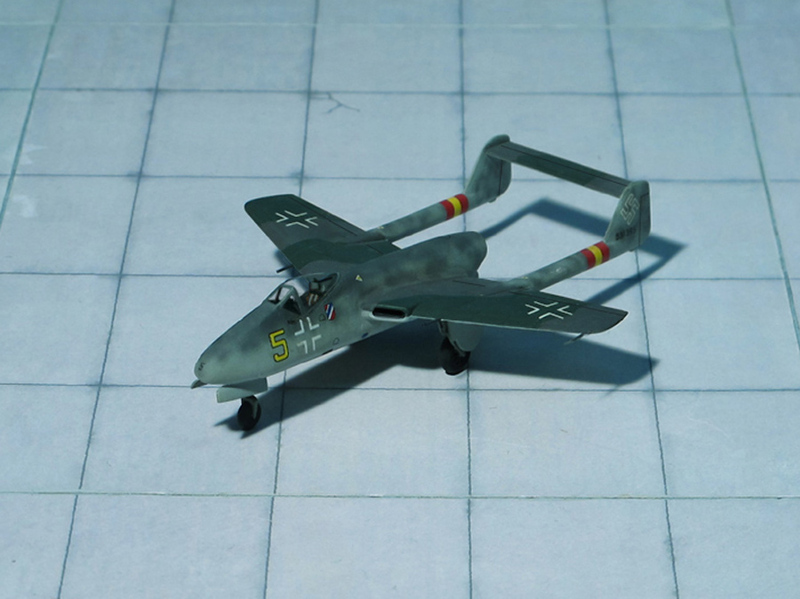 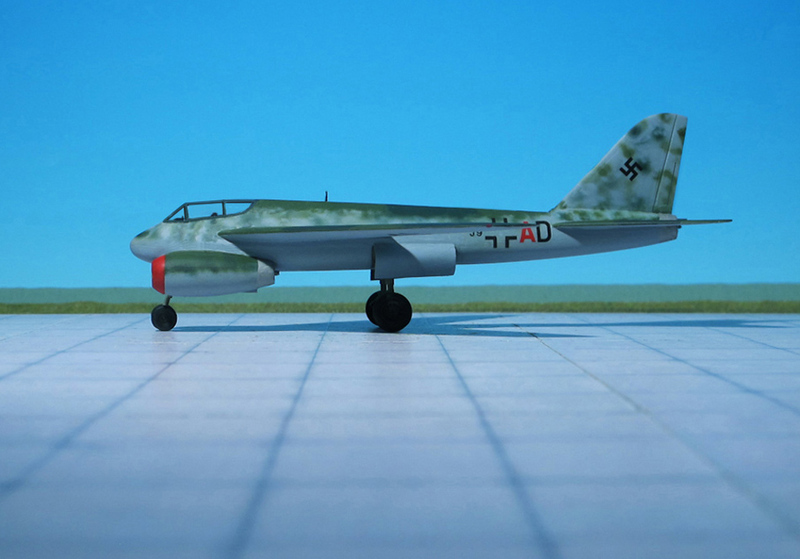 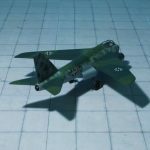 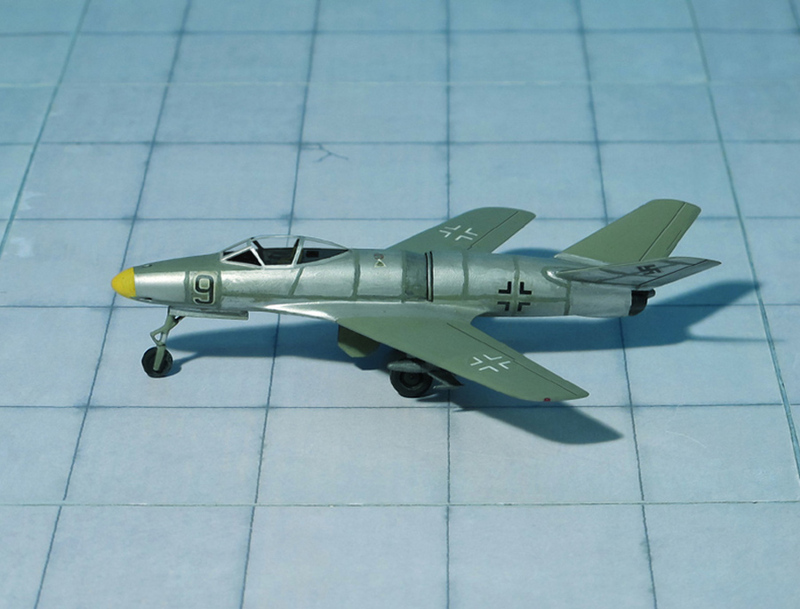 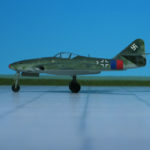 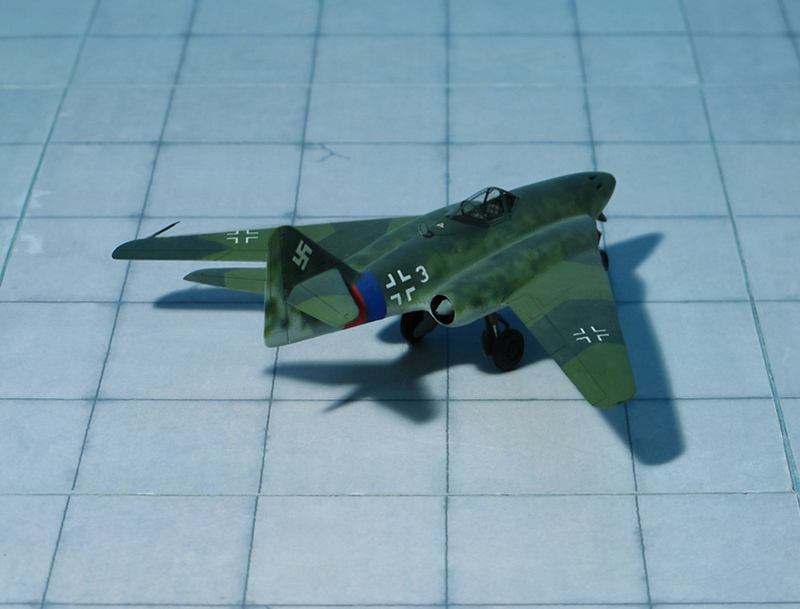 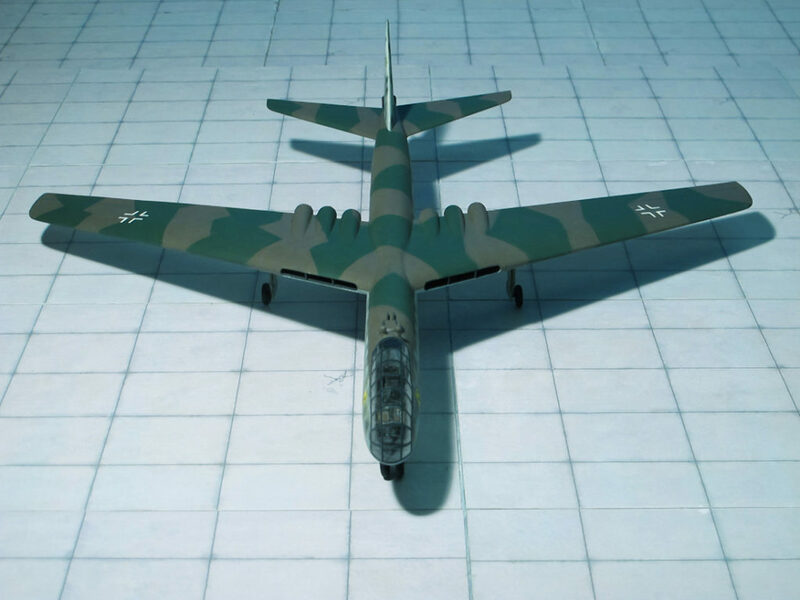 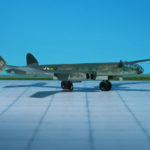 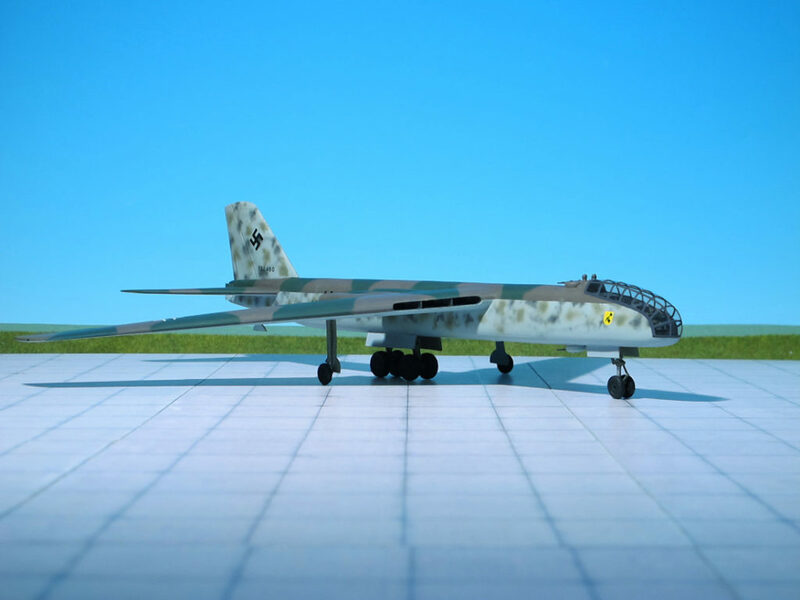 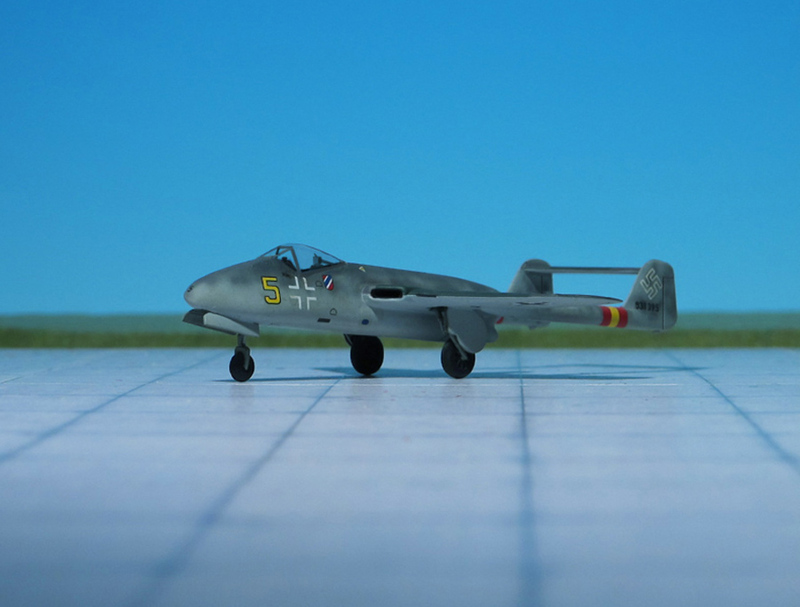 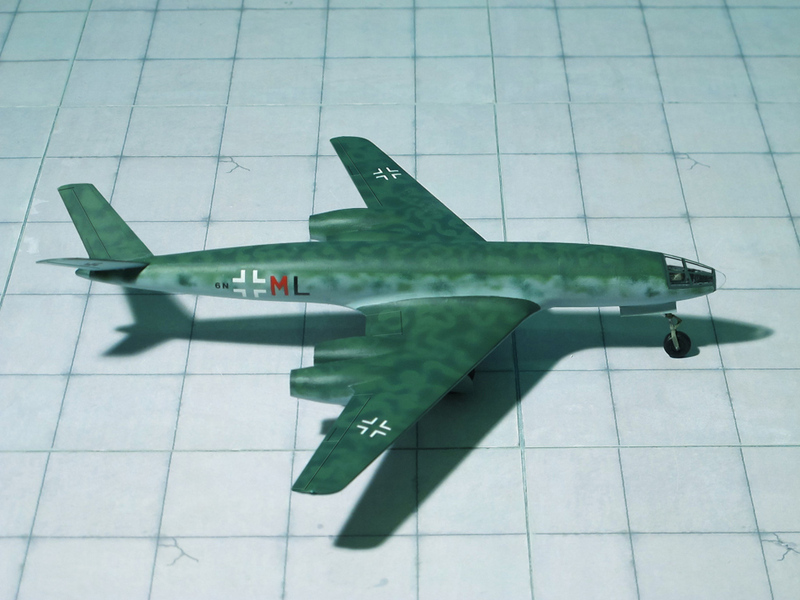 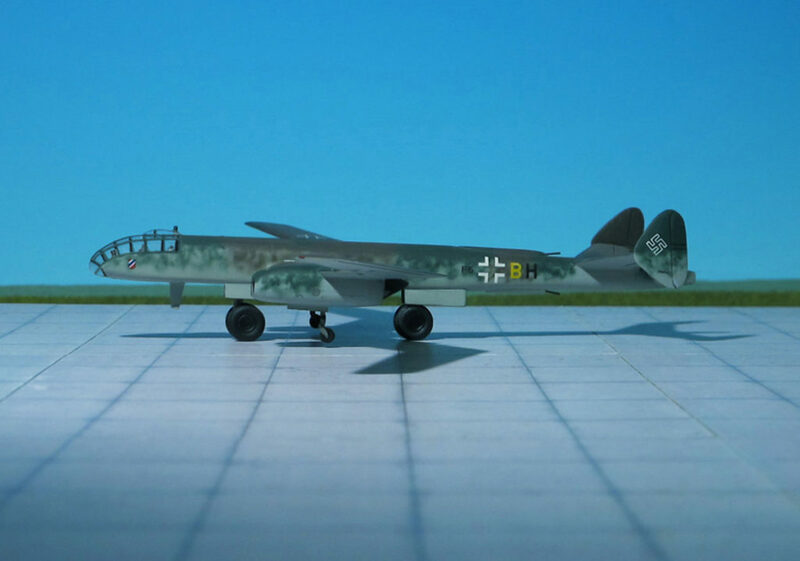 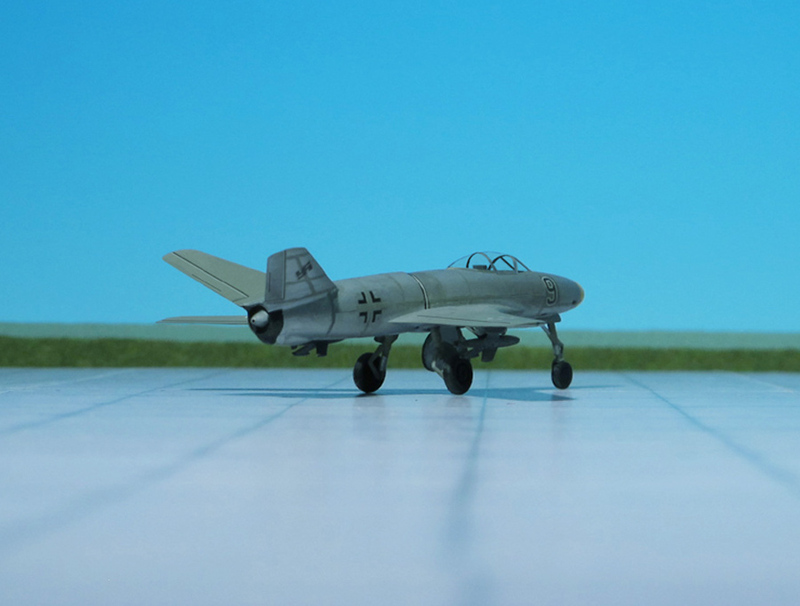 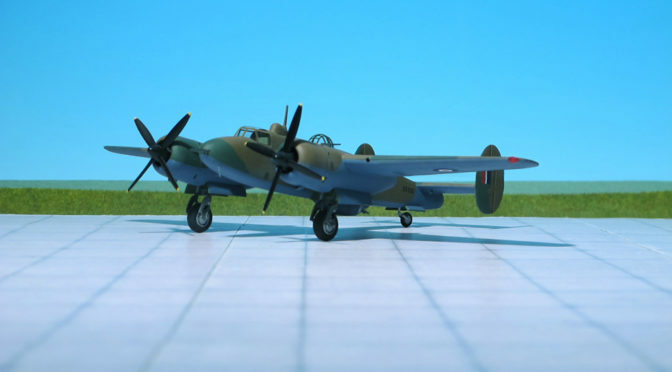 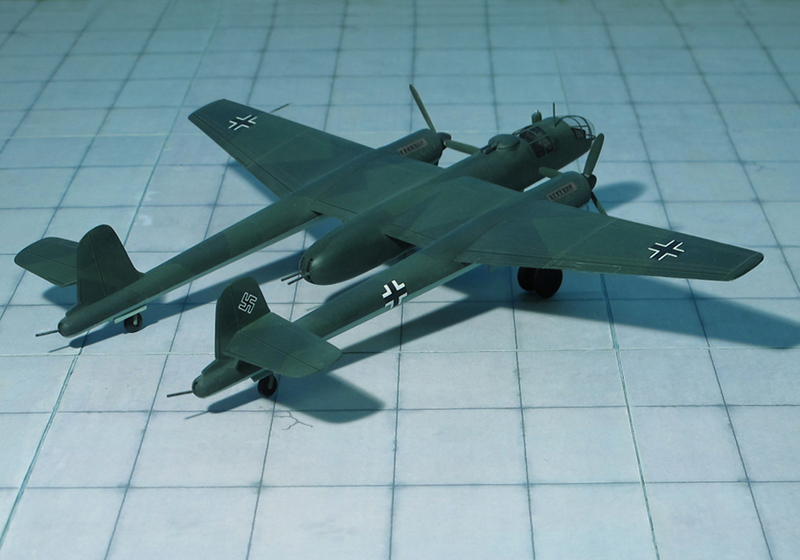 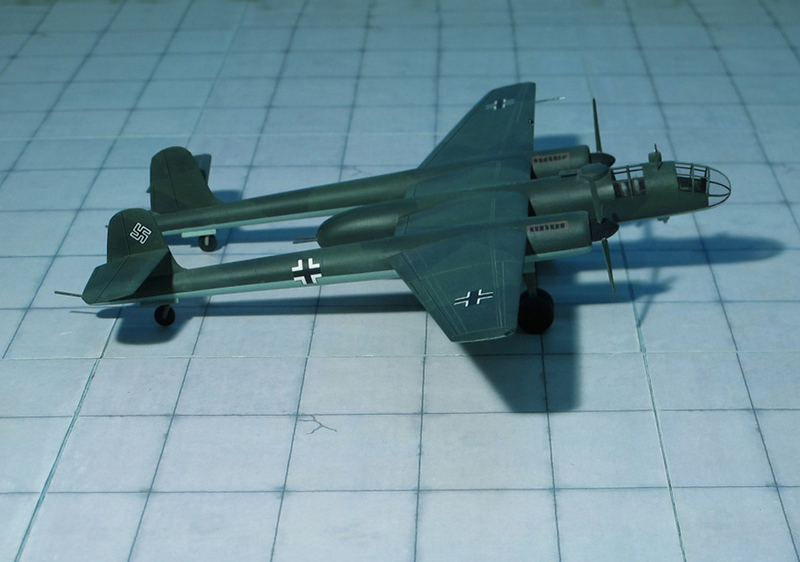 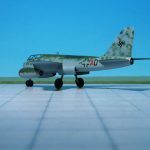 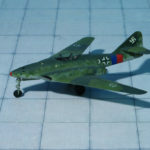 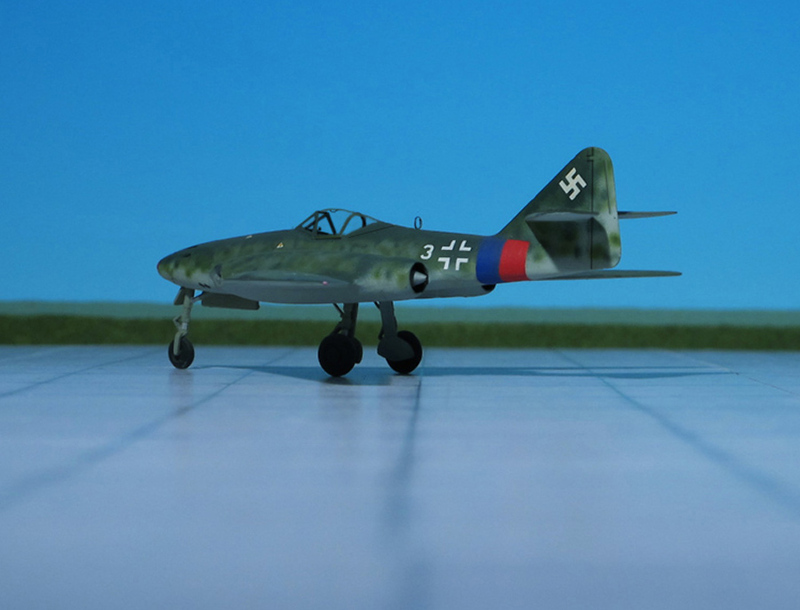 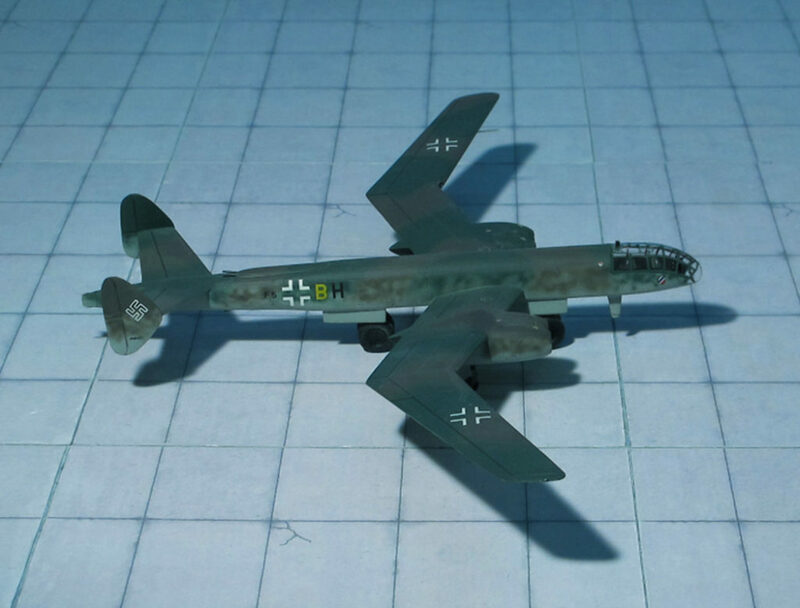 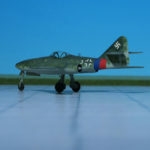 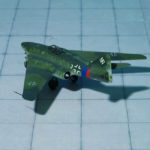 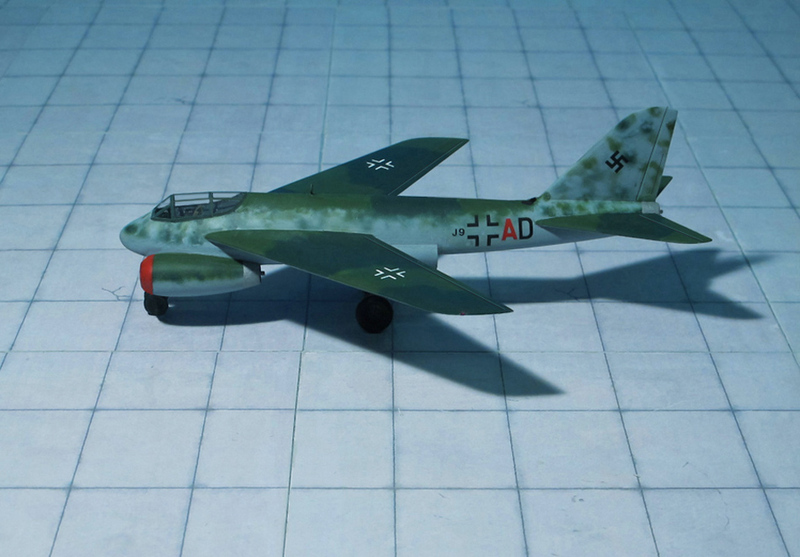 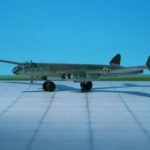 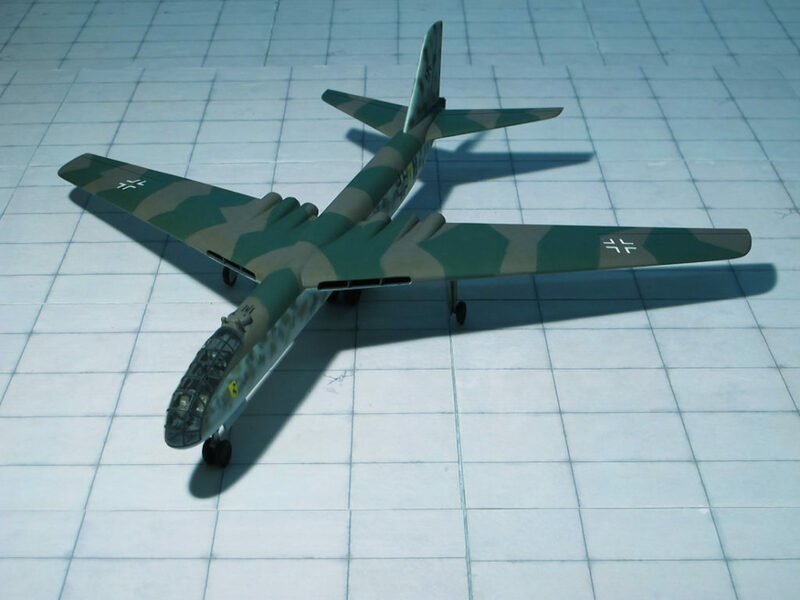 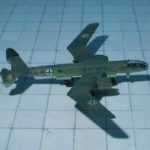 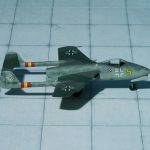 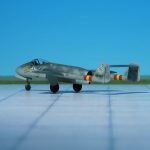 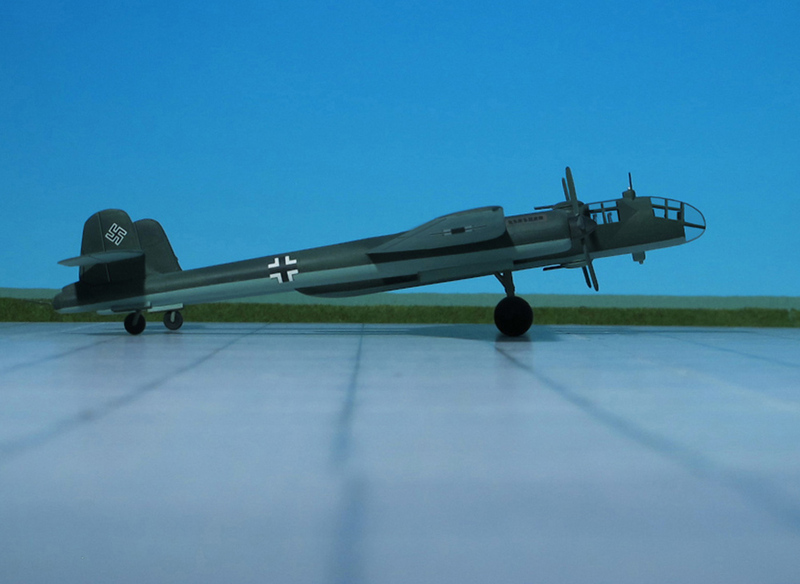 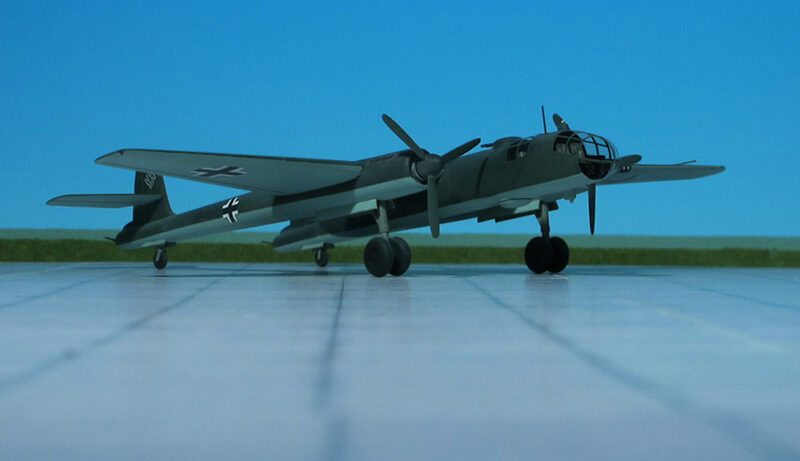 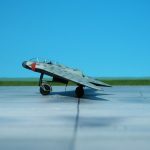 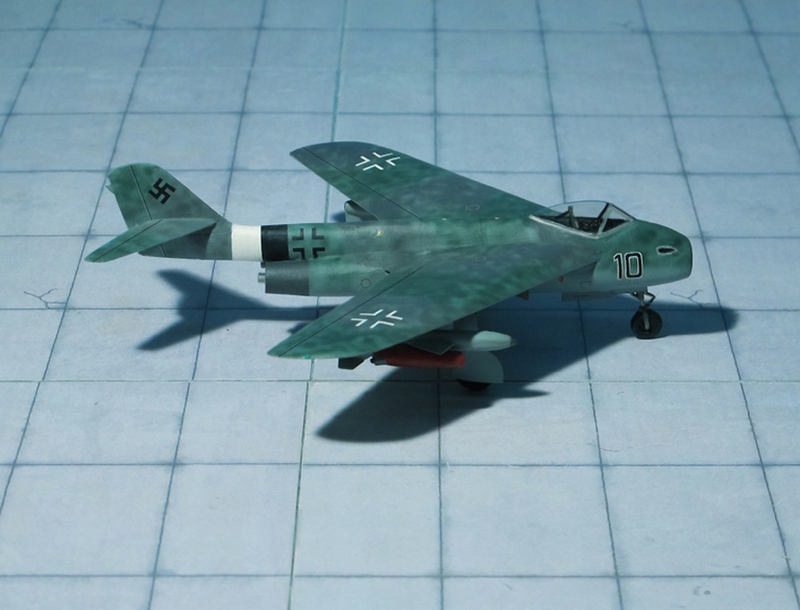 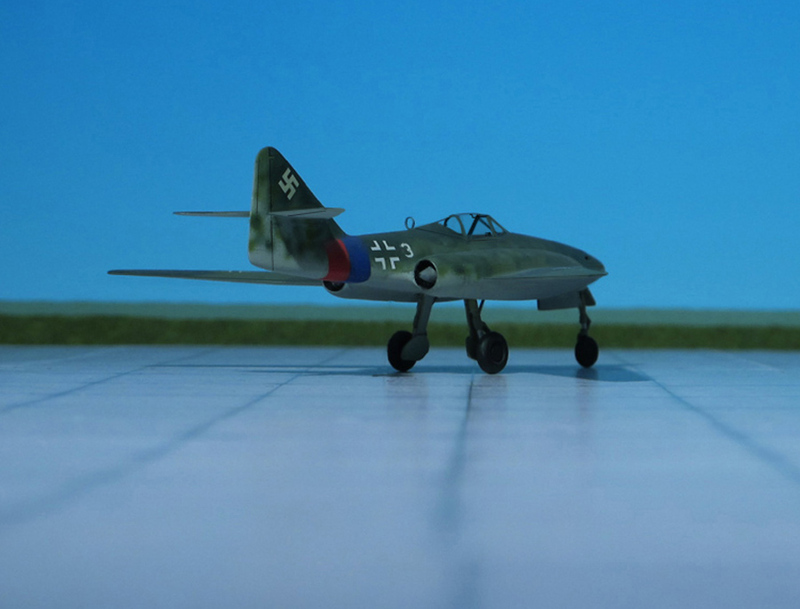 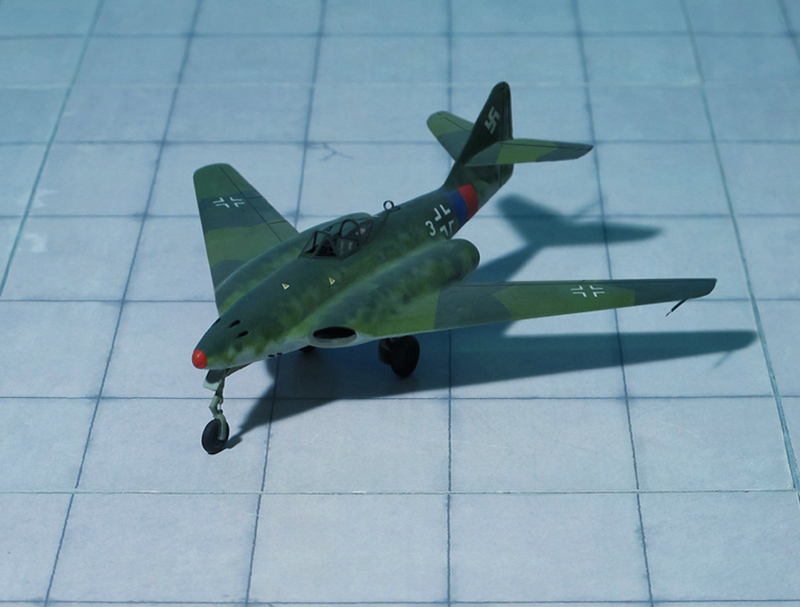 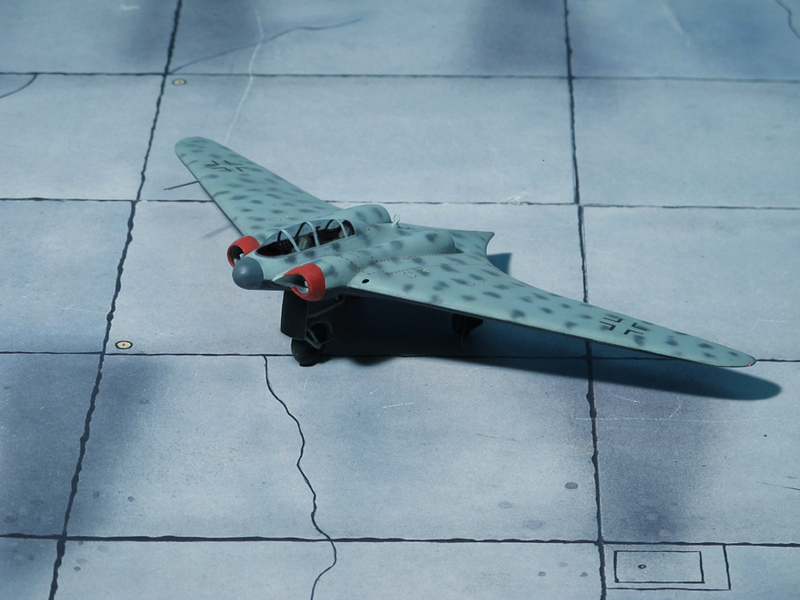 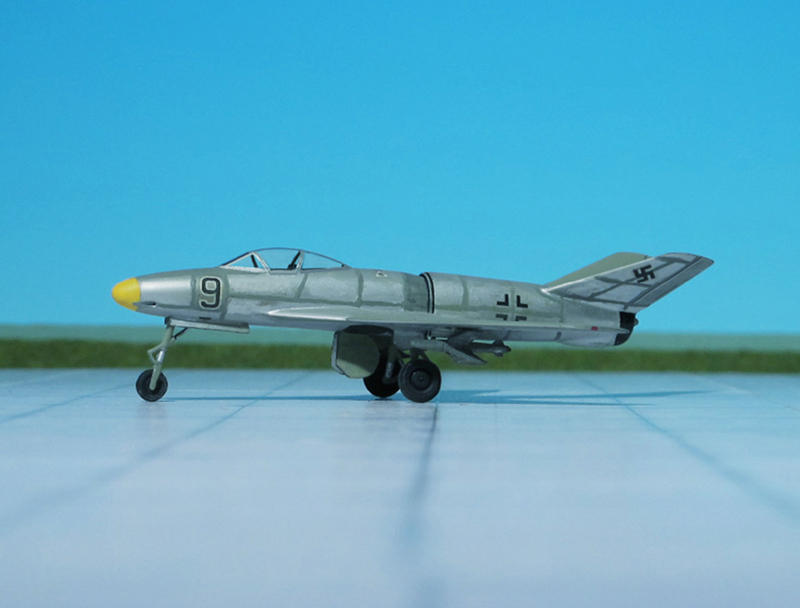 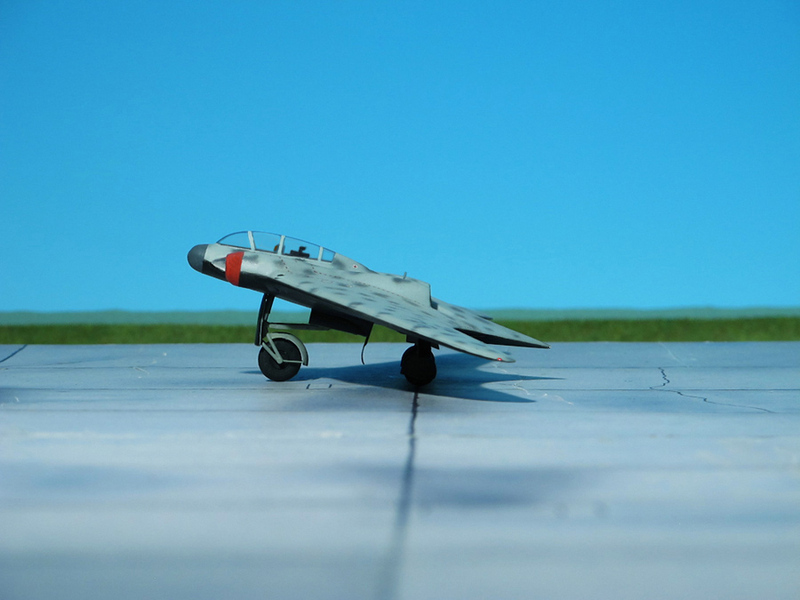 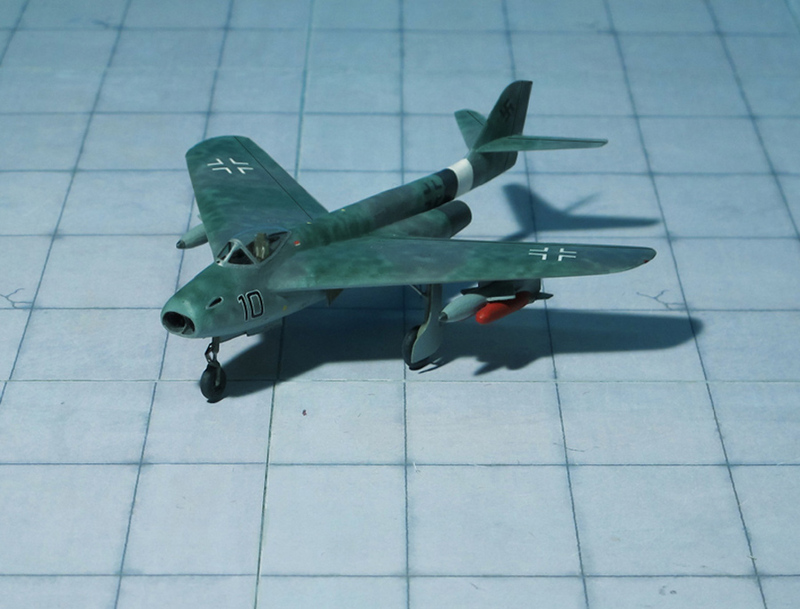 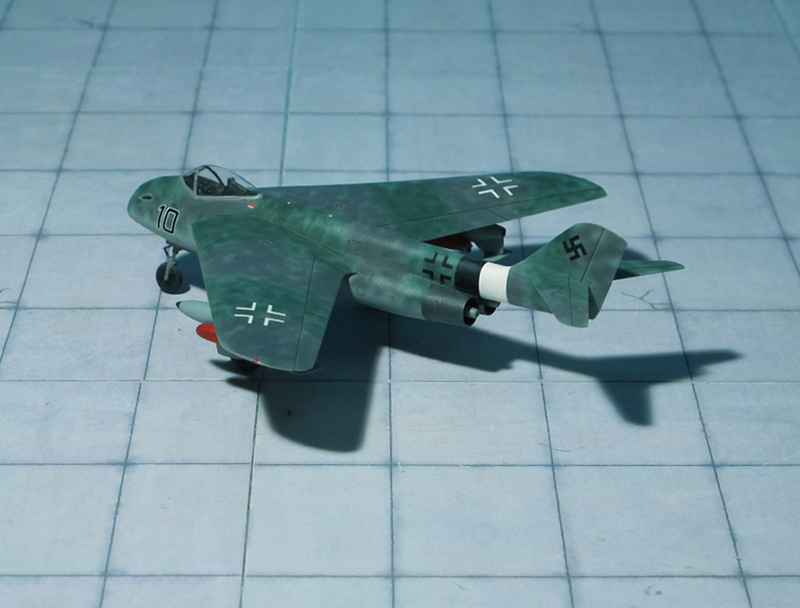 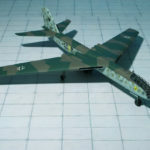 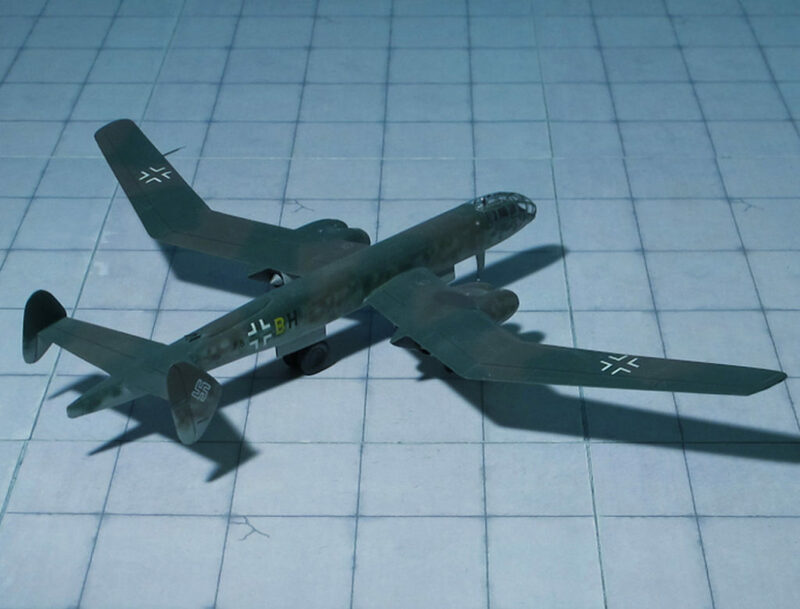 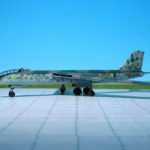 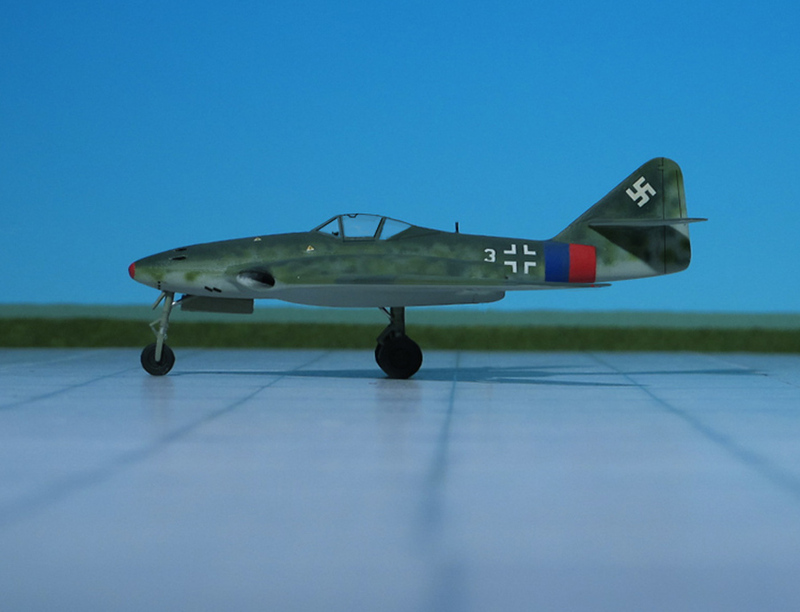 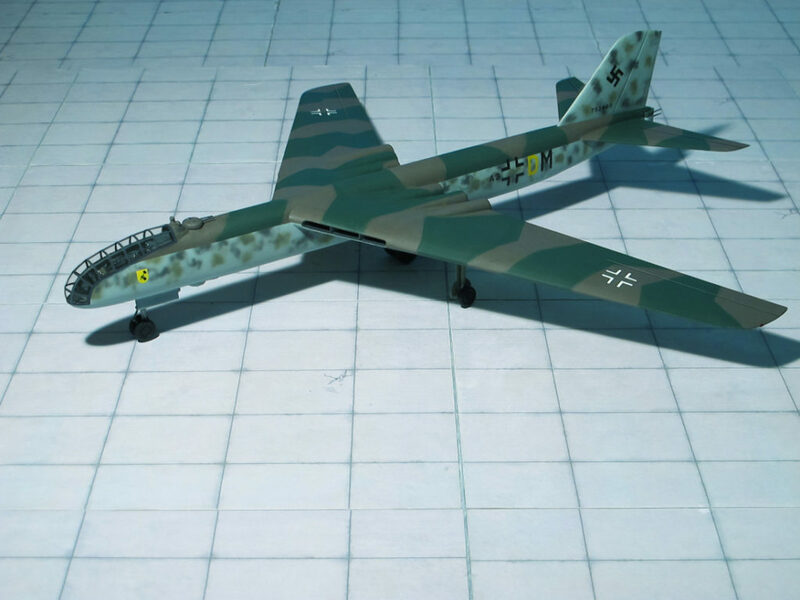 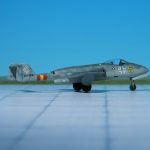 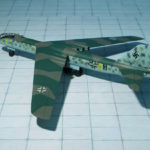 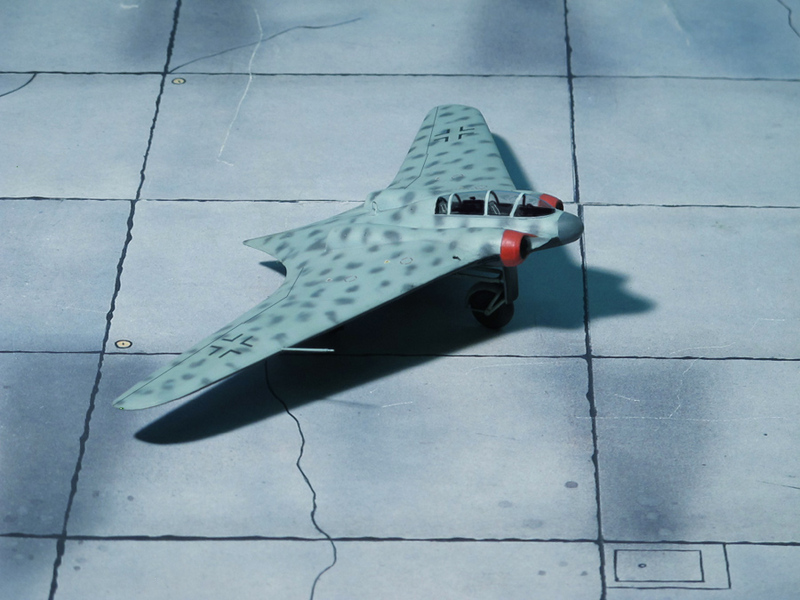 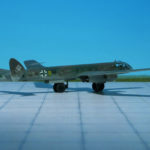 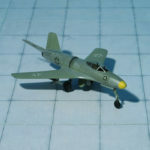 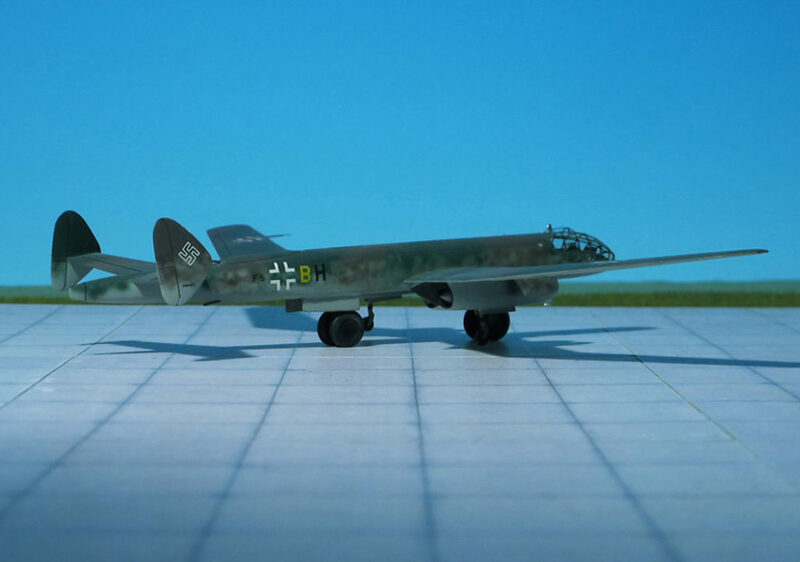 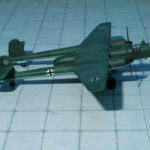 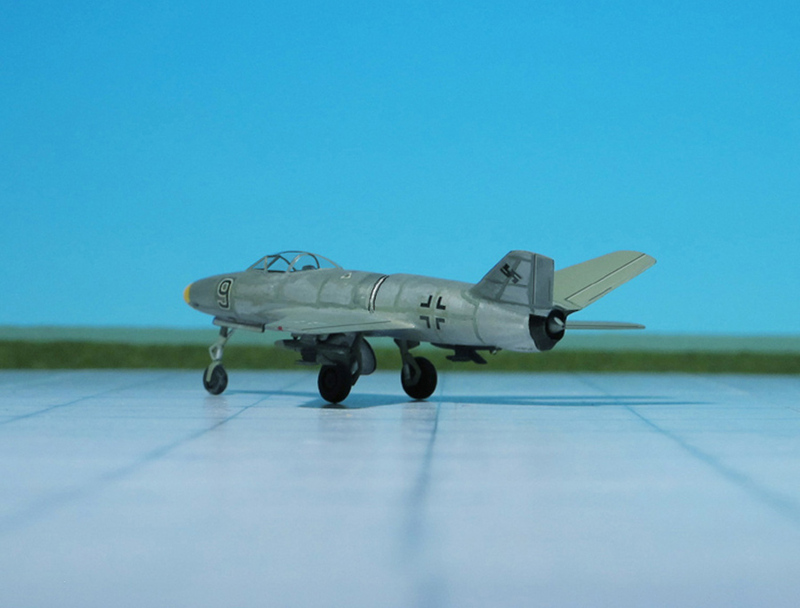 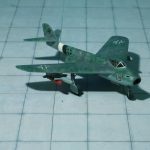 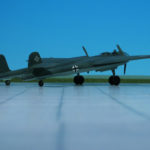 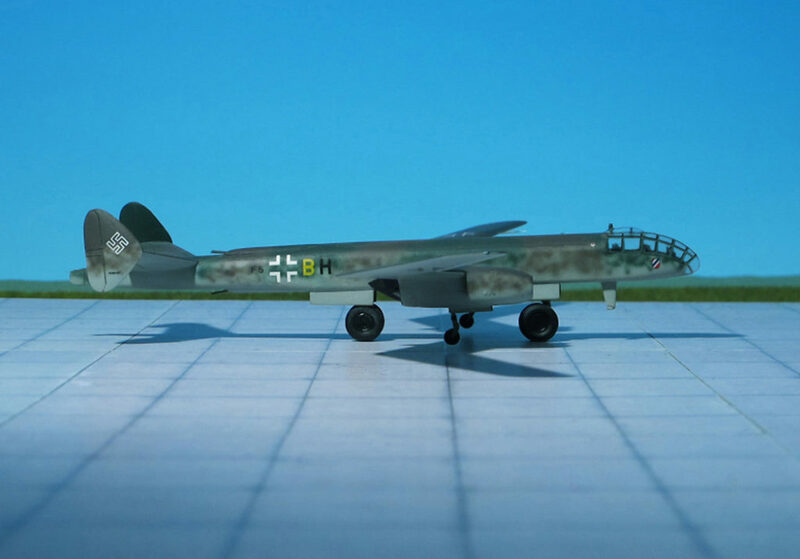 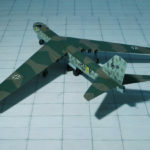 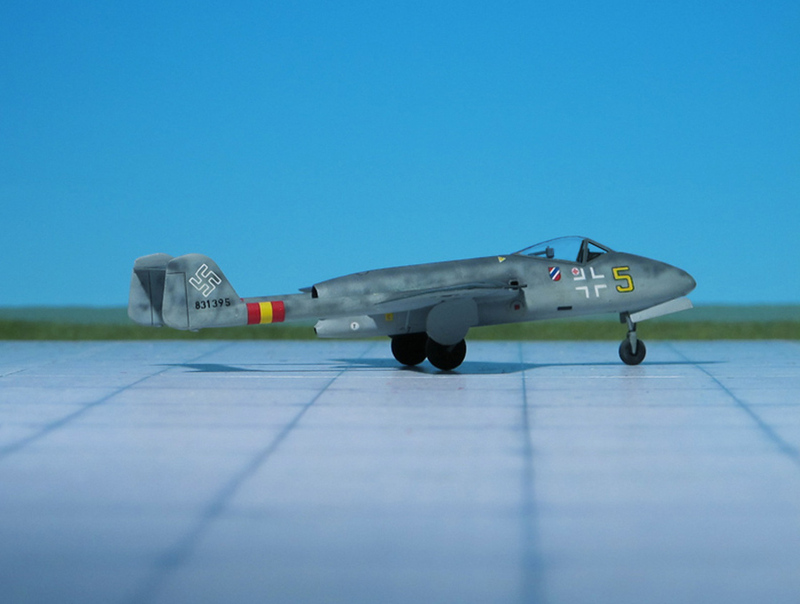 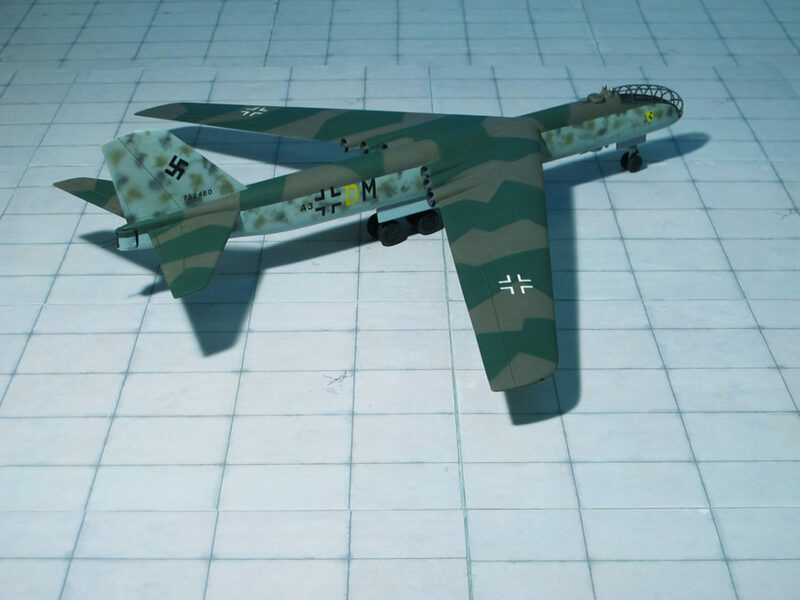 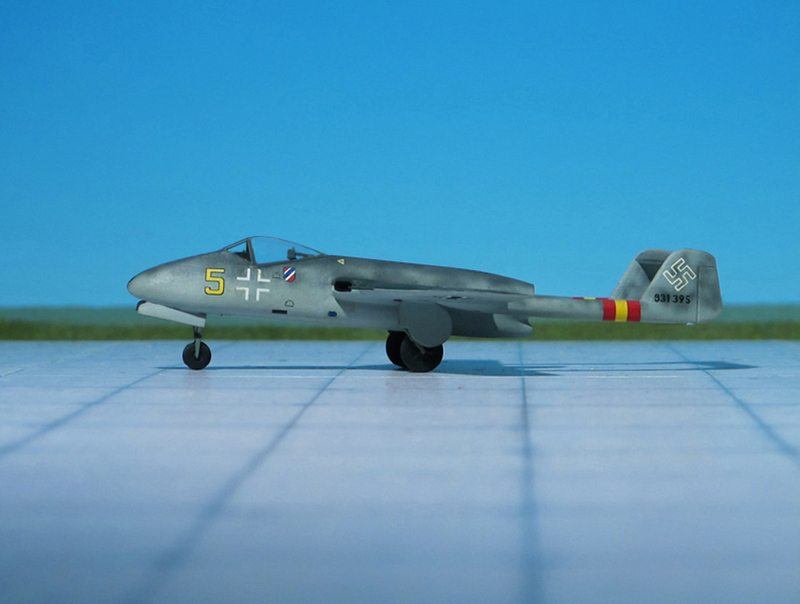 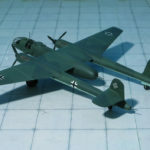 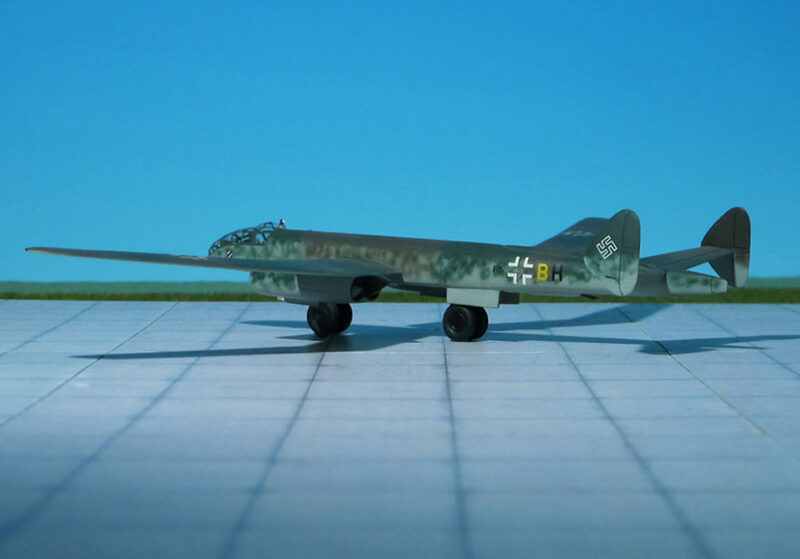 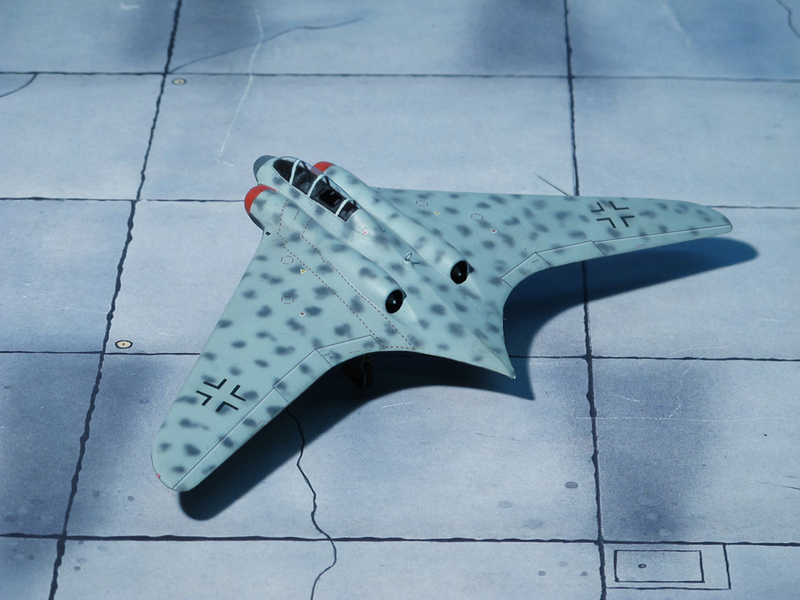 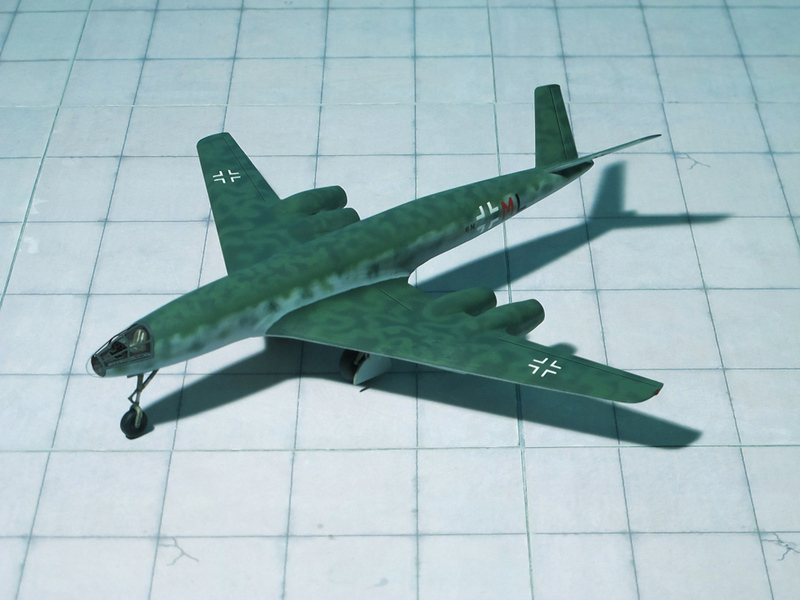 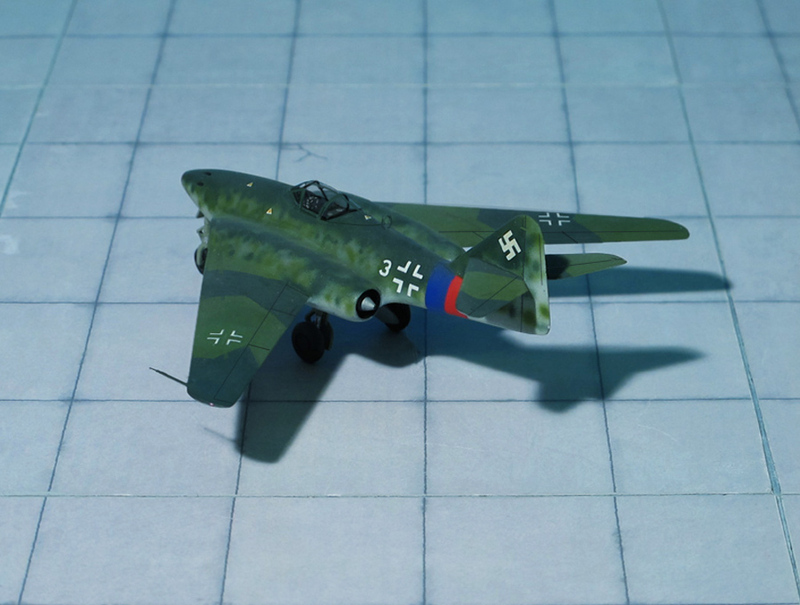 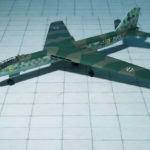 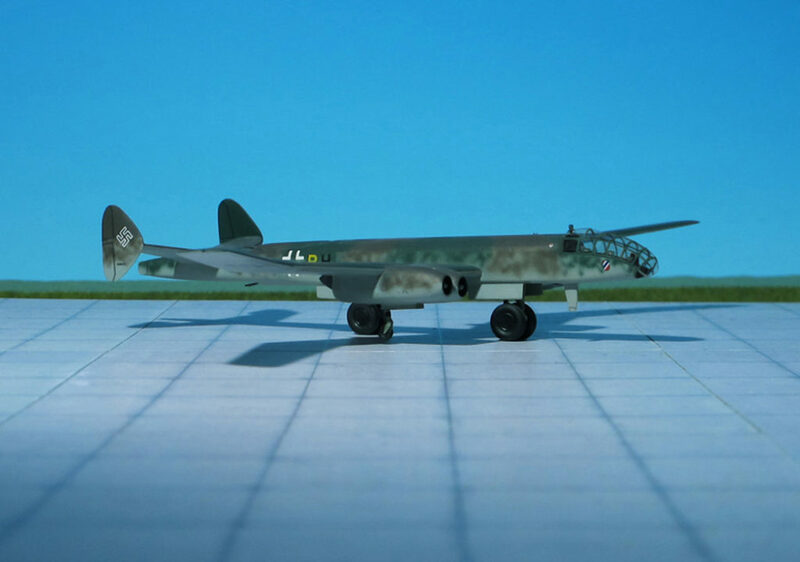 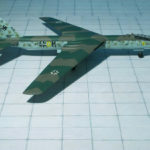 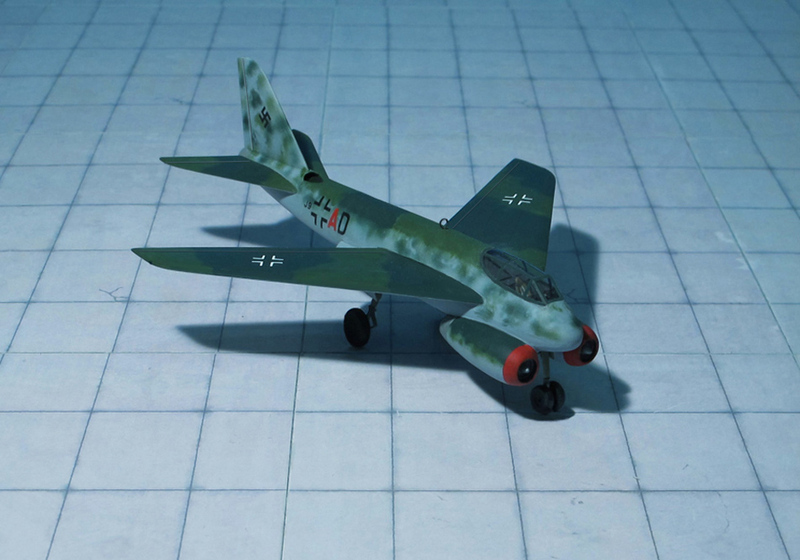 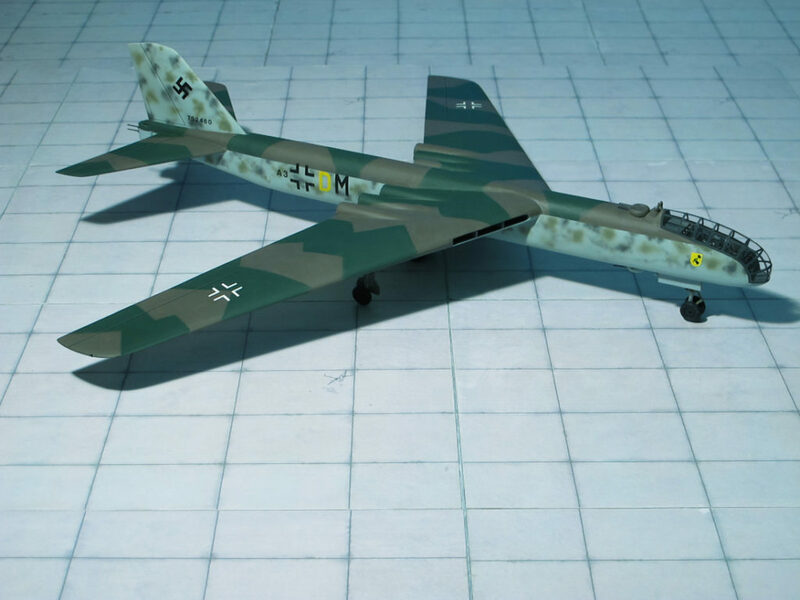 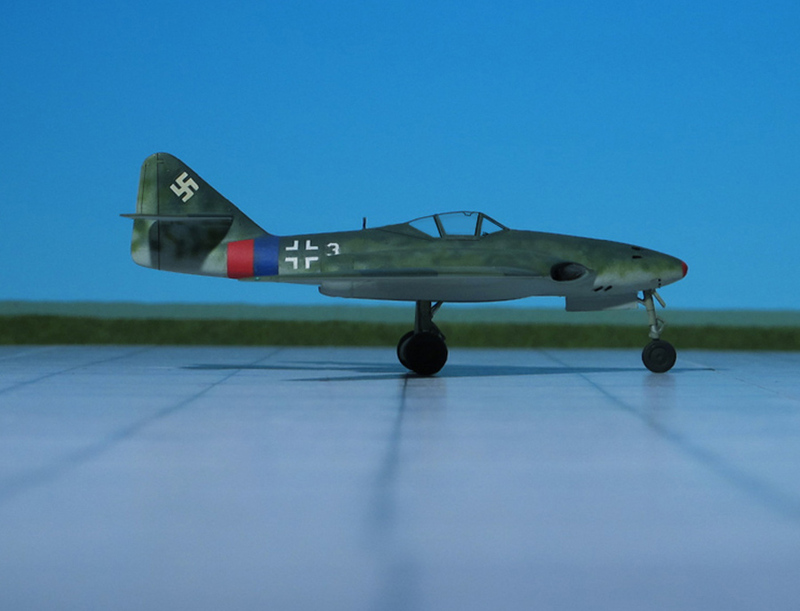 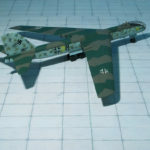 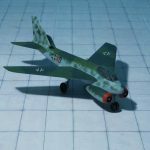 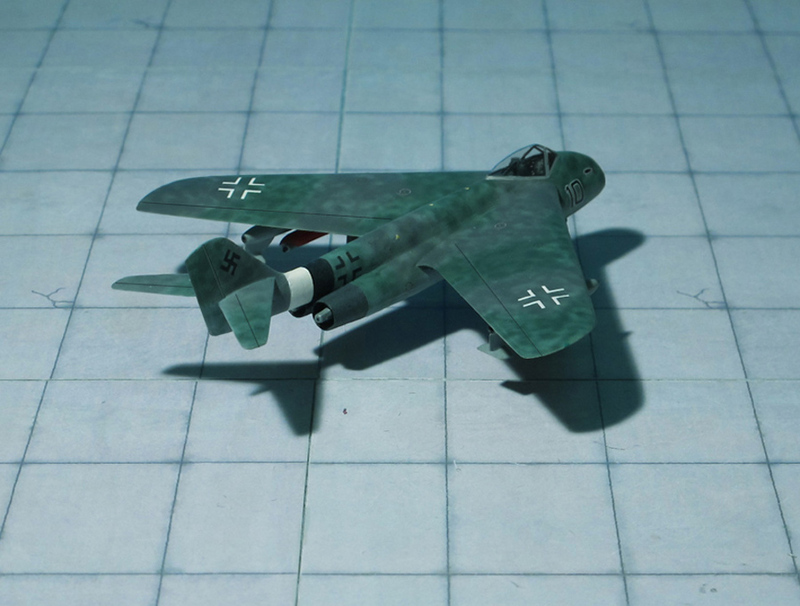 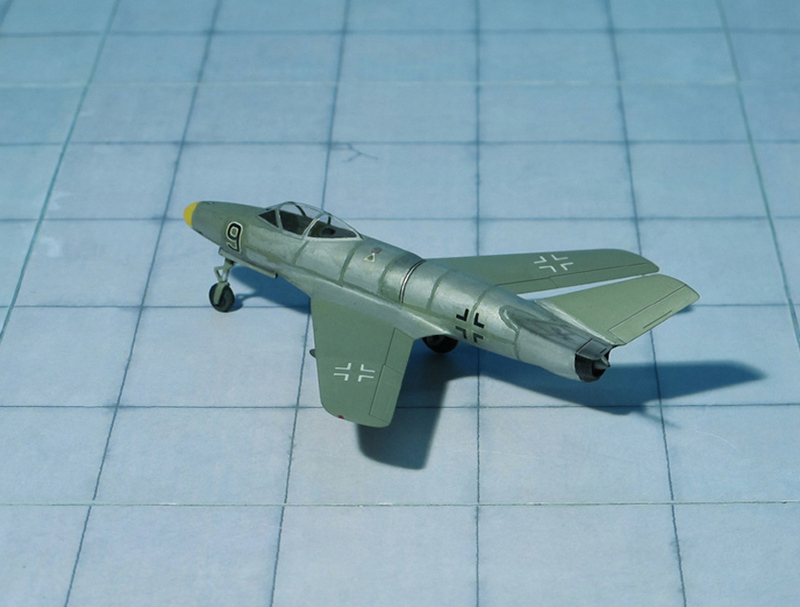 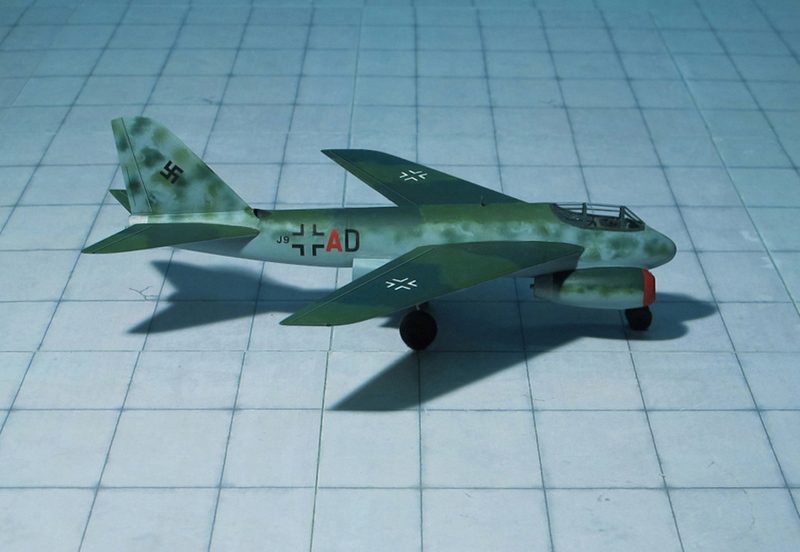 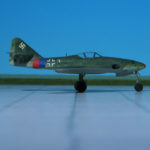 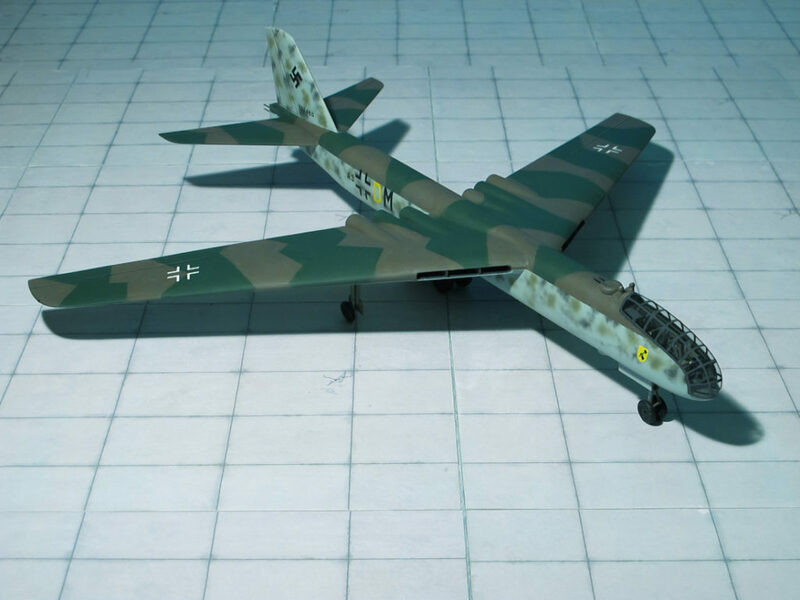 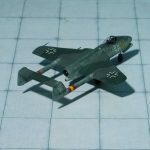 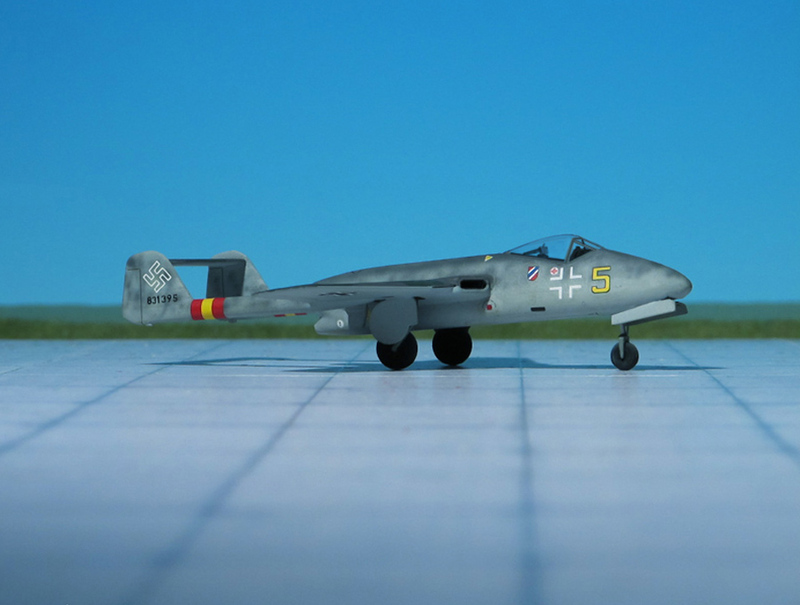 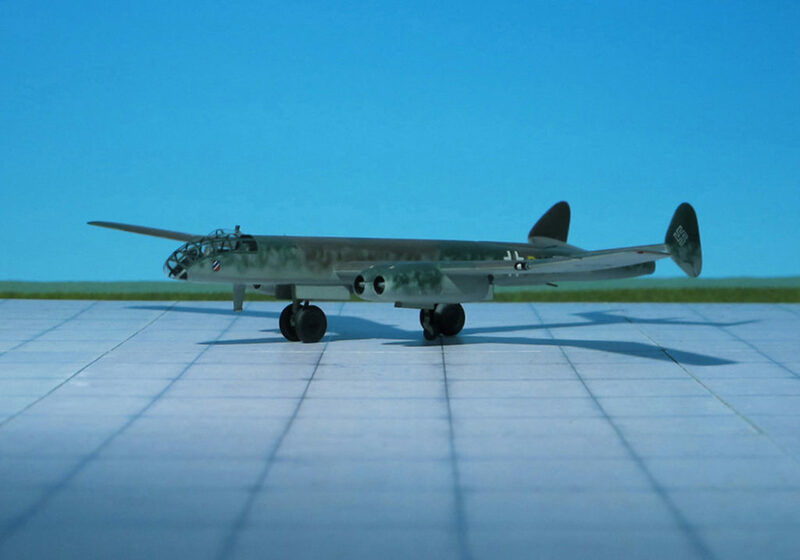 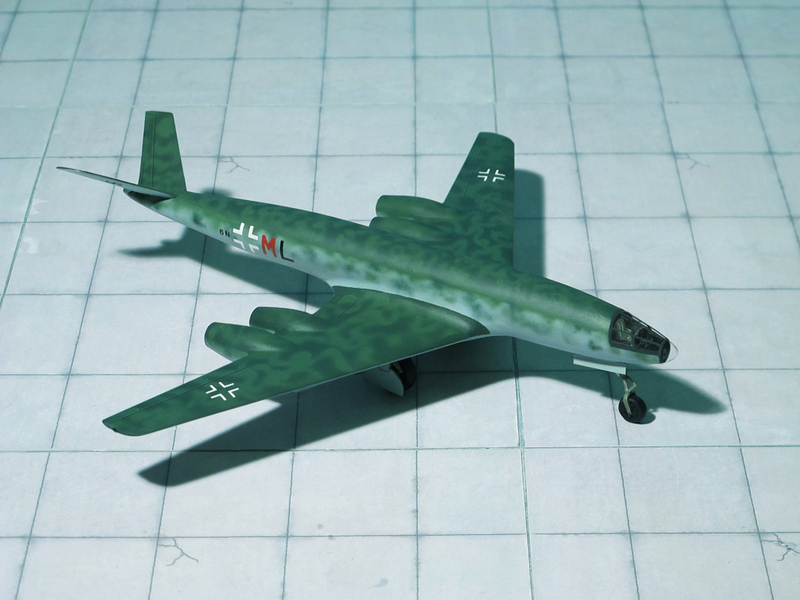 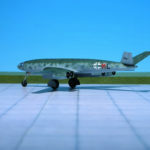 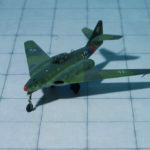 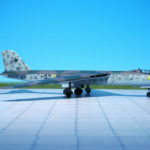 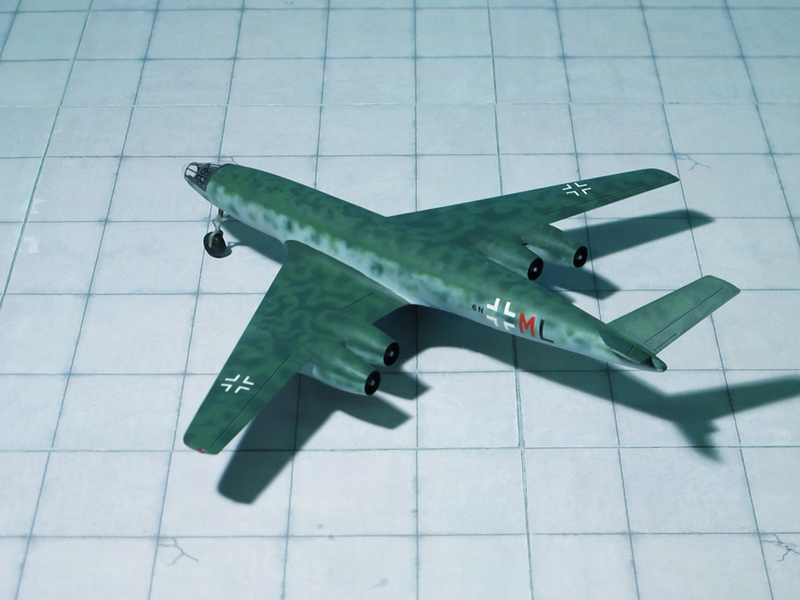 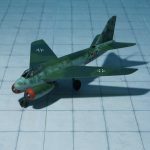 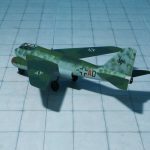 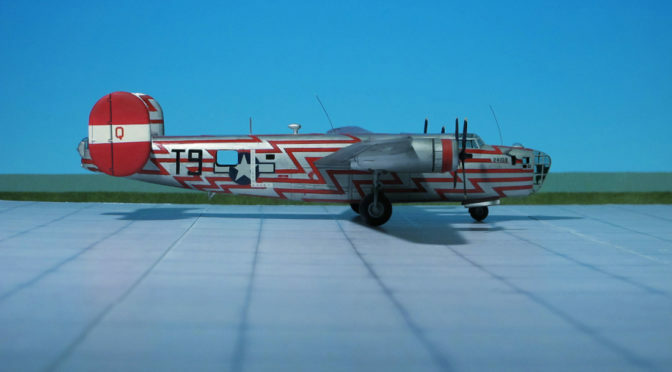 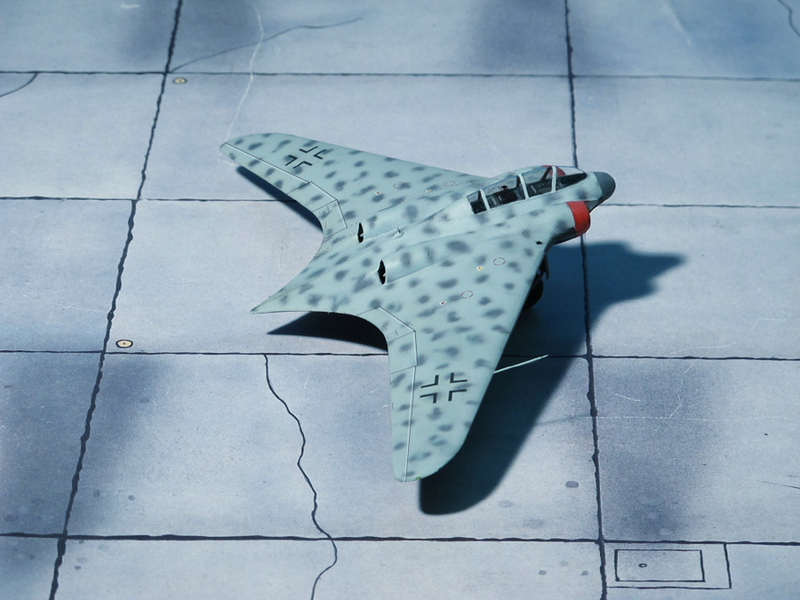 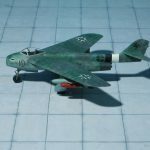 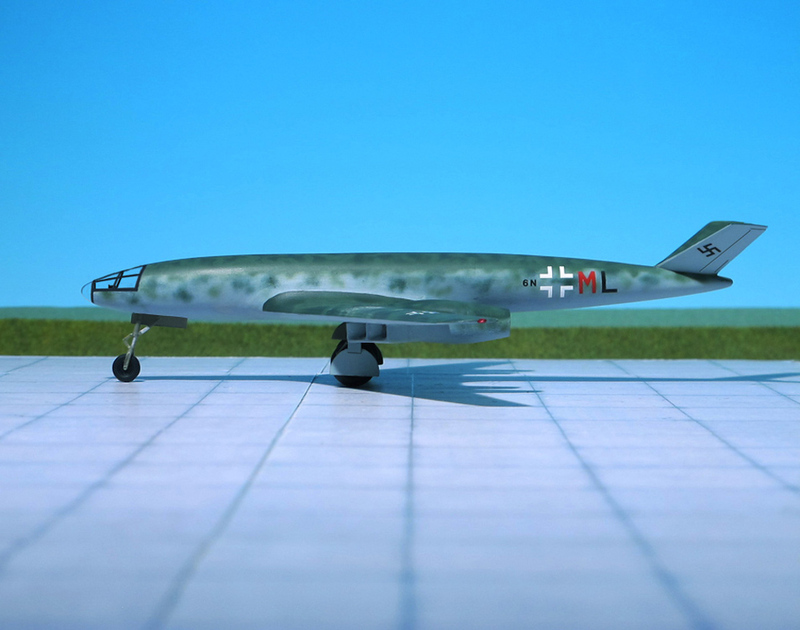 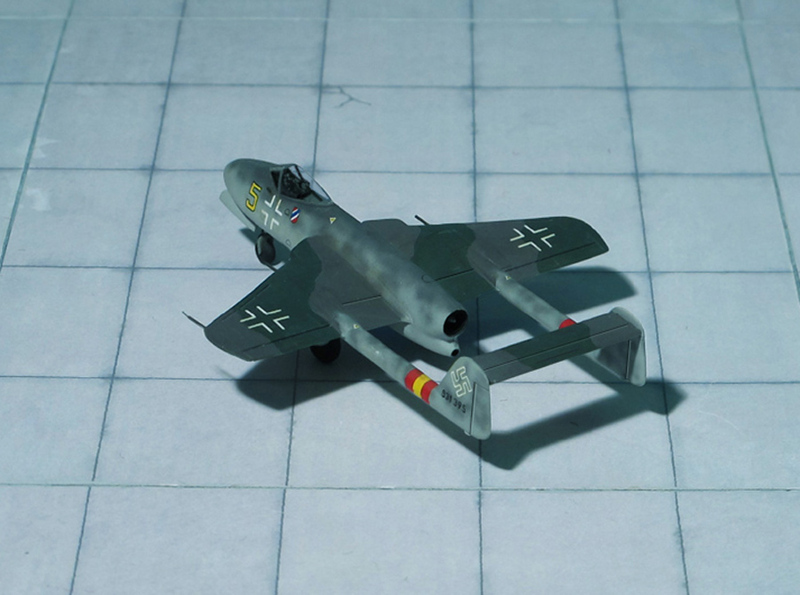 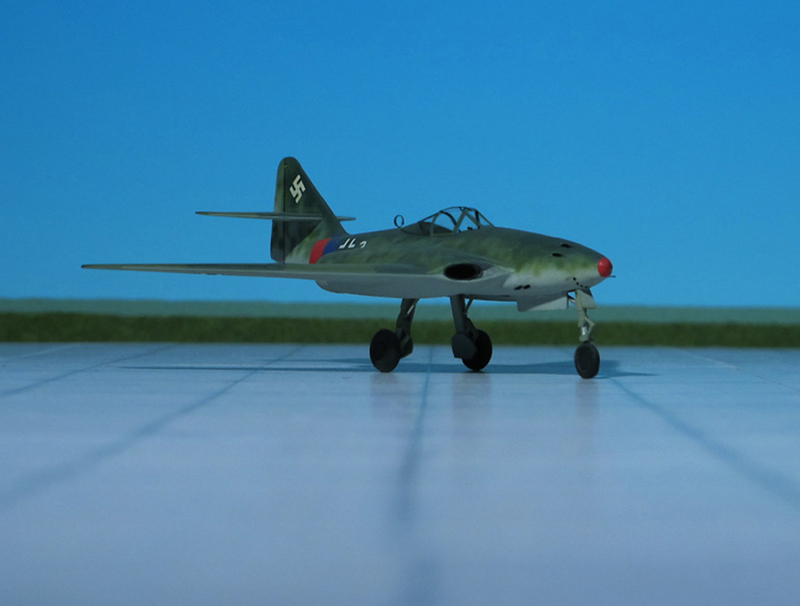 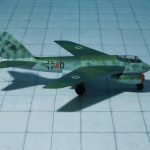 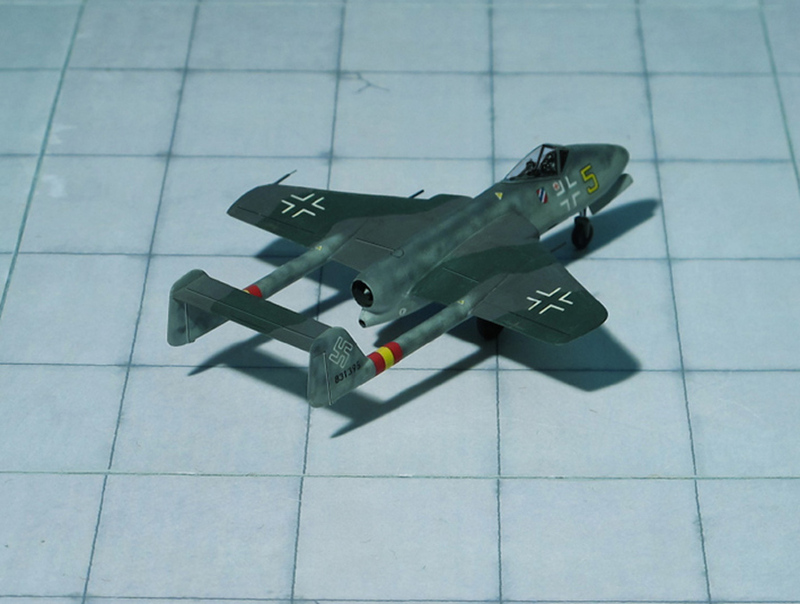 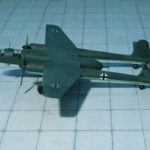 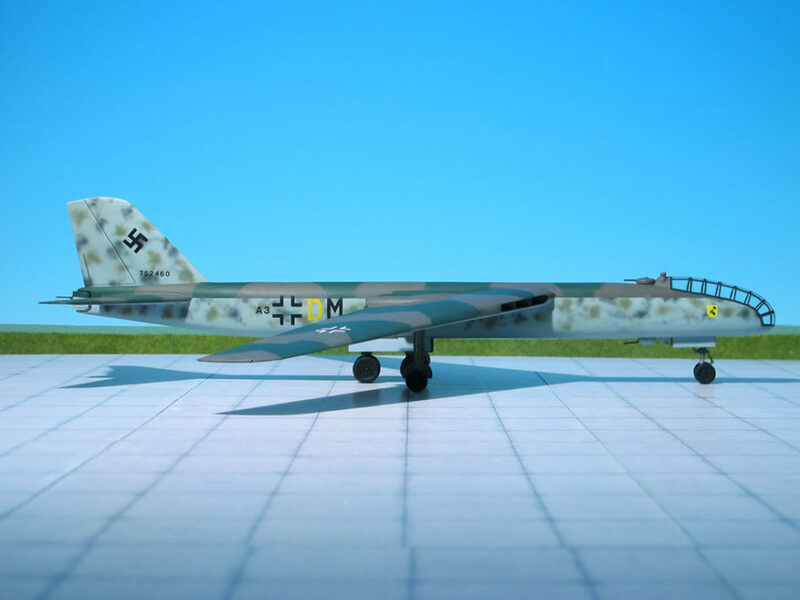 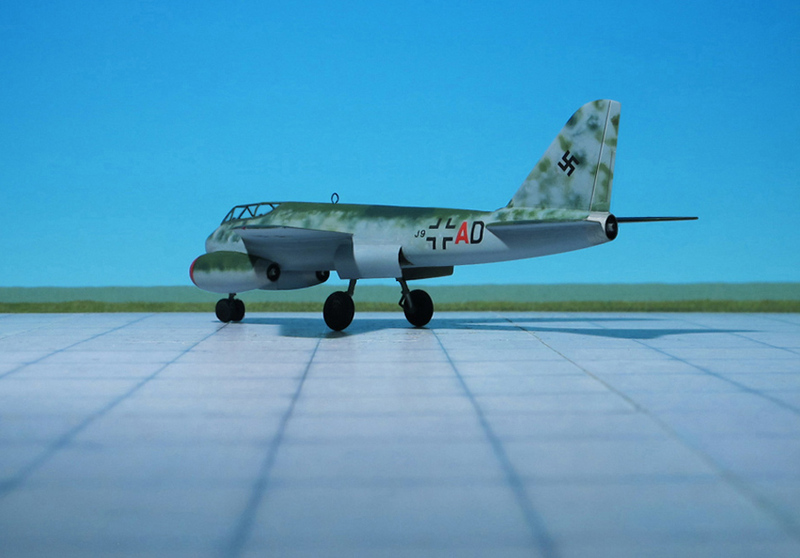 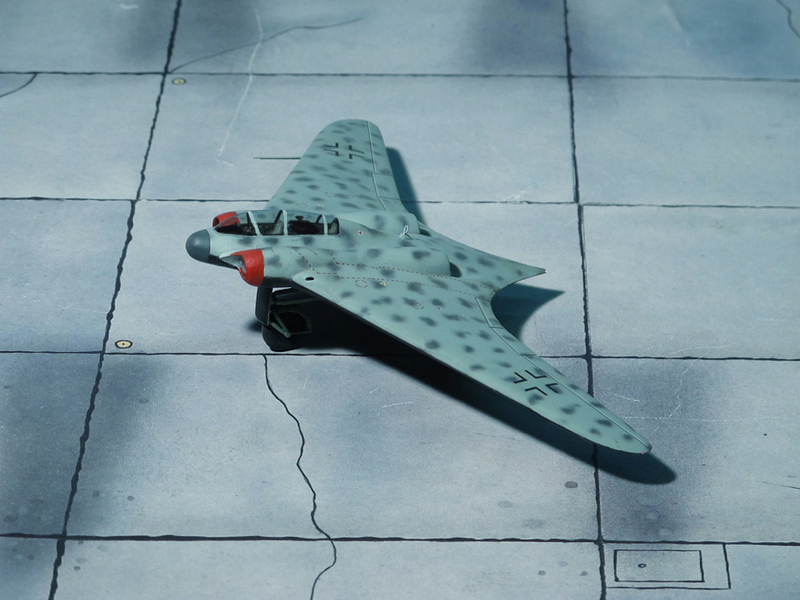 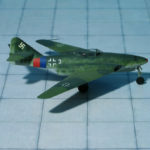 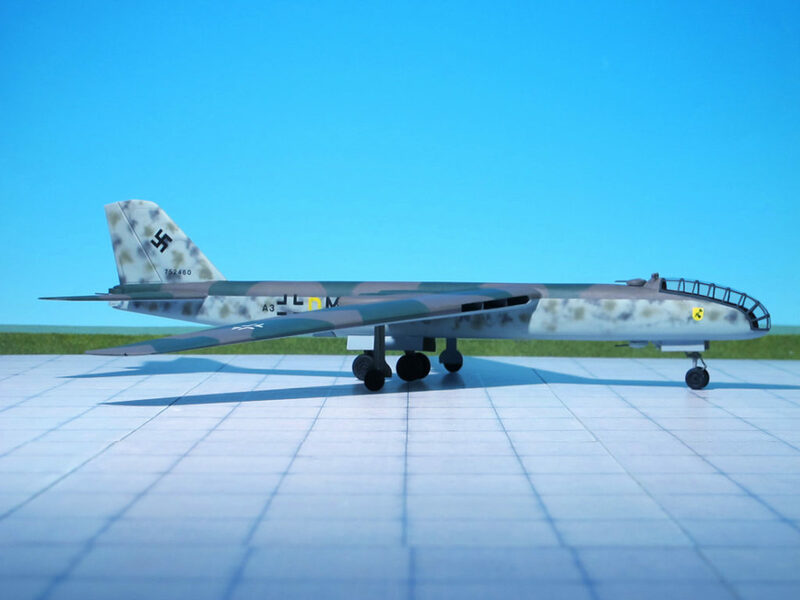 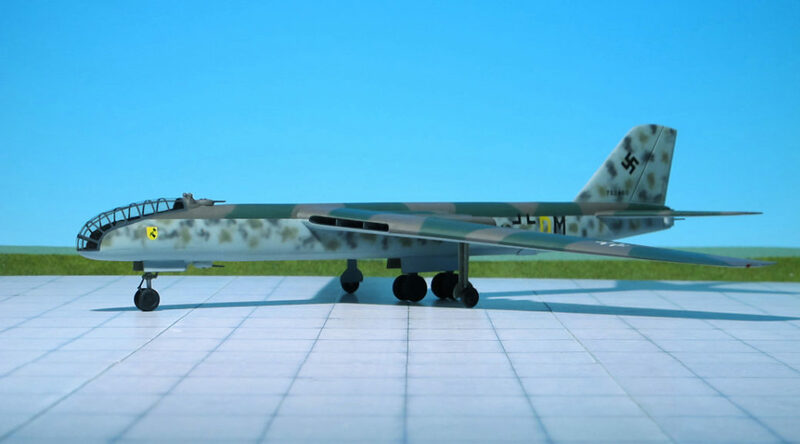 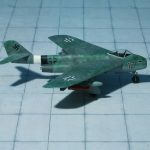 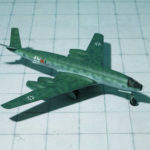 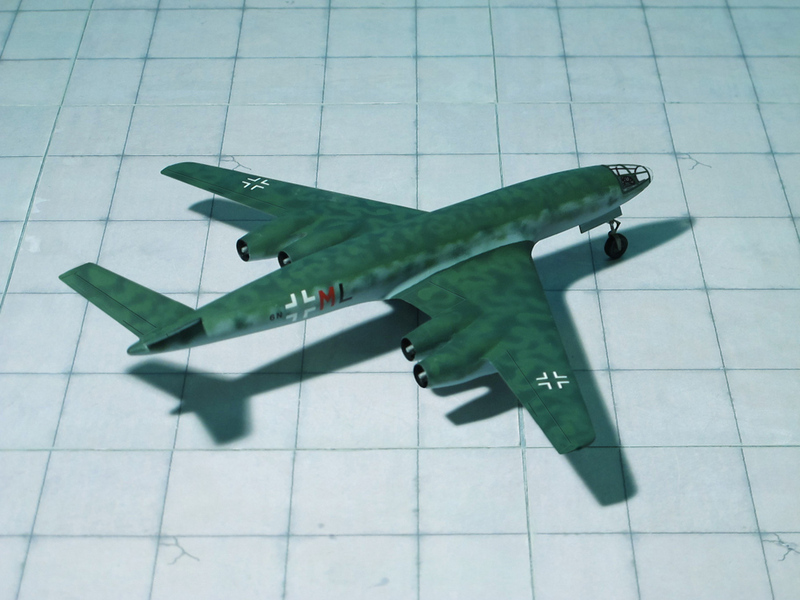 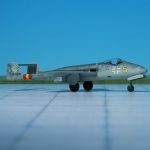 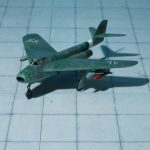 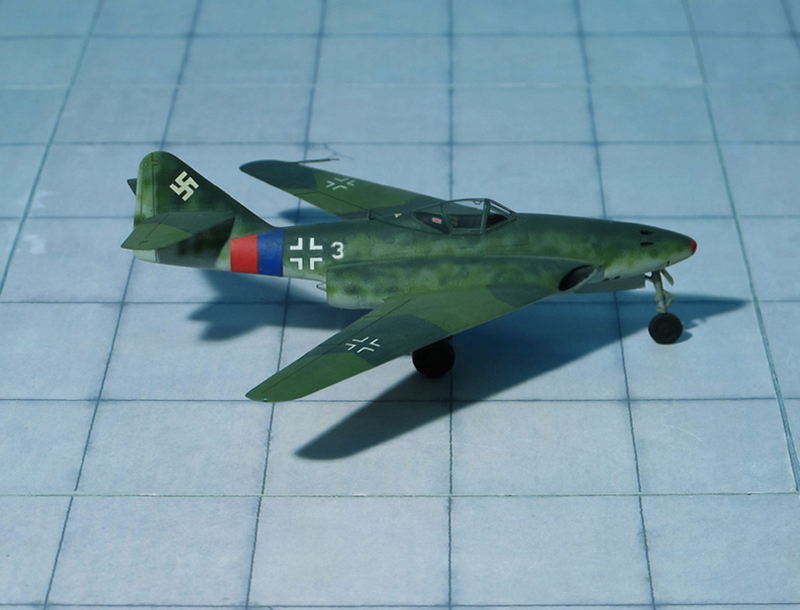 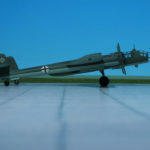 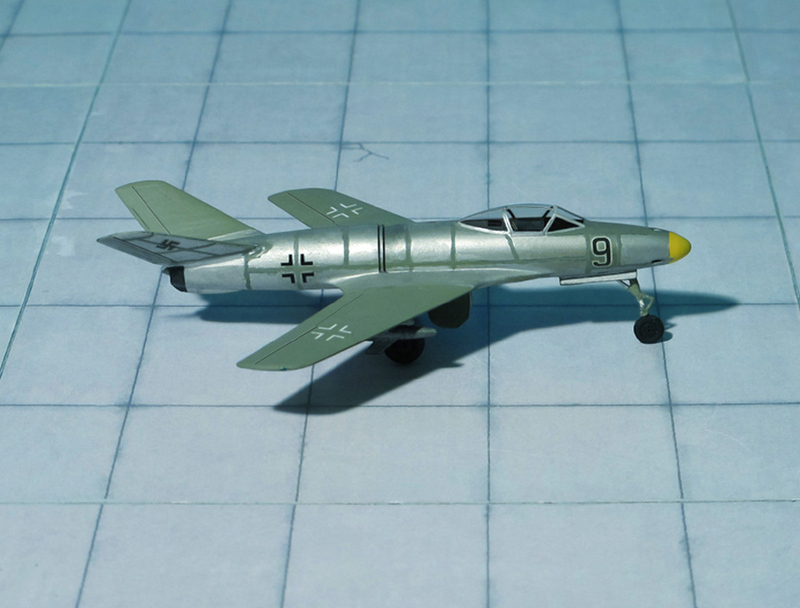 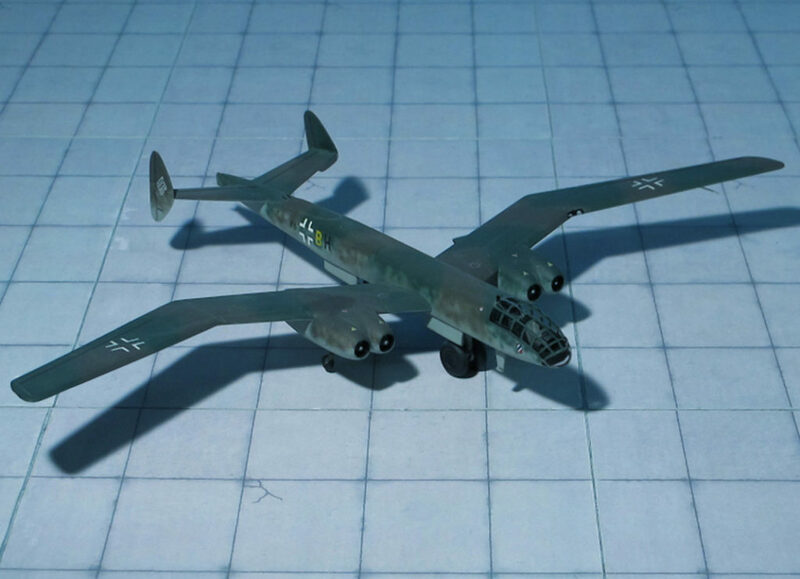 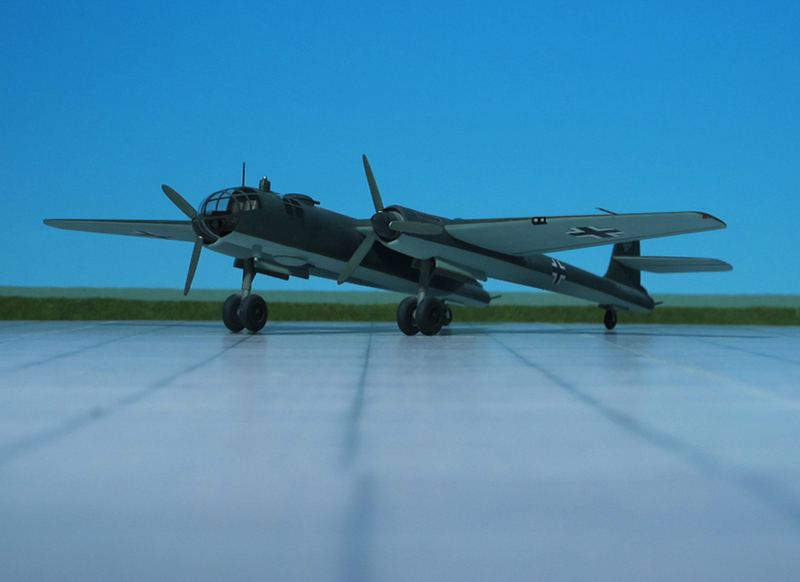 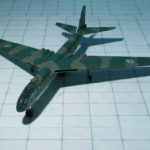 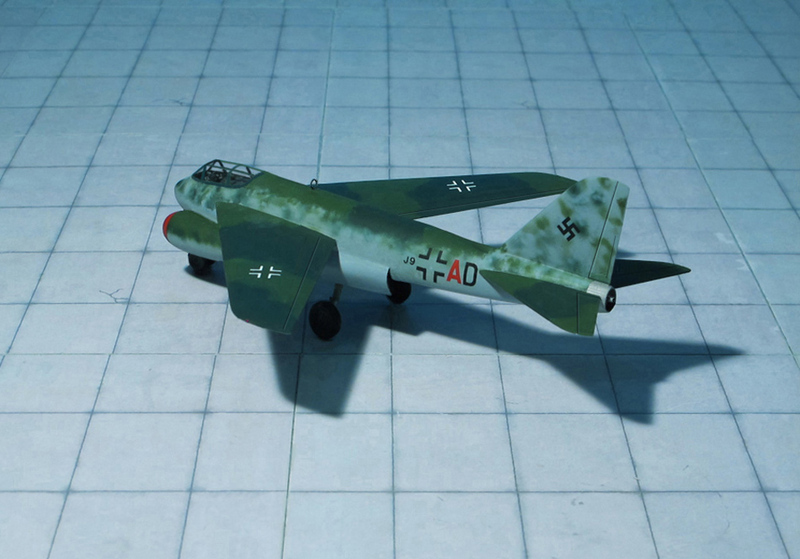 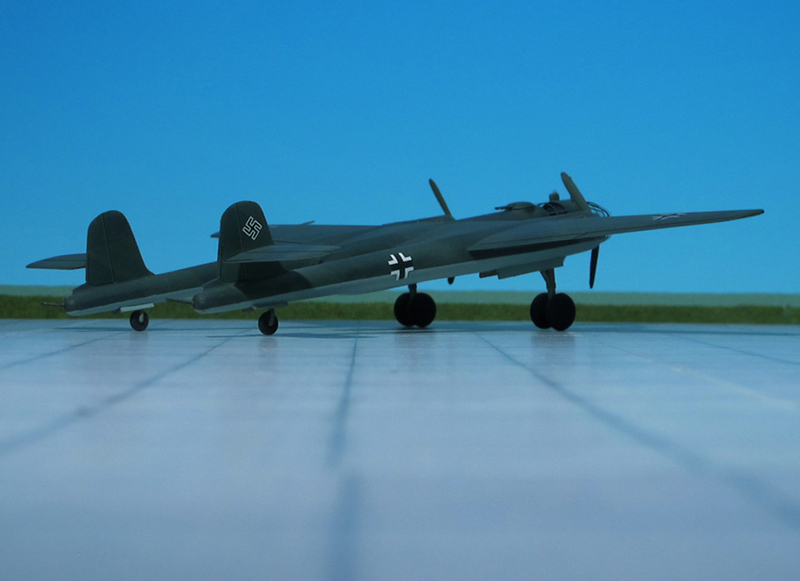 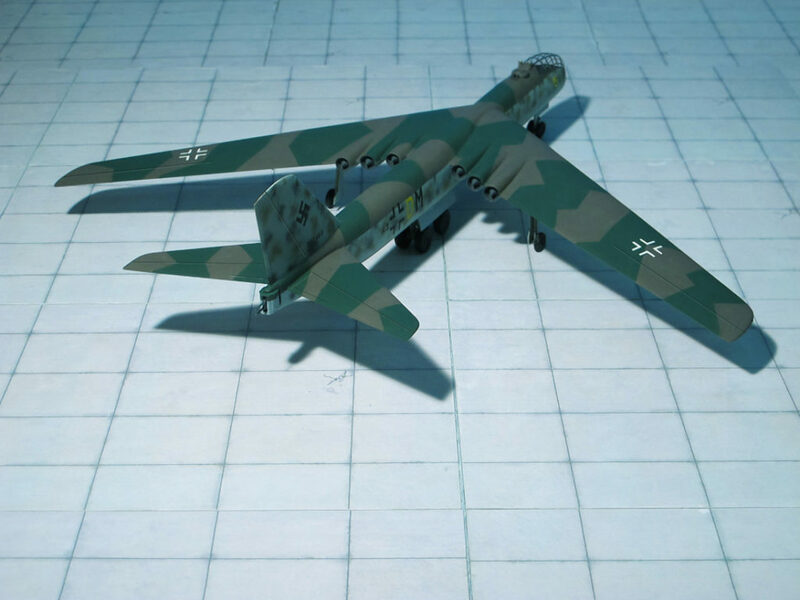 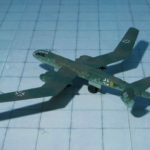 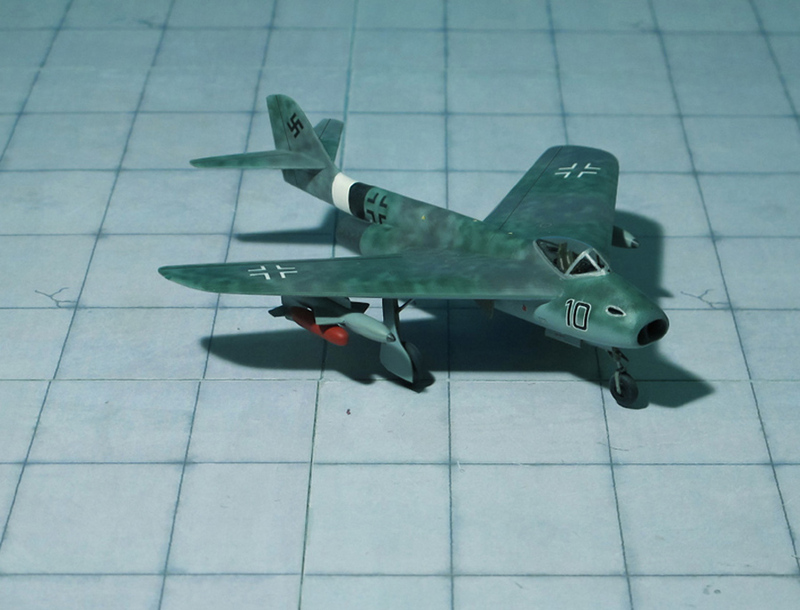 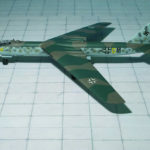 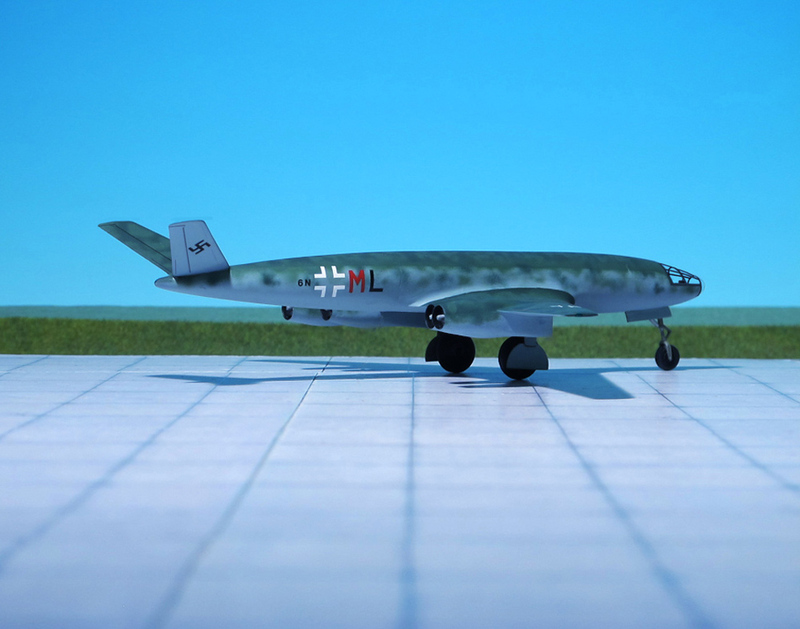 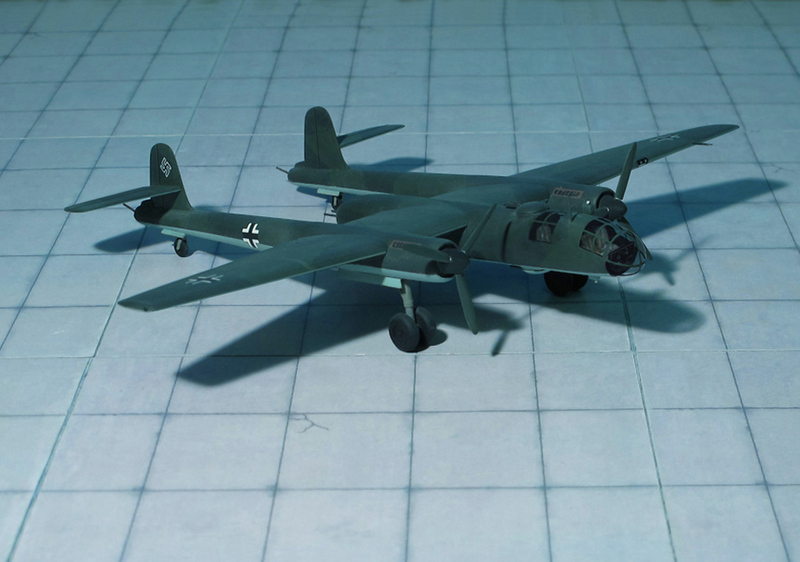 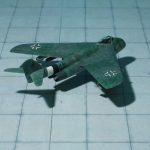 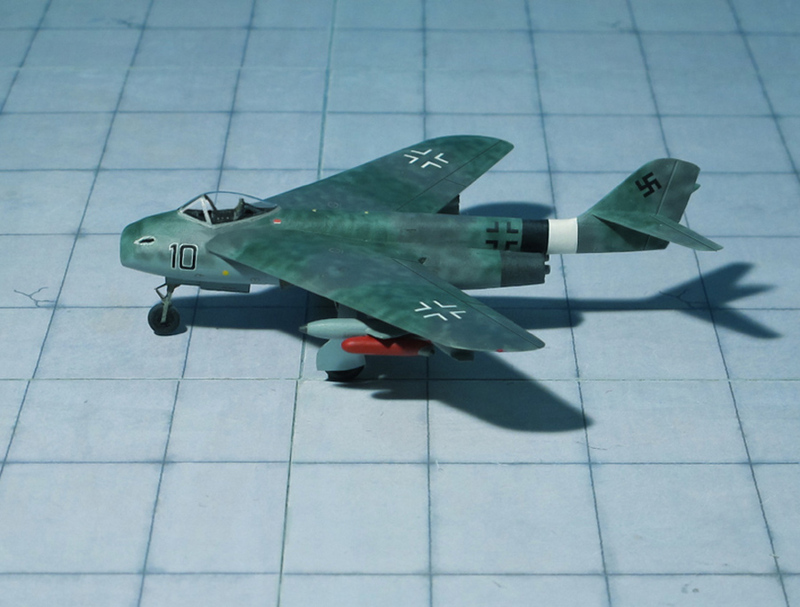 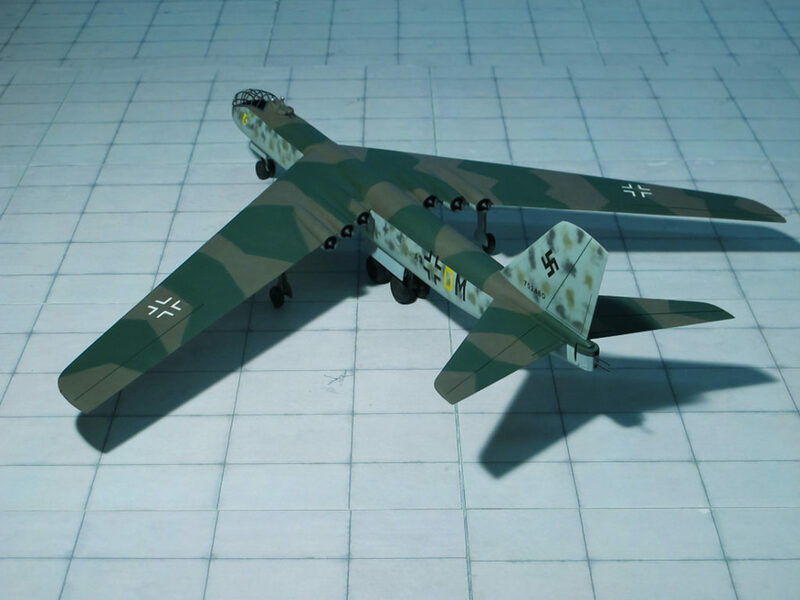 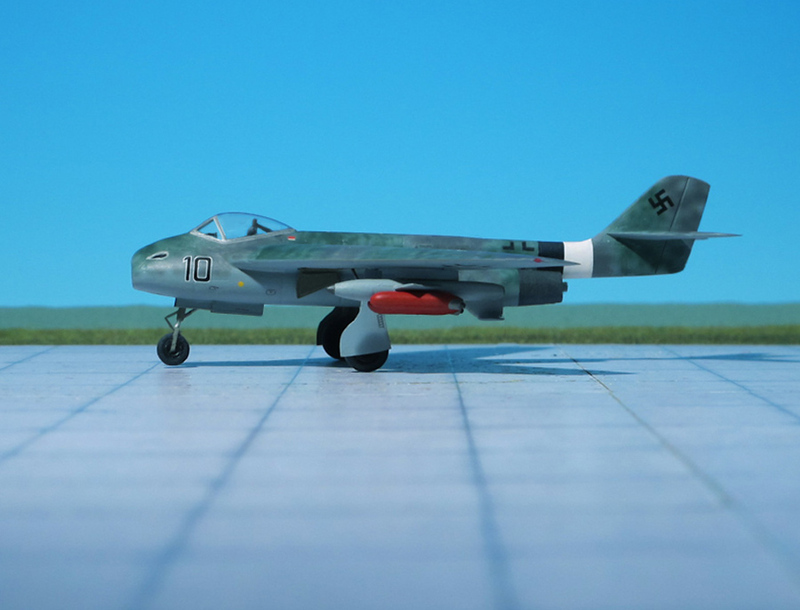 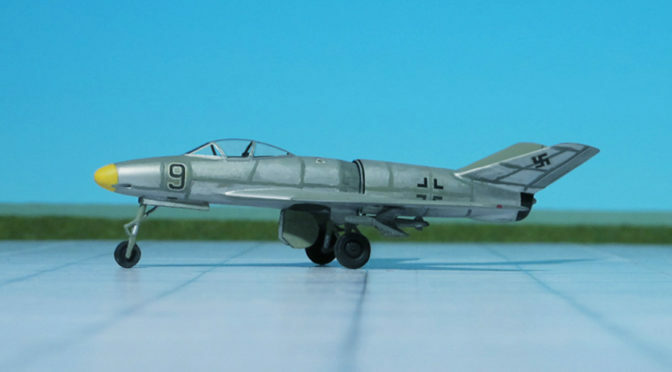 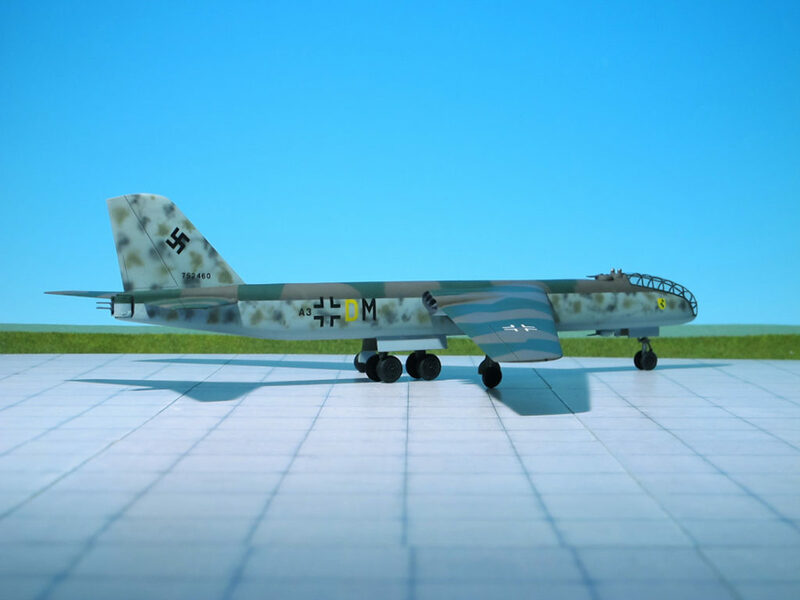 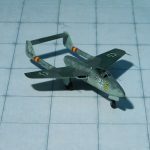 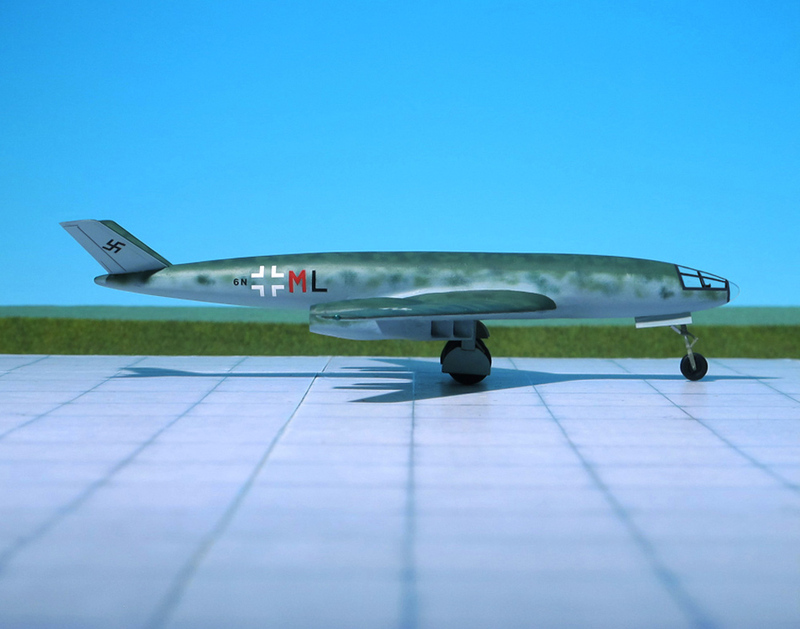 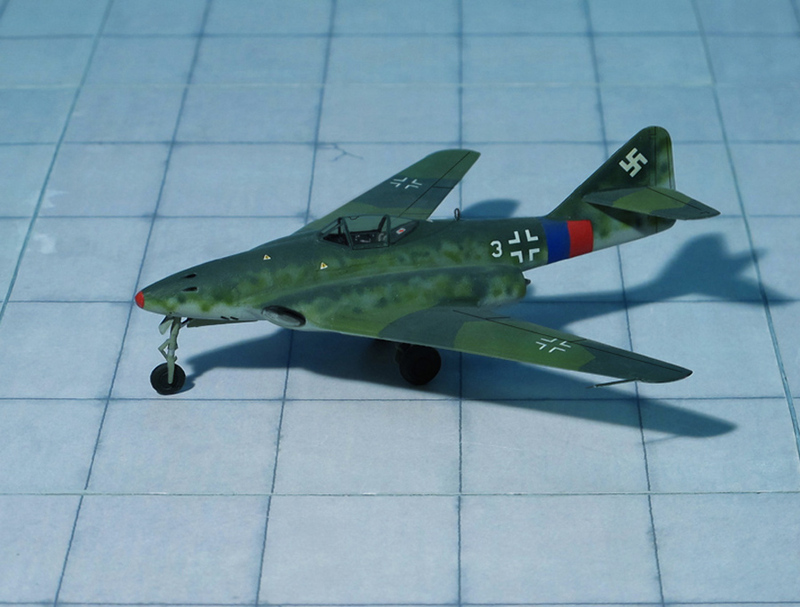 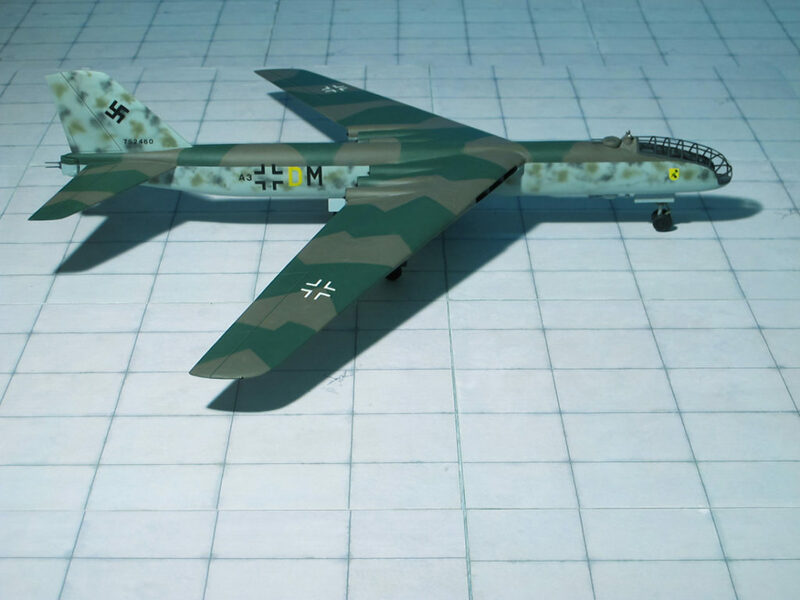 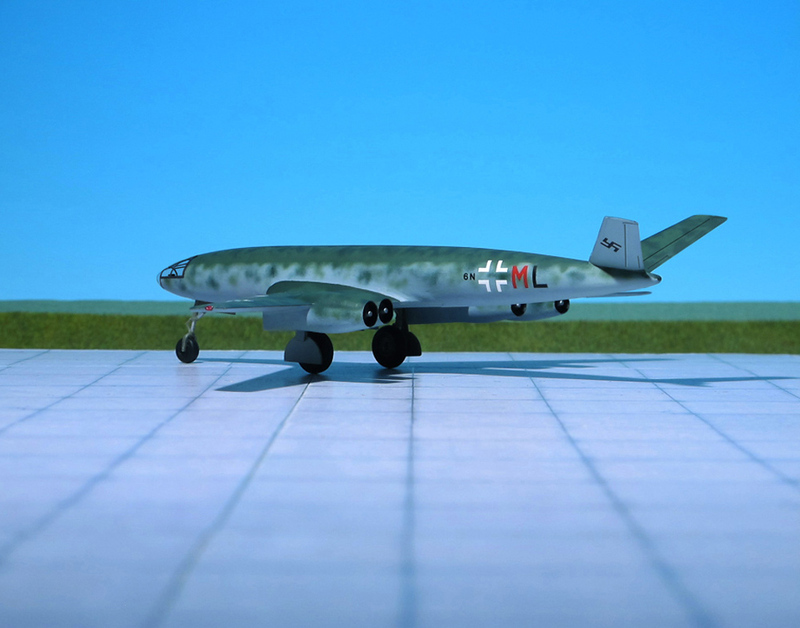 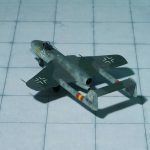 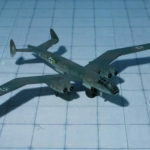 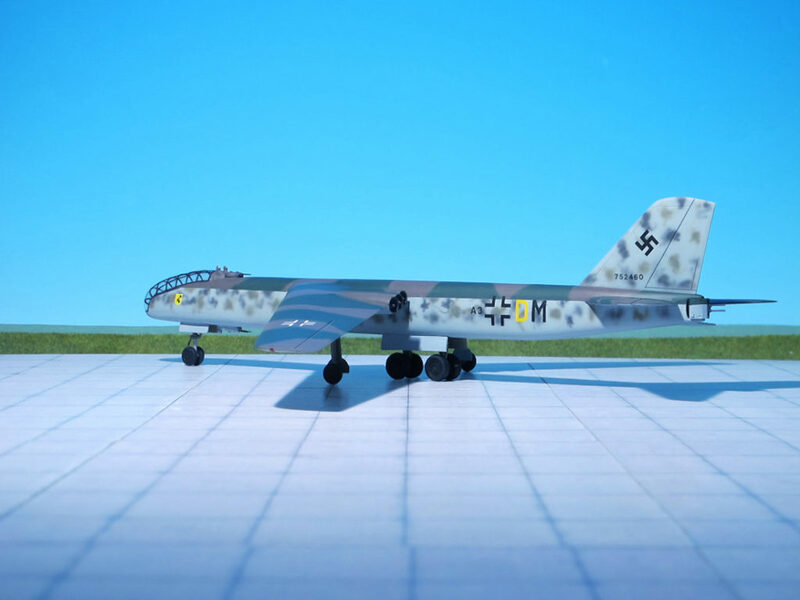 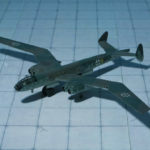 The development stage had progressed far when the Soviets overran the Dessau complex and took possession of all of the Ju 287 and Junkers EF 131 and Junkers EF132 designs and components. 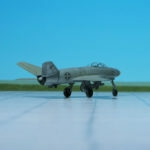 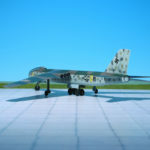 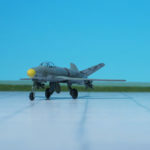 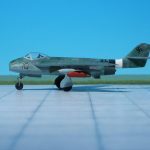 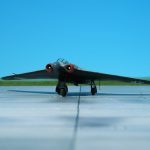 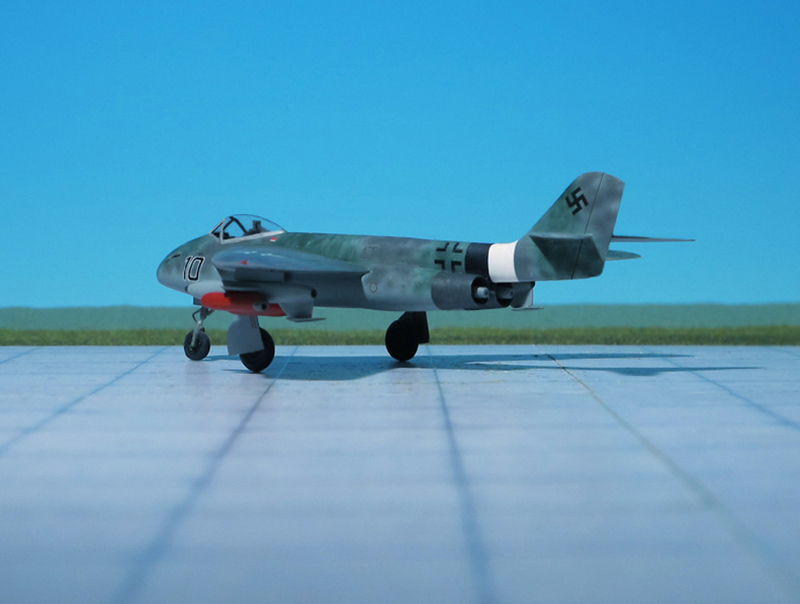 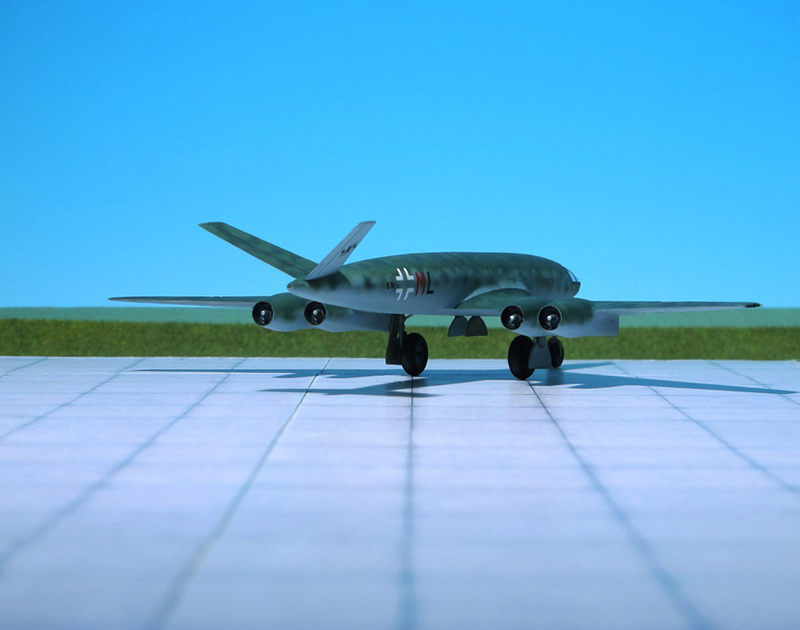 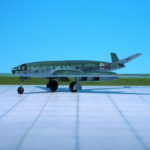 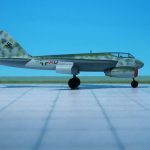 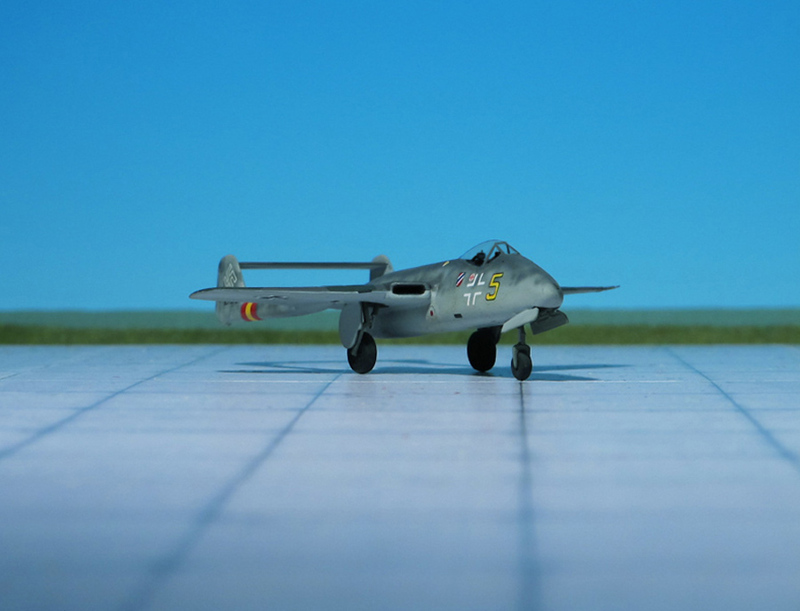 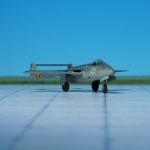 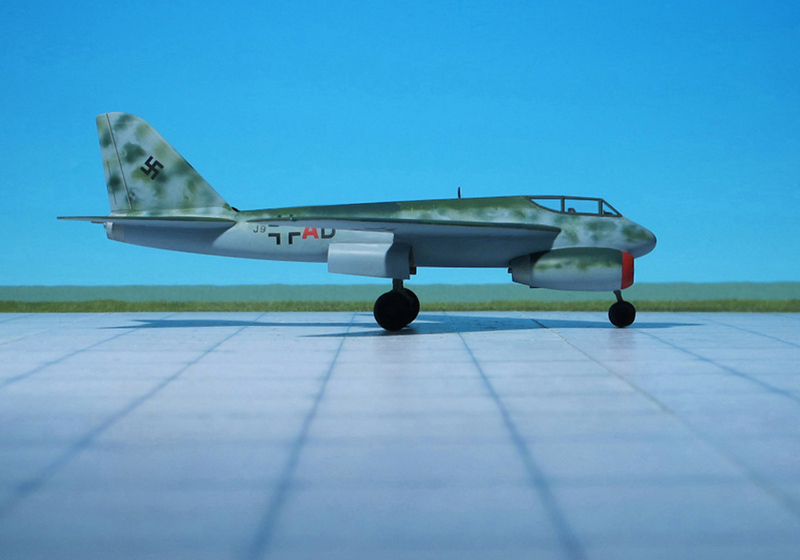 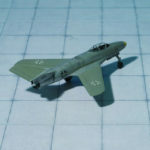 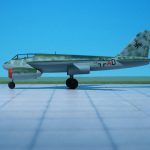 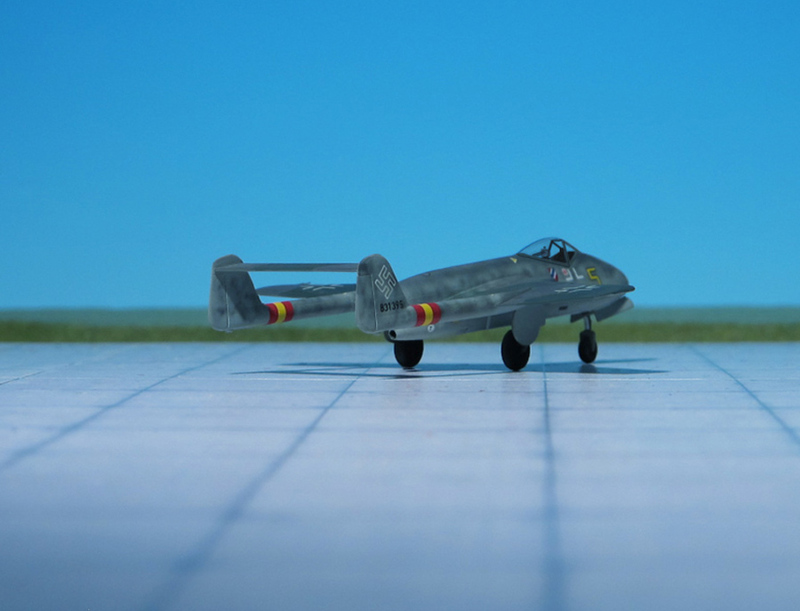 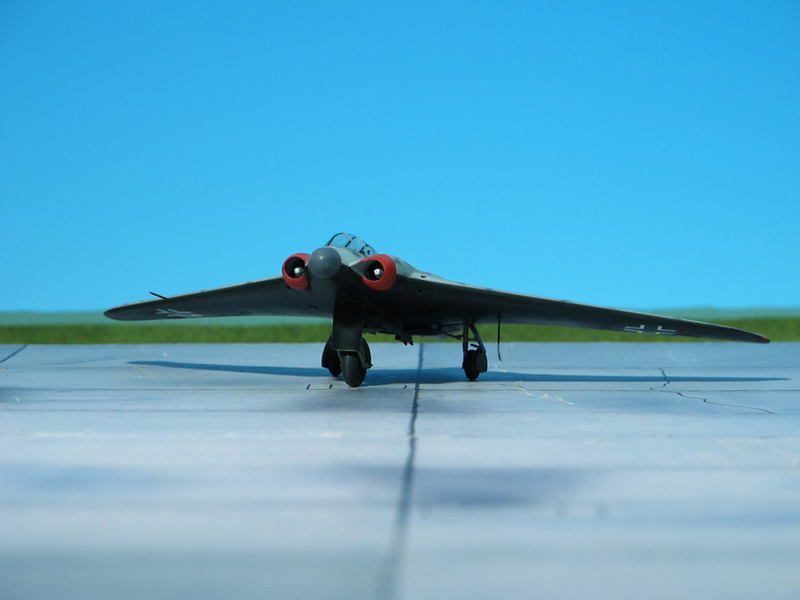 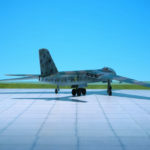 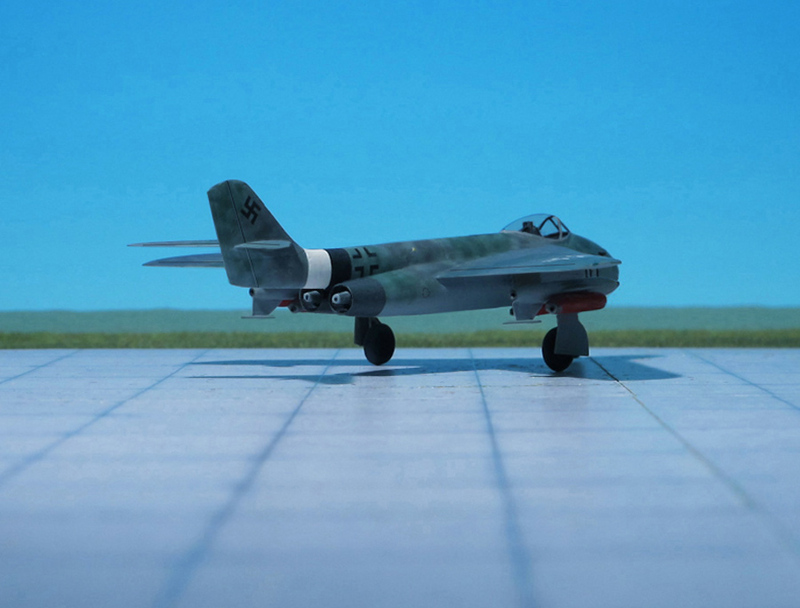 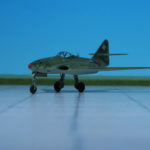 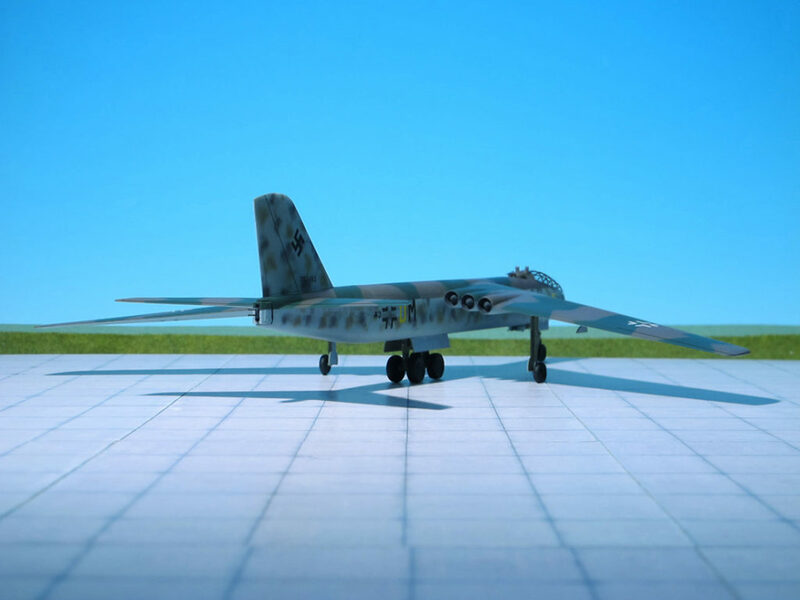 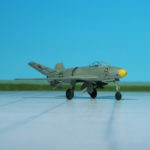 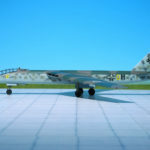 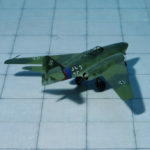 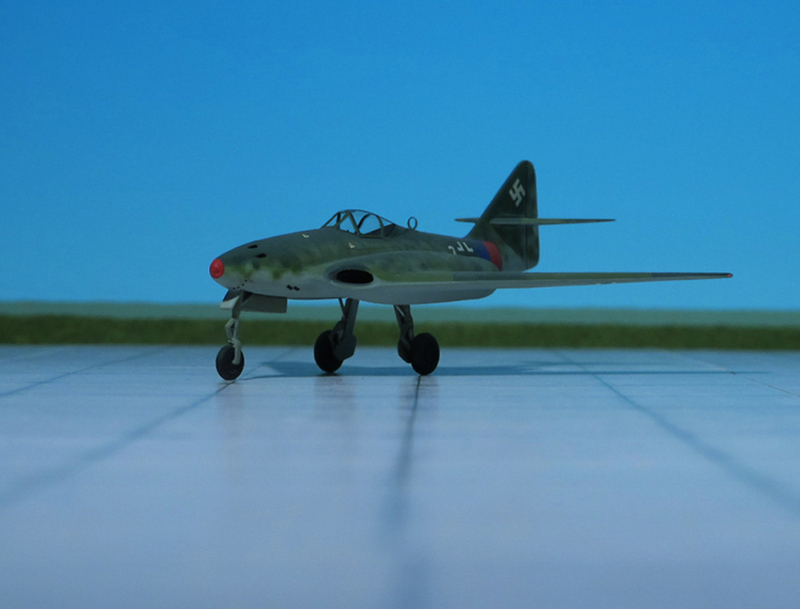 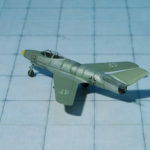 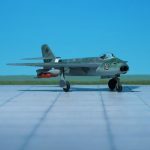 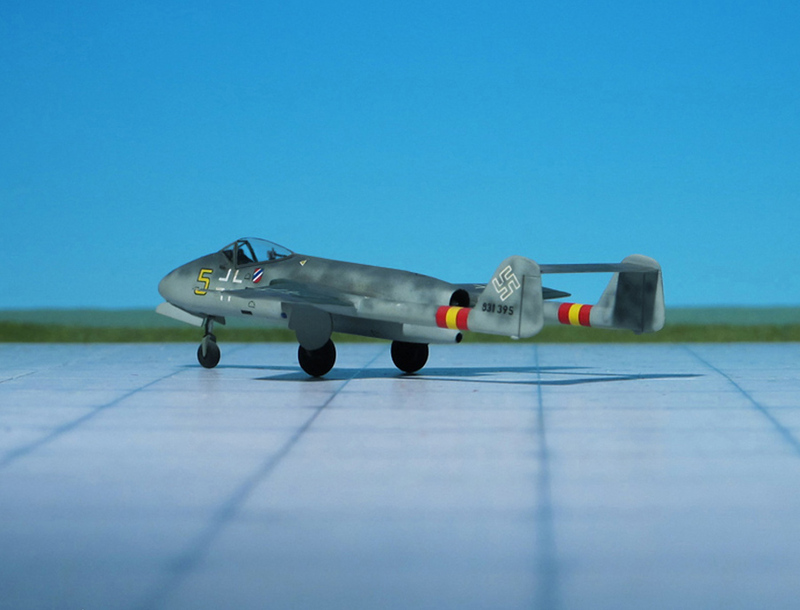 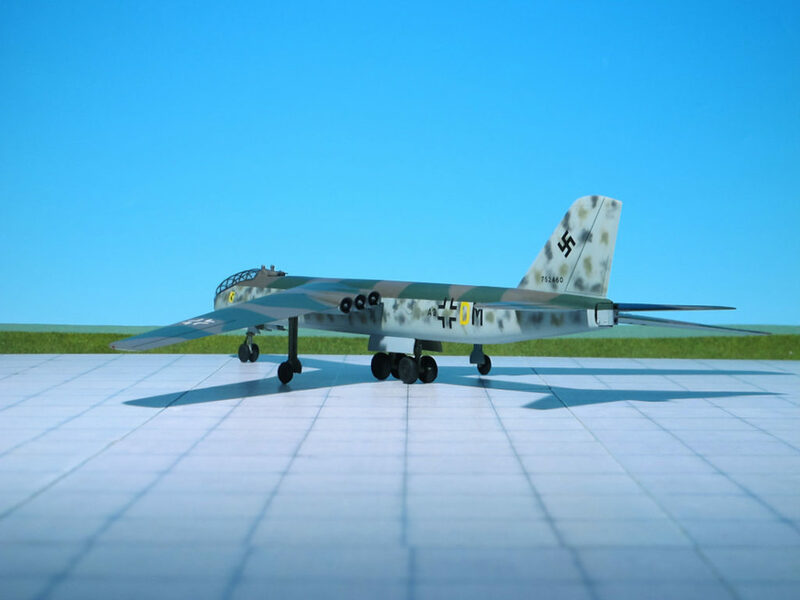 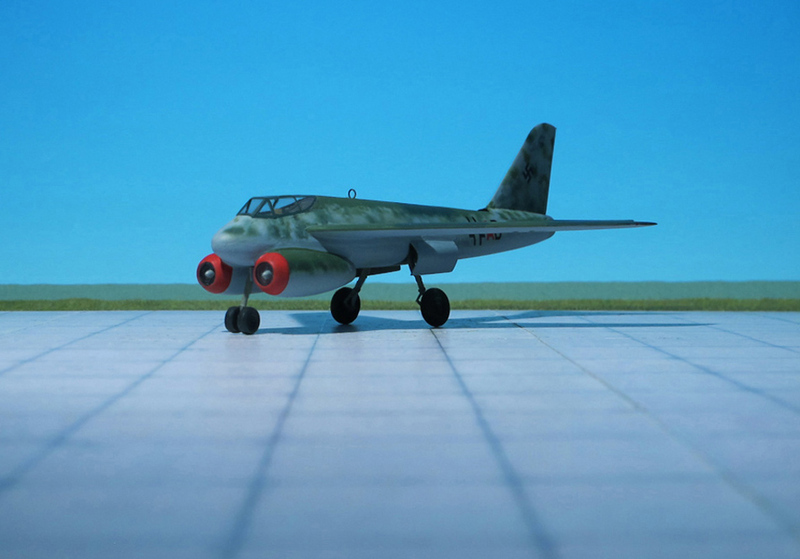 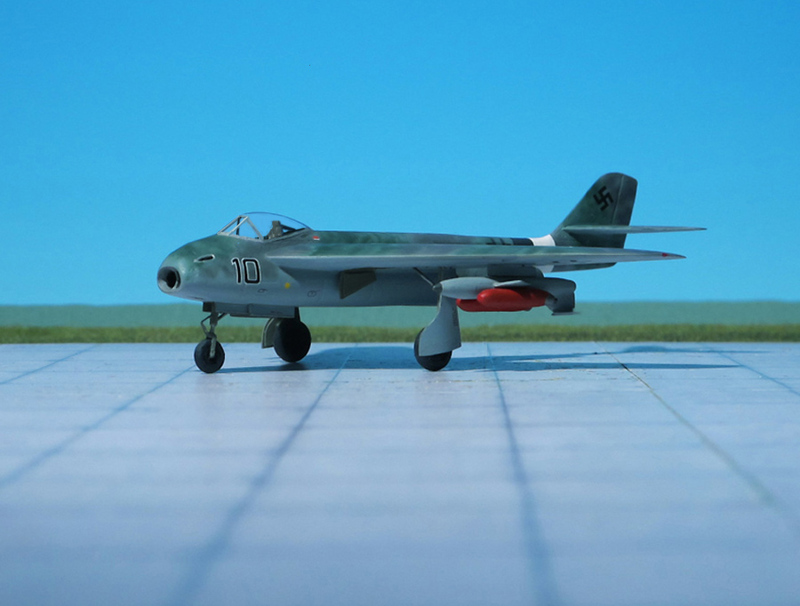 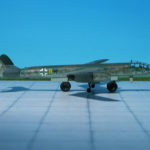 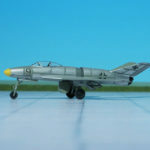 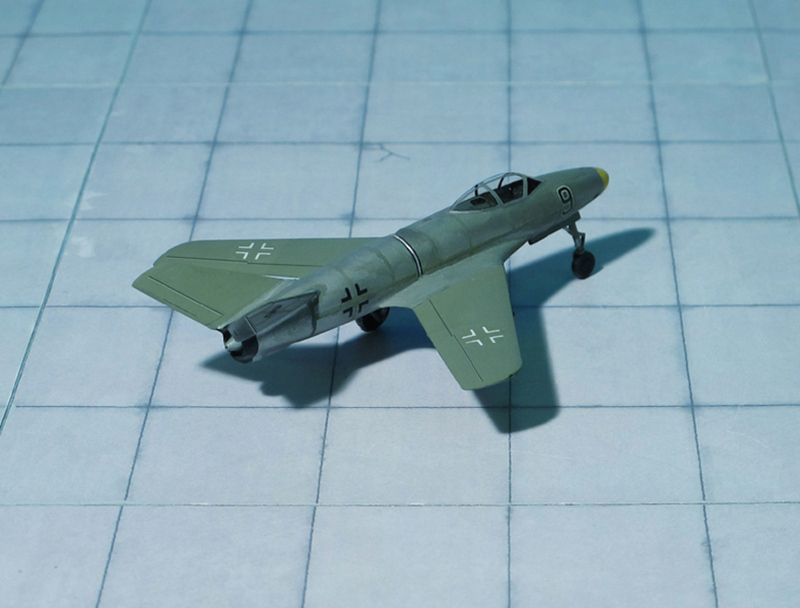 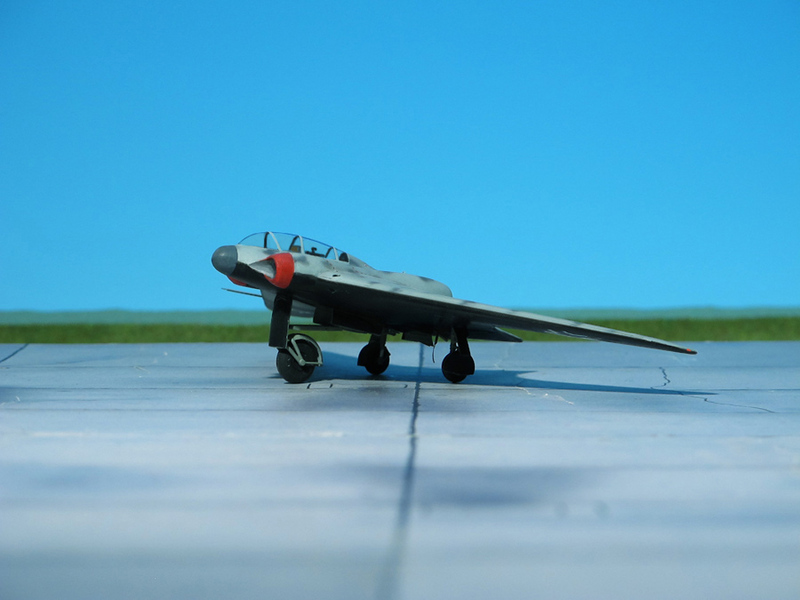 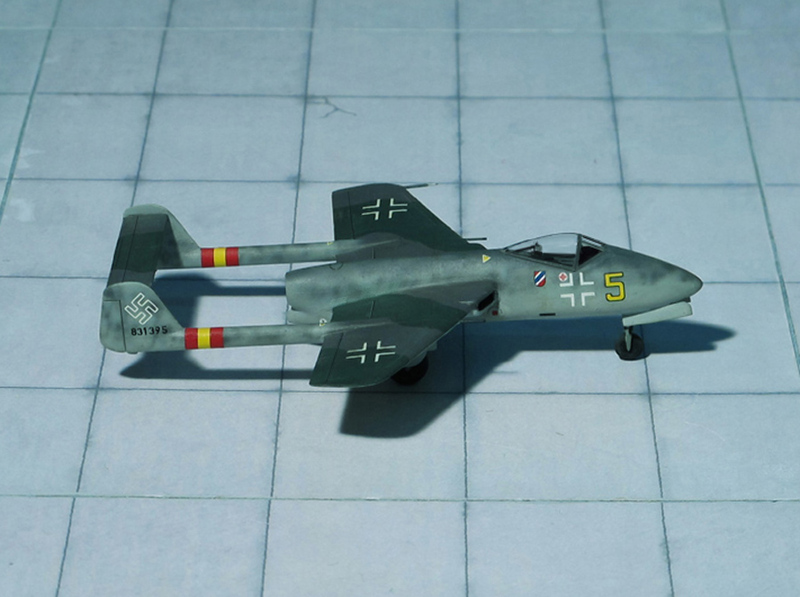 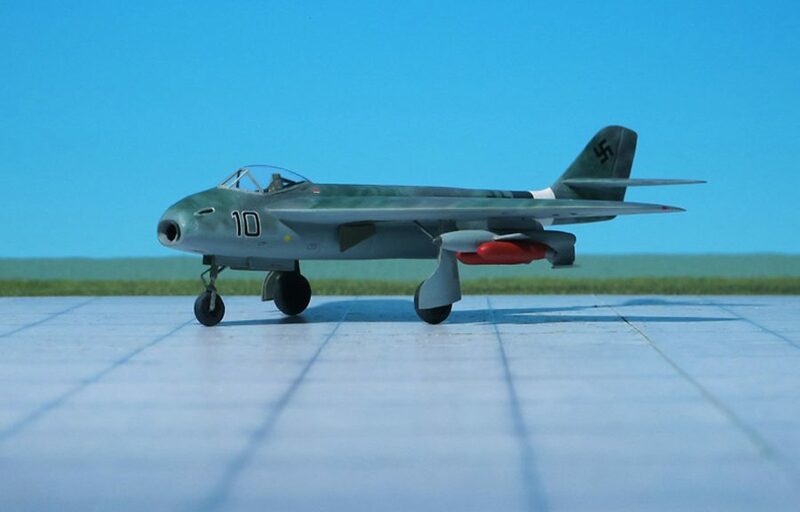 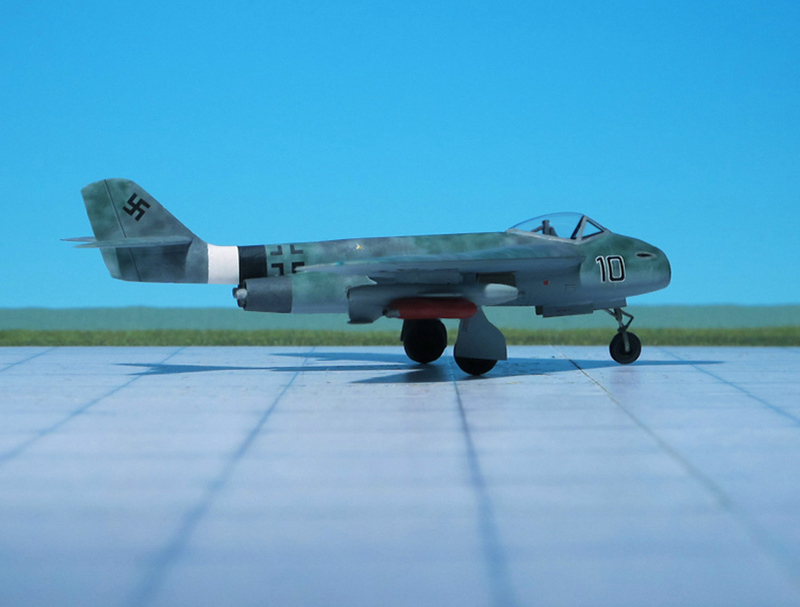 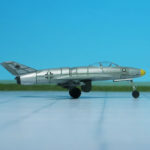 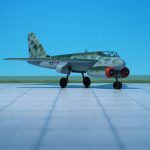 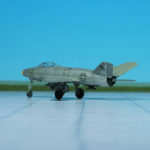 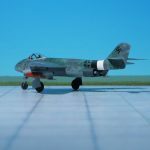 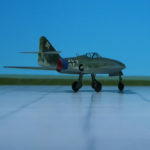 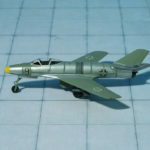 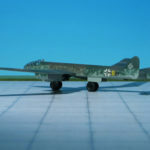 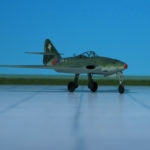 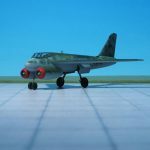 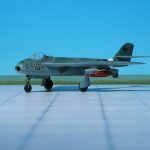 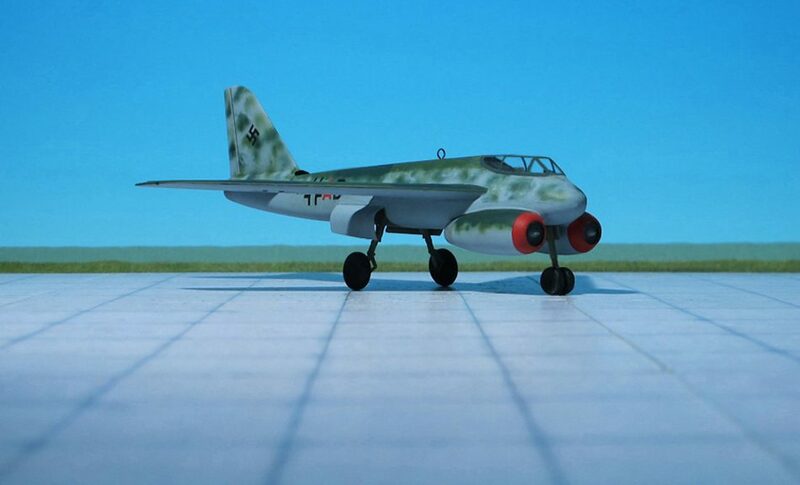 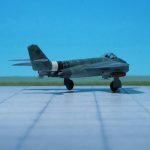 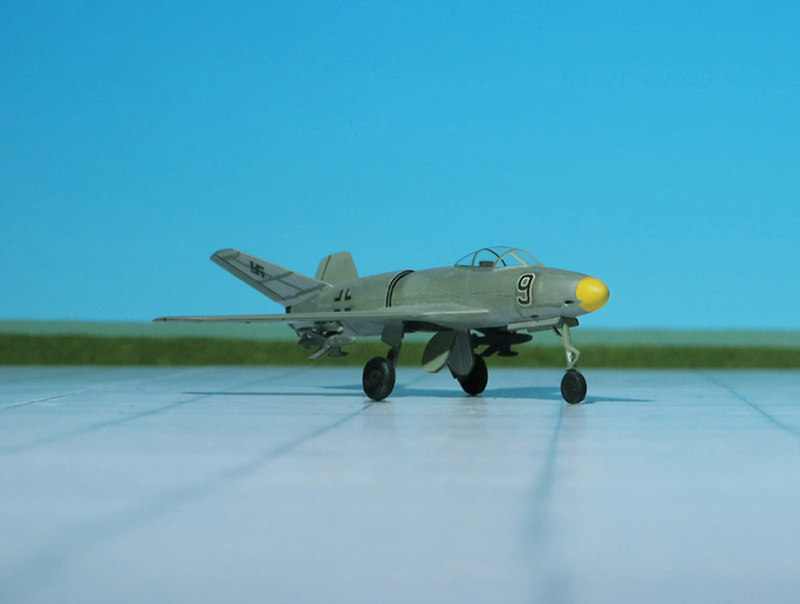 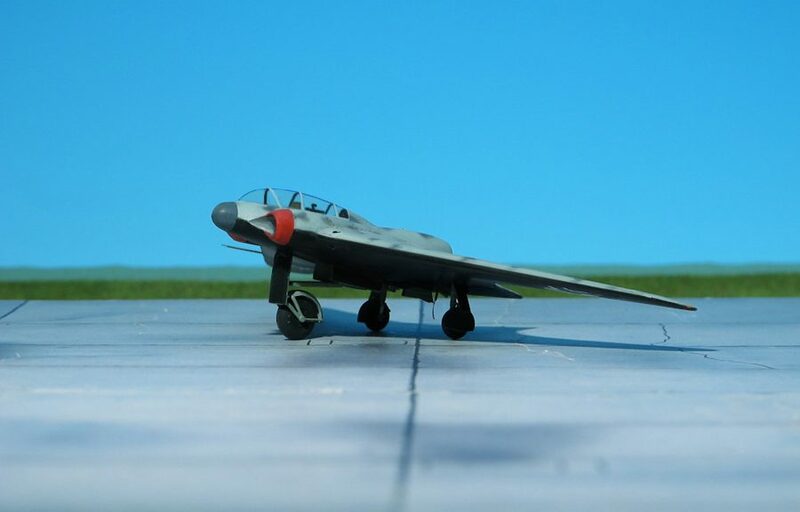 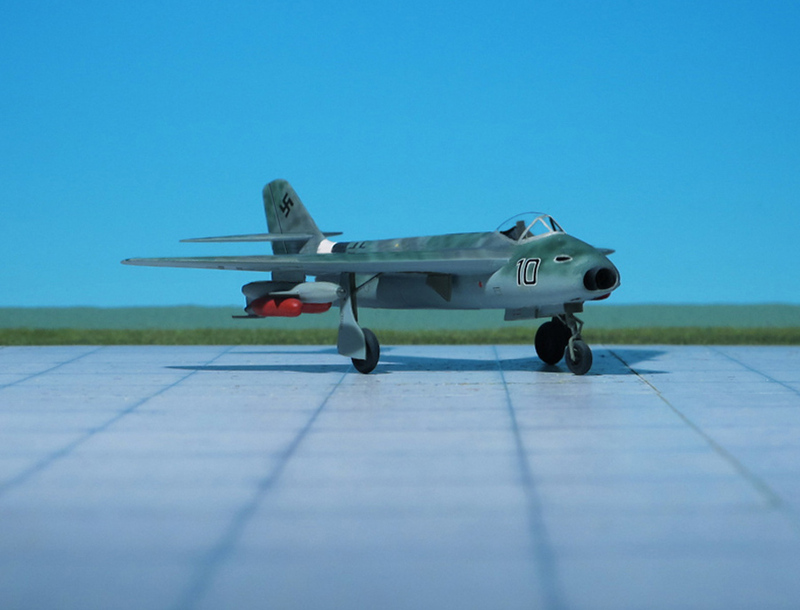 The Soviets gave its approval for the bombed out Junkers Dessau factory to be partially rebuilt, the wind tunnels repaired and the turbojet engine test and manufacturing facilities to be put back into operation. 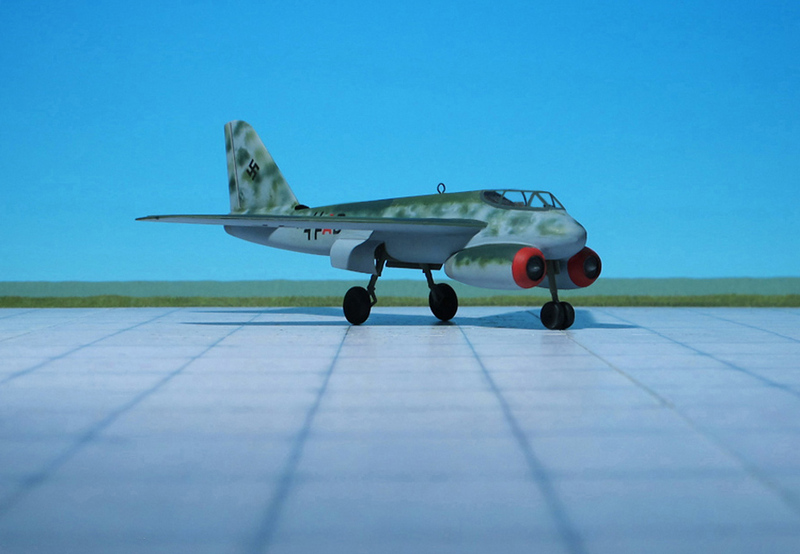 In October 1946, the whole complex and the German engineers were transferred to GOZ No.1 (Gosoodarstvenny Opytnyy Zavod, State Experimental Plant), at Dubna in the Soviet Union, to continue development of the EF 131 and EF 132. 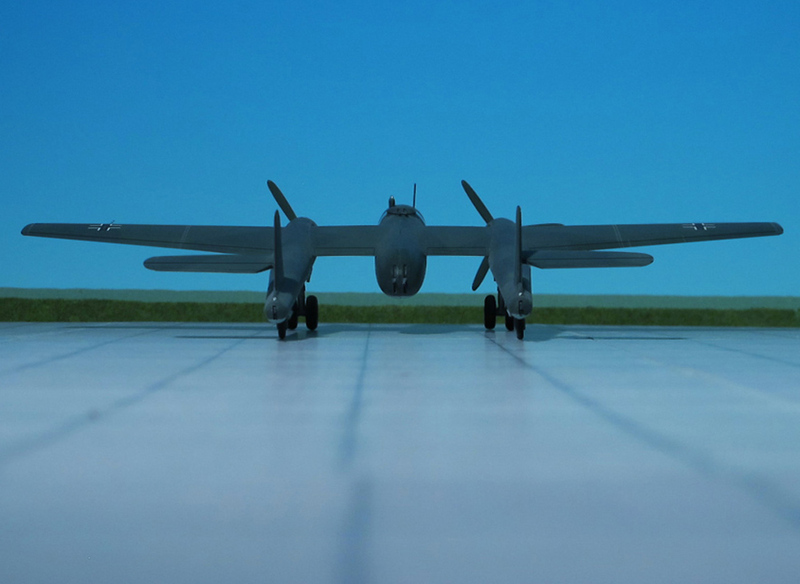 Design work on the EF 132 continued under Dr. B. Baade at OKB-1 (the design bureau attached to GOZ No.1), under order of Council of Ministers (COM) directive No.874-266, an unpowered example was constructed to gather additional data, but only slow progress was made before the project was terminated on June 1948, by COM directive 2058-805 (Ref. 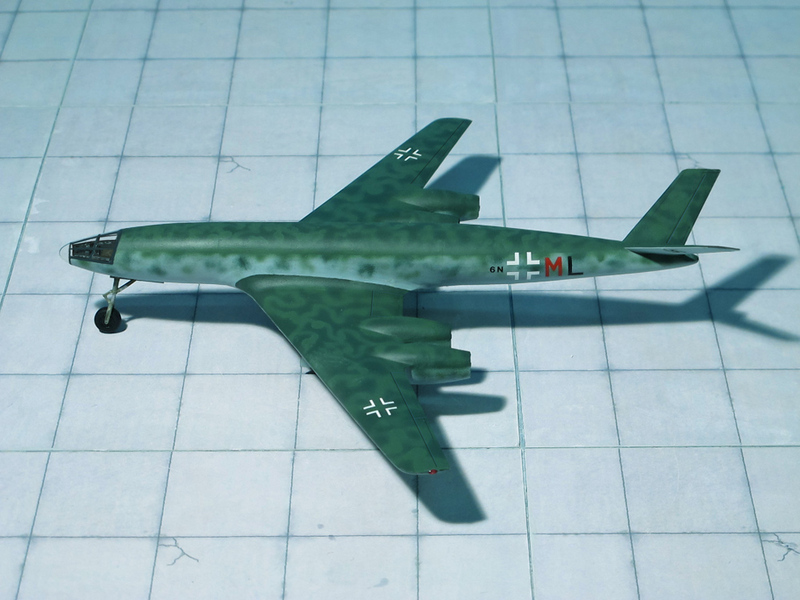 : 17. 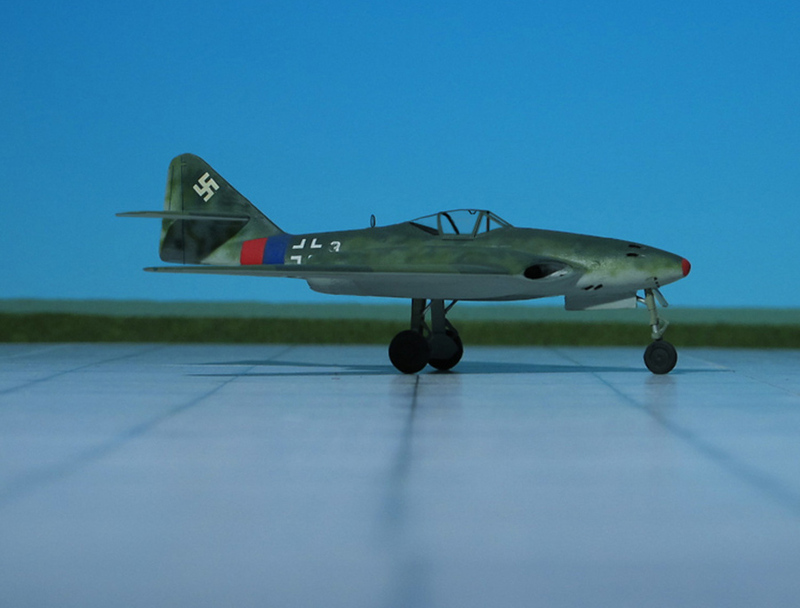 24).